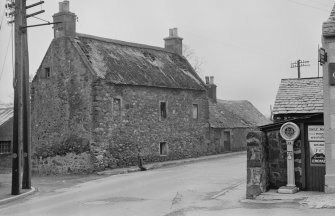 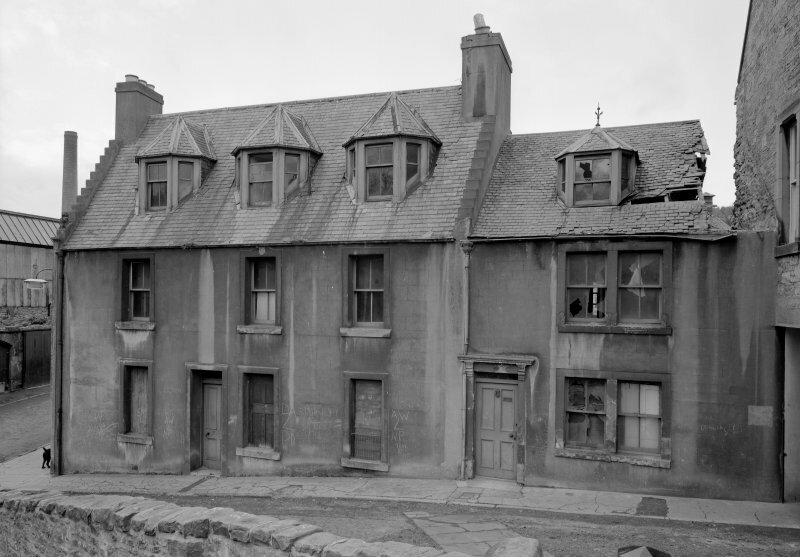 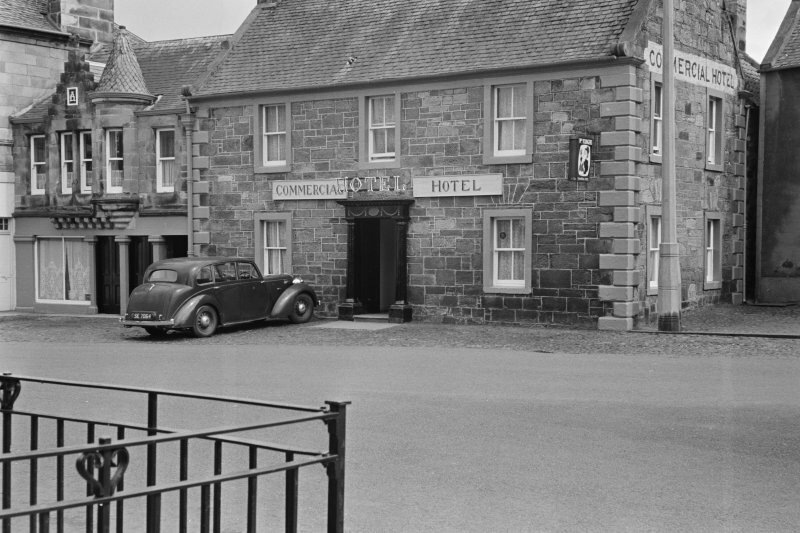 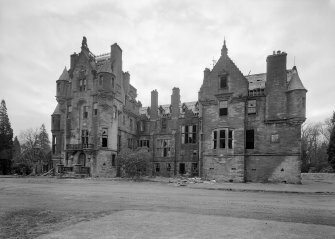 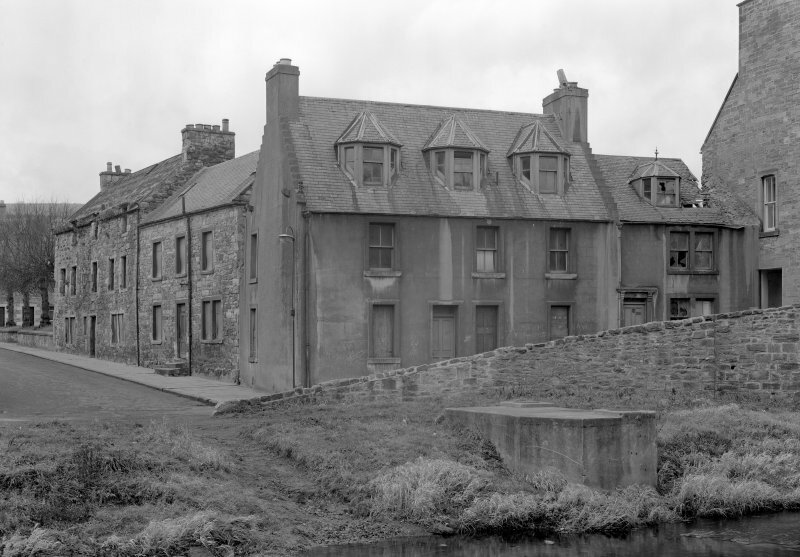 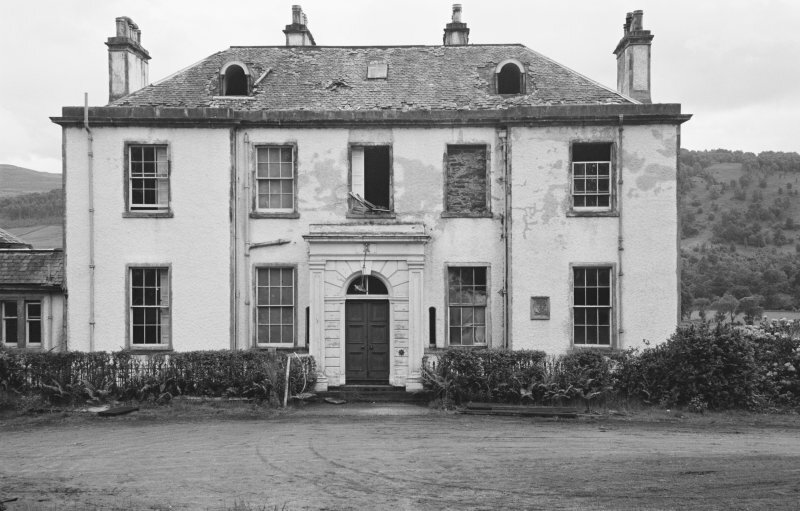 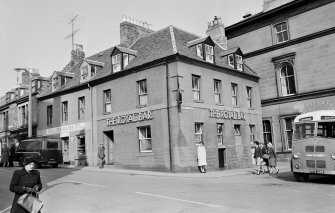 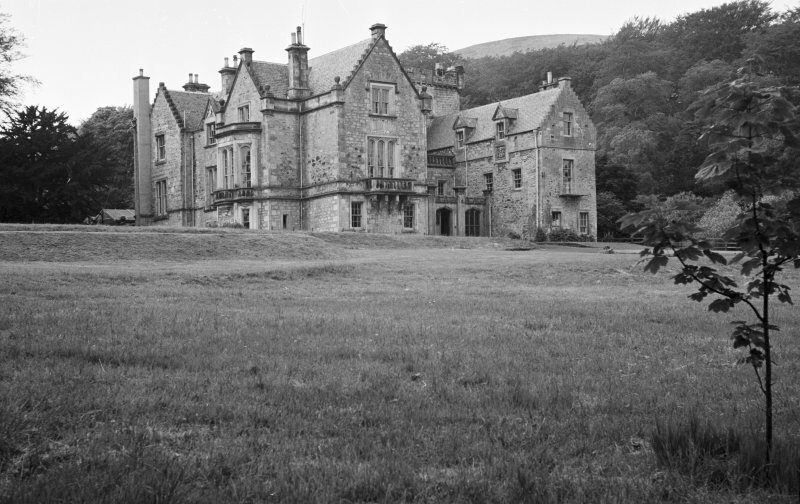 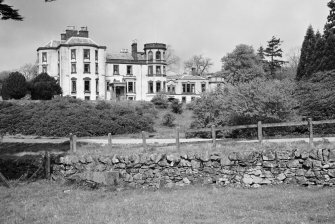 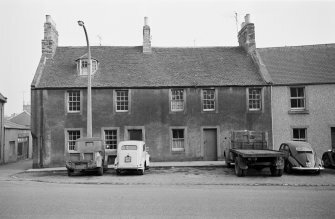 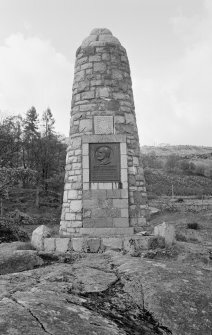 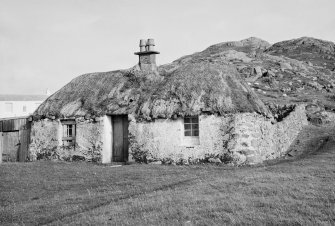 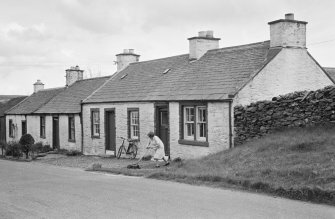 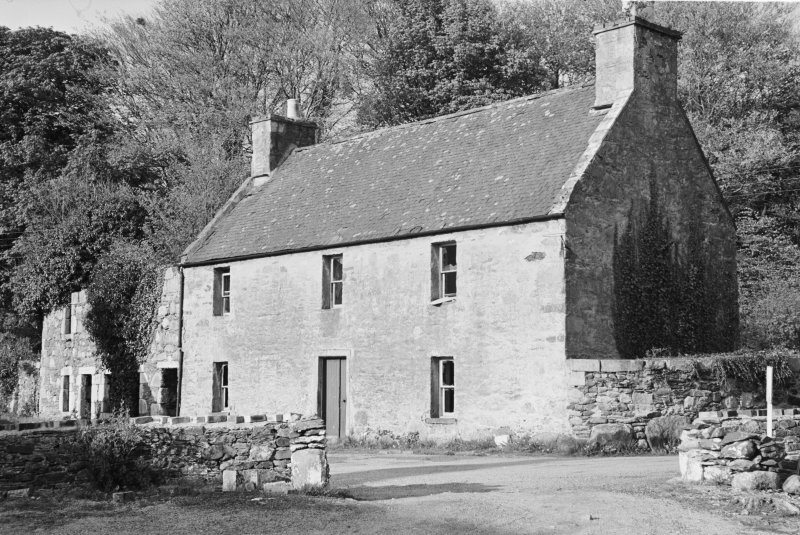 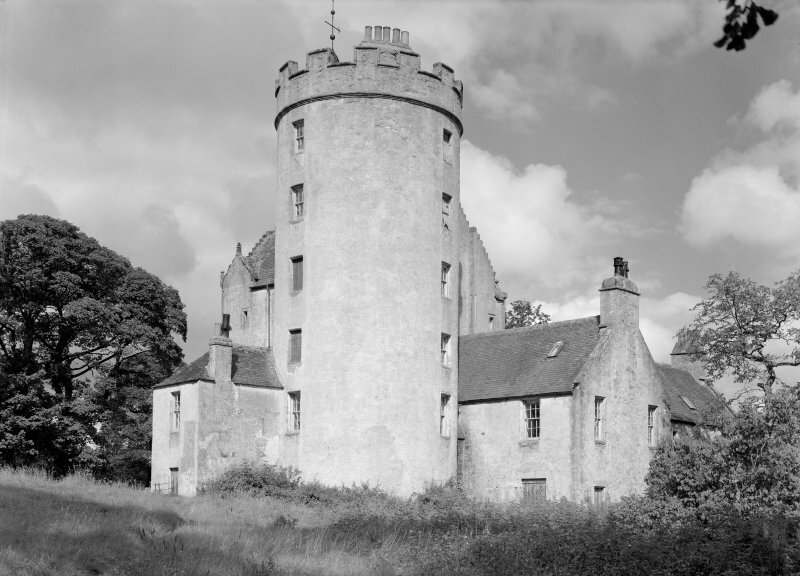 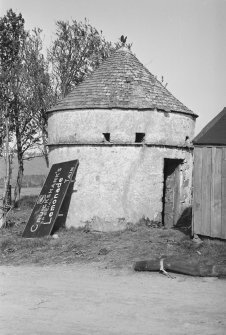 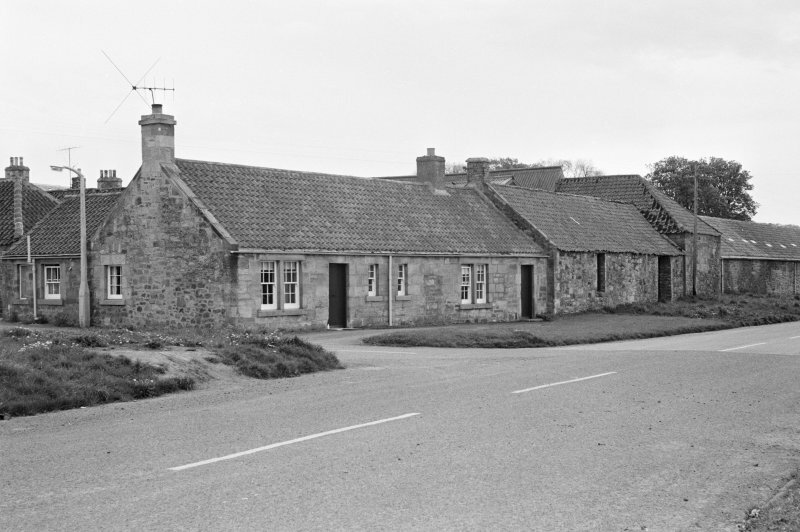 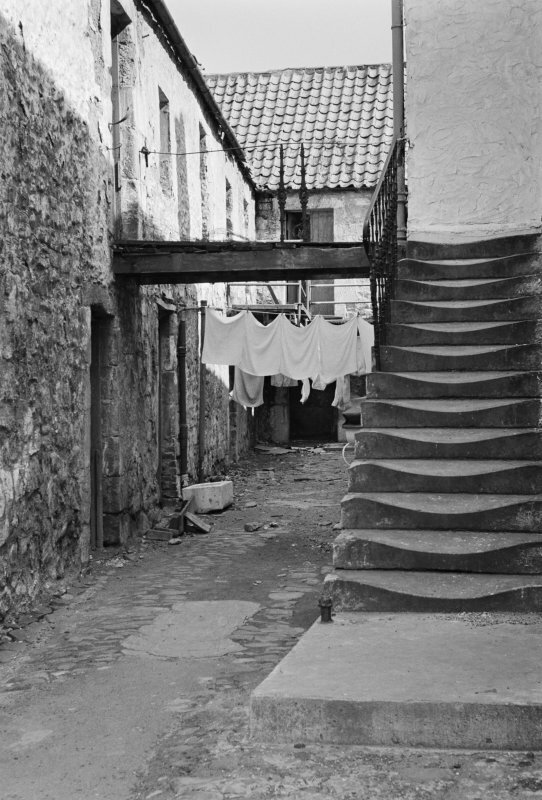 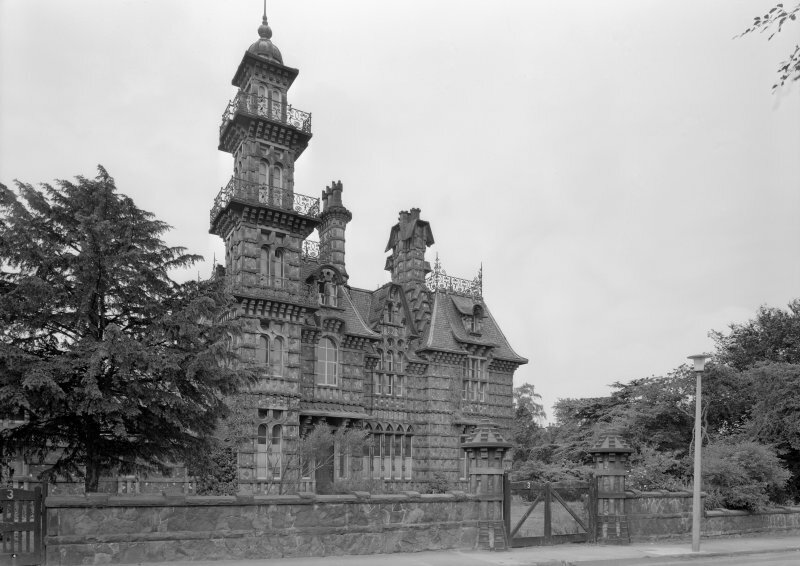 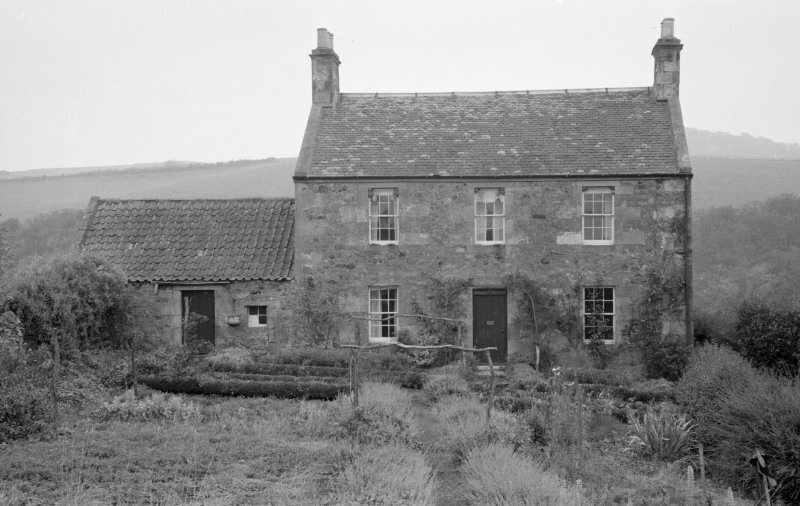 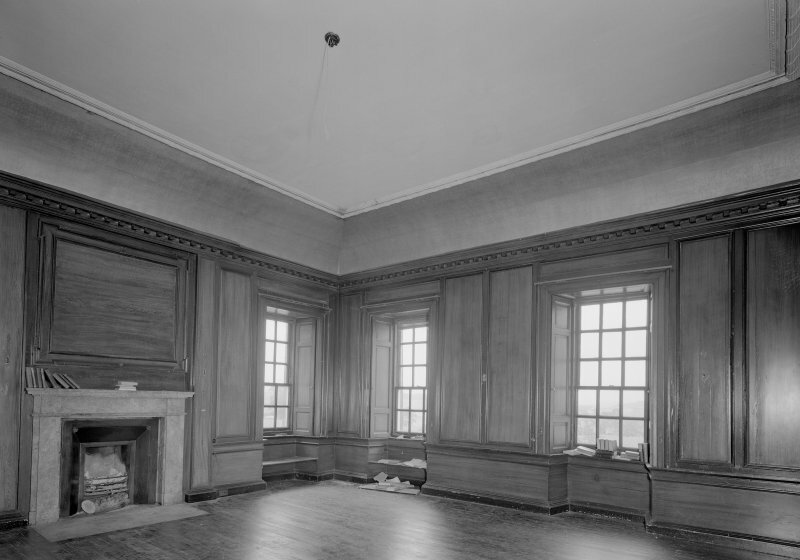 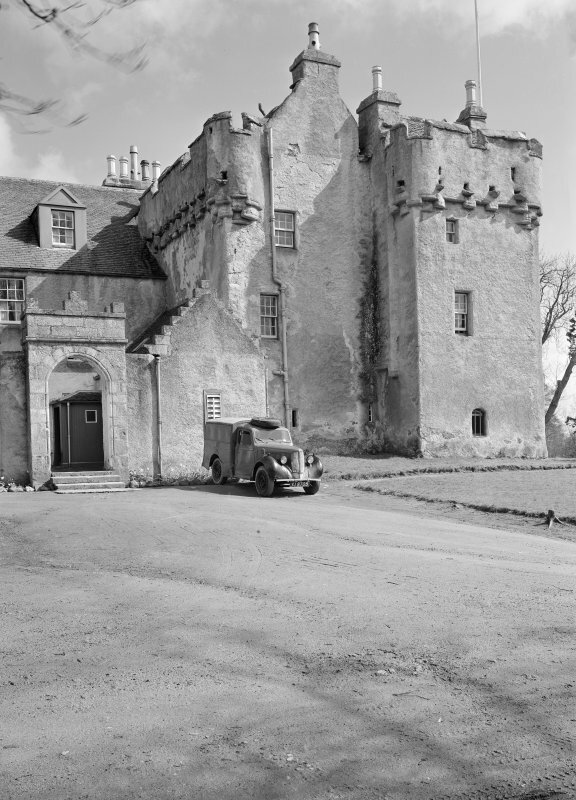 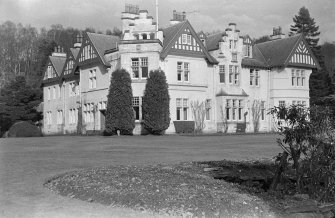 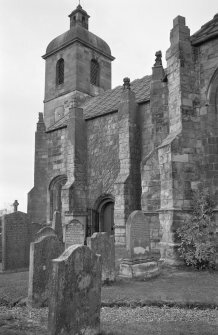 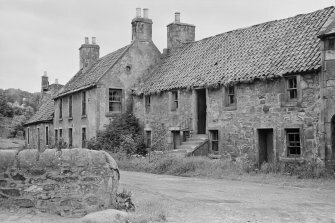 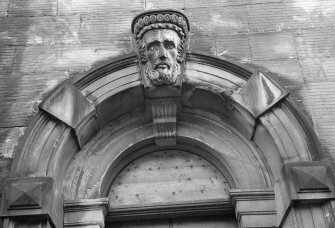 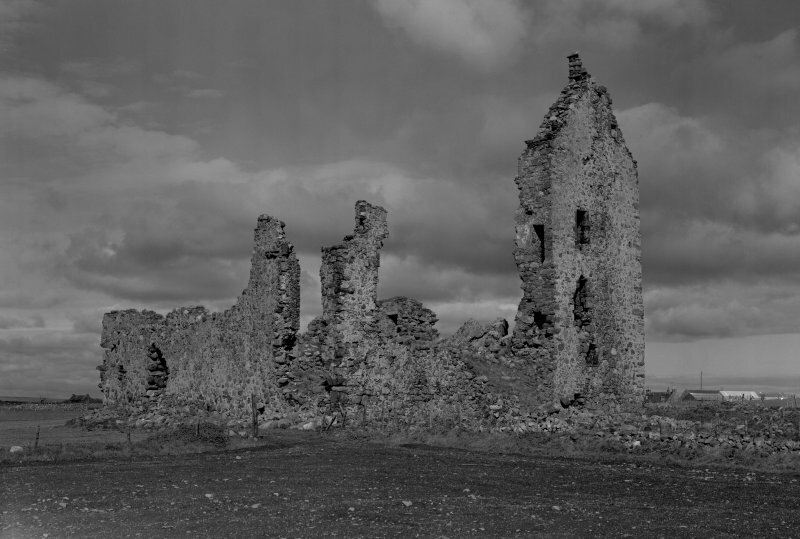 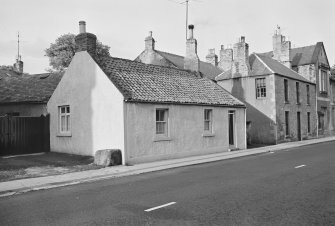 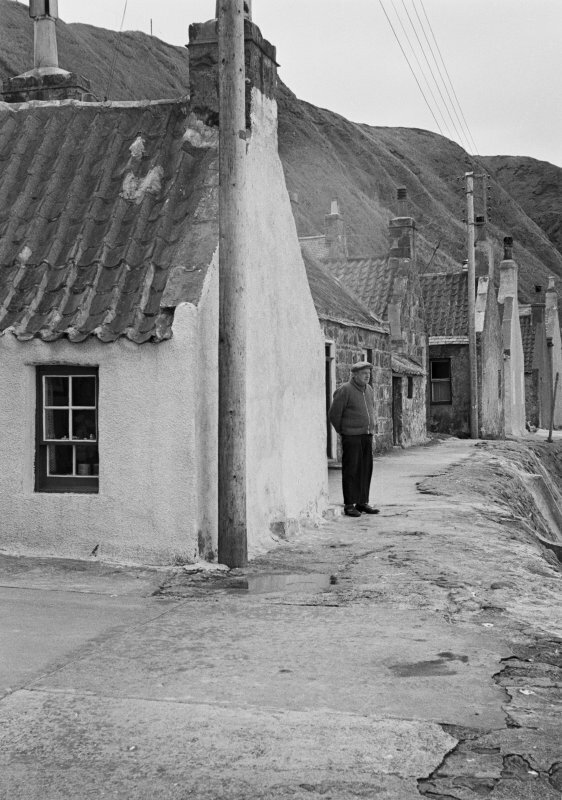 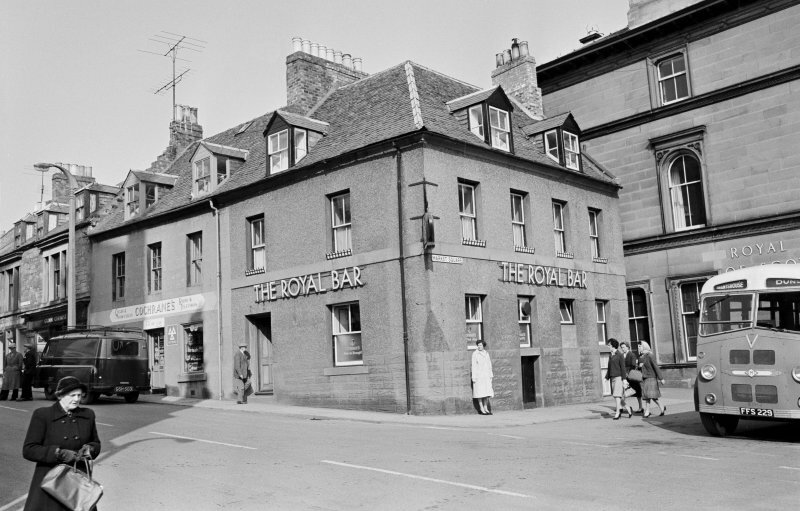 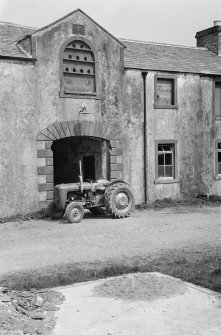 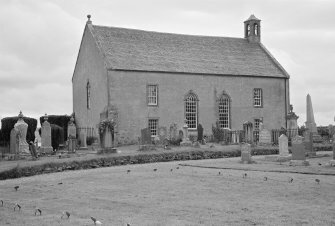 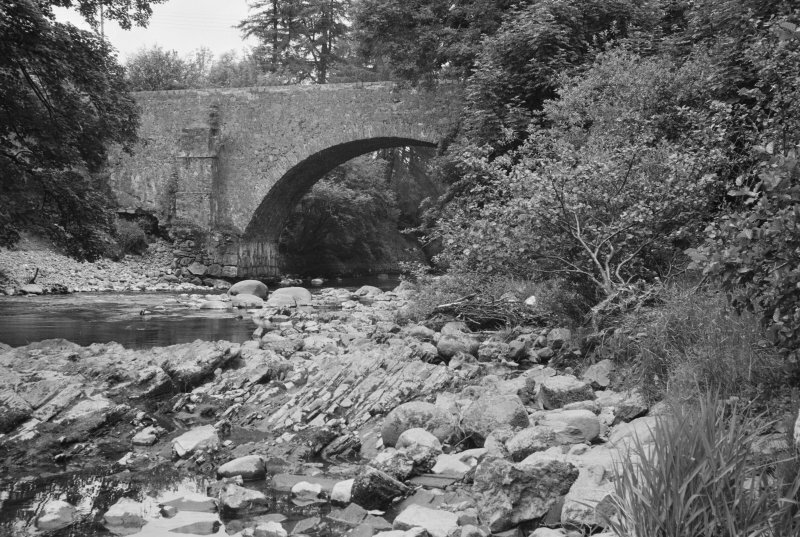 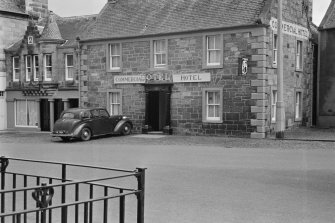 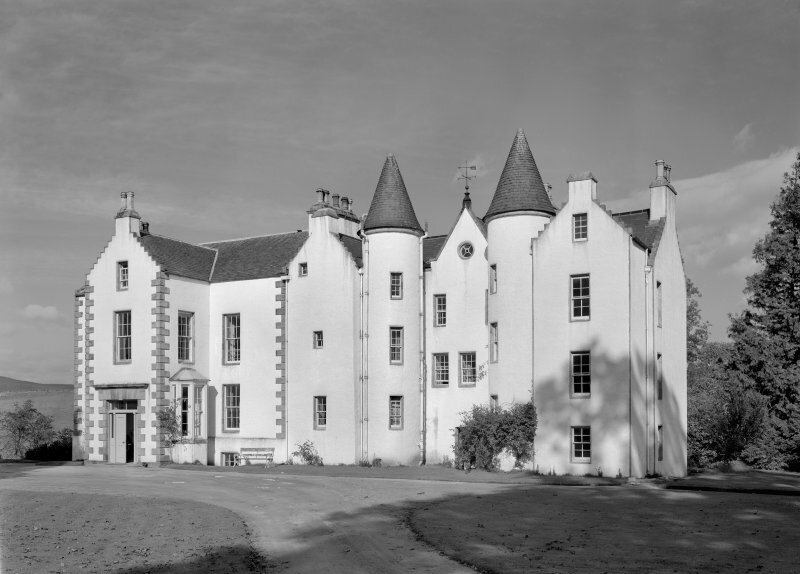 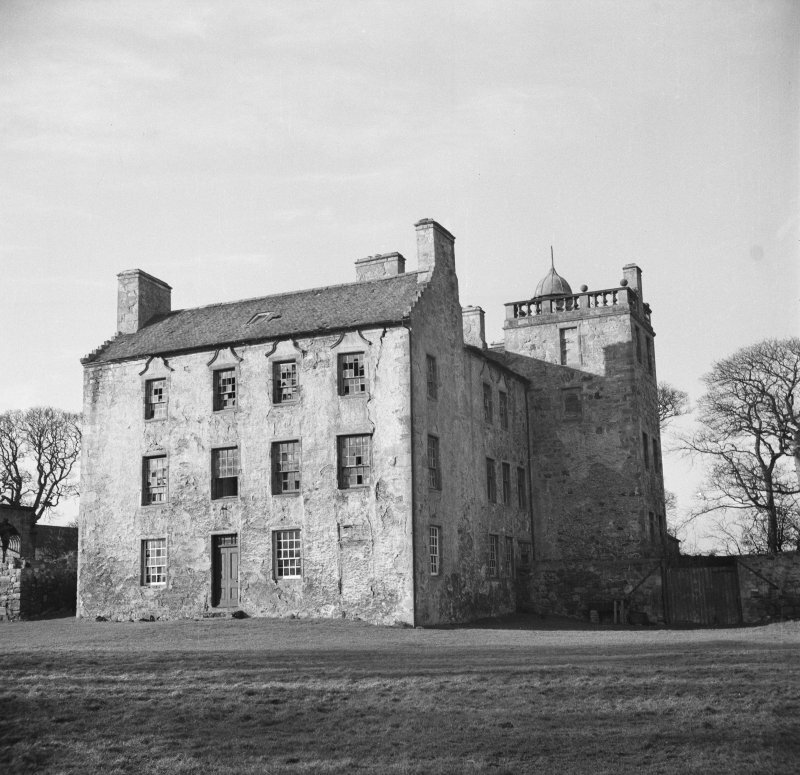 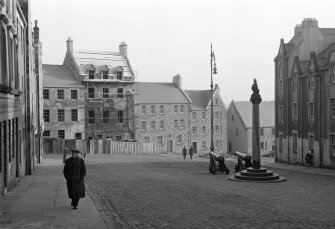 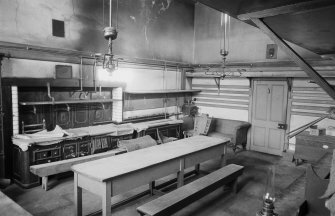 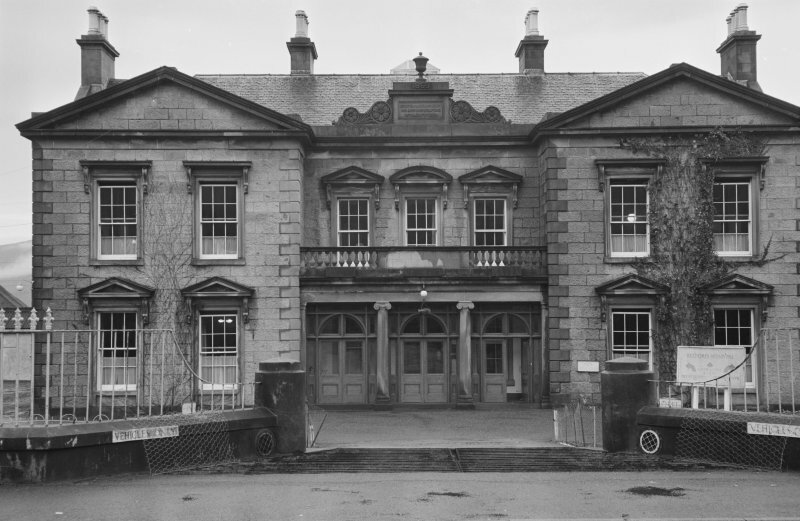 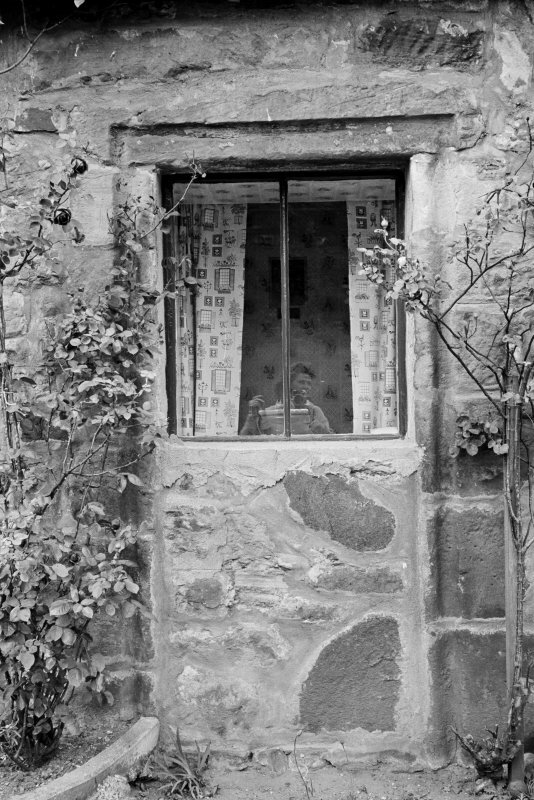 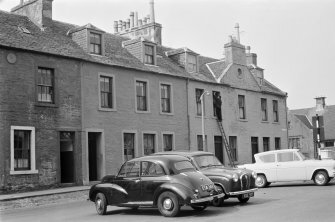 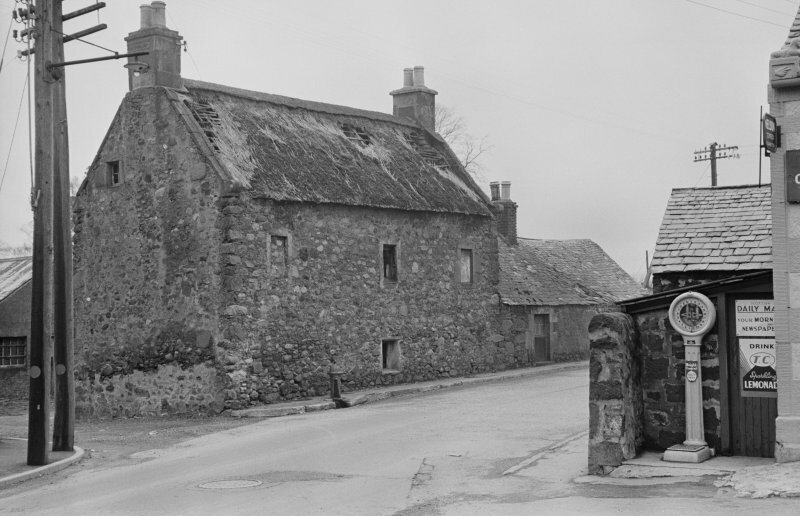 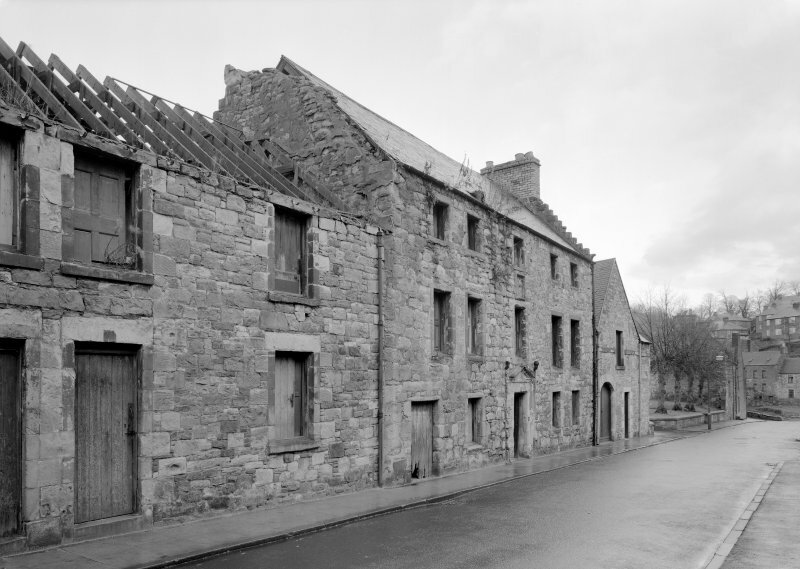 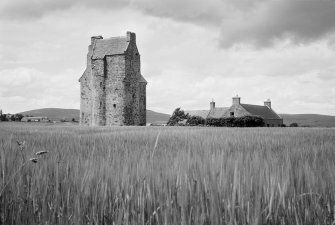 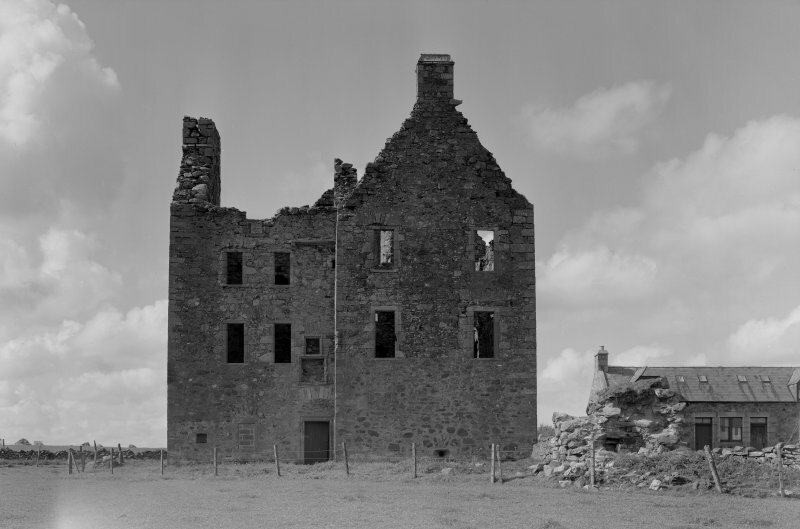 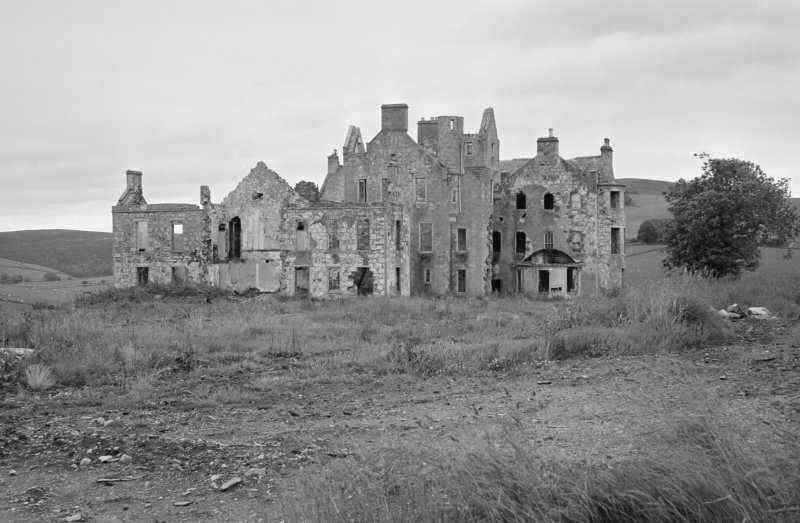 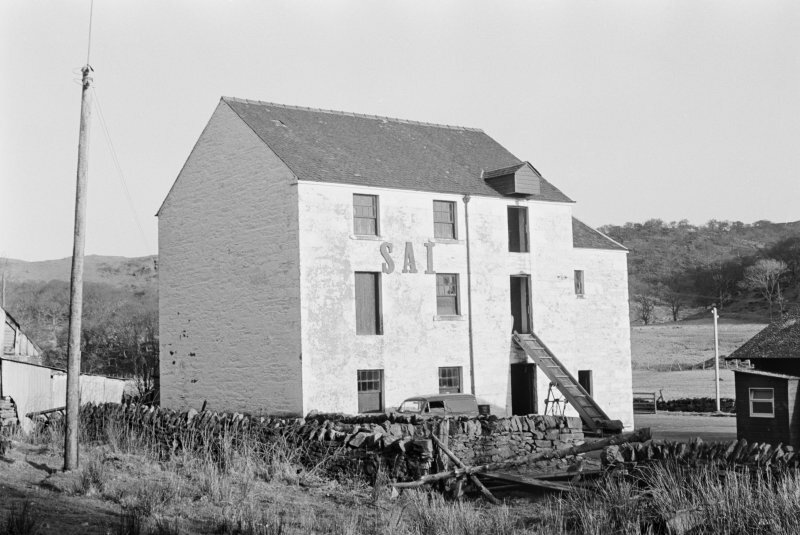 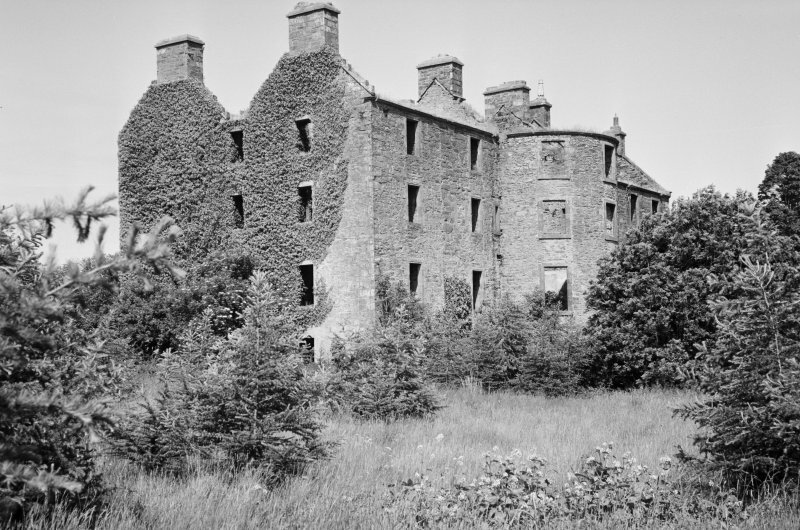 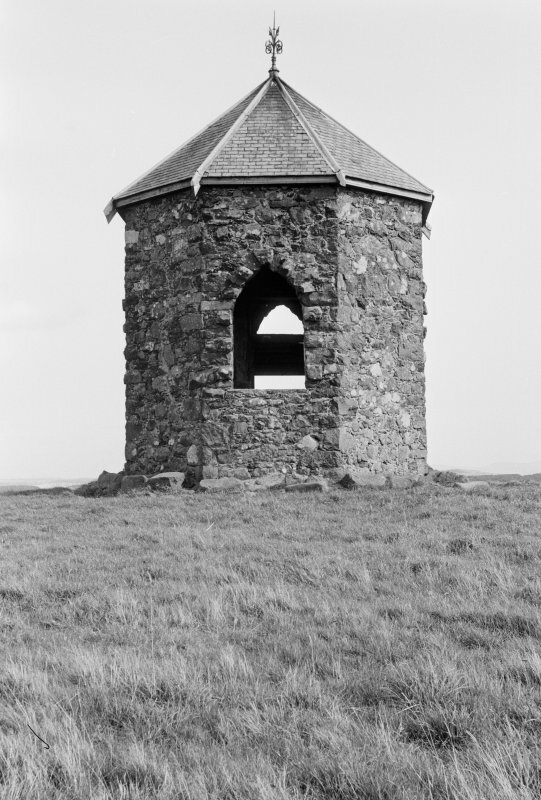 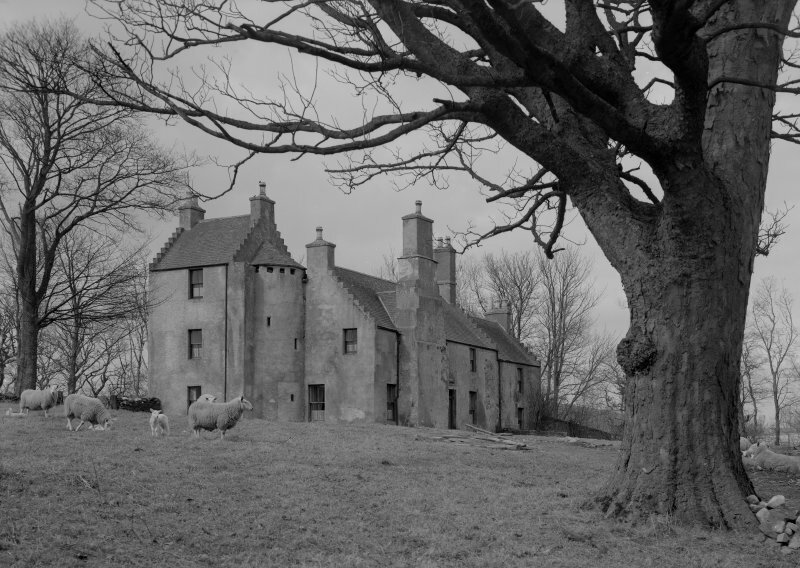 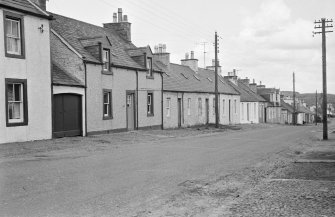 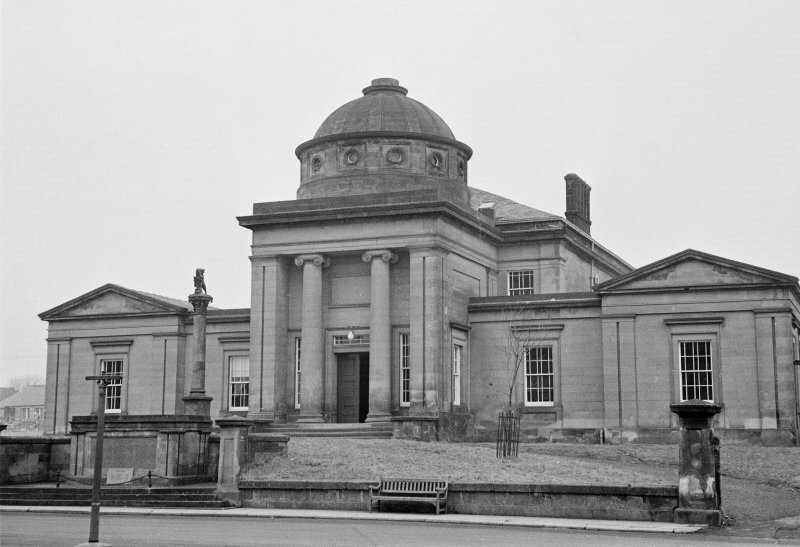 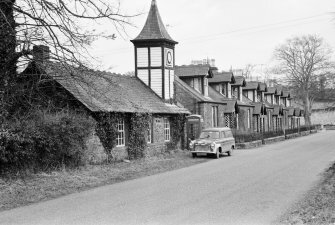 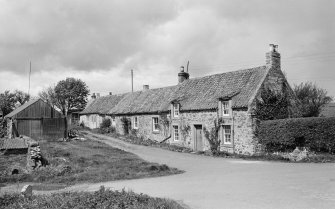 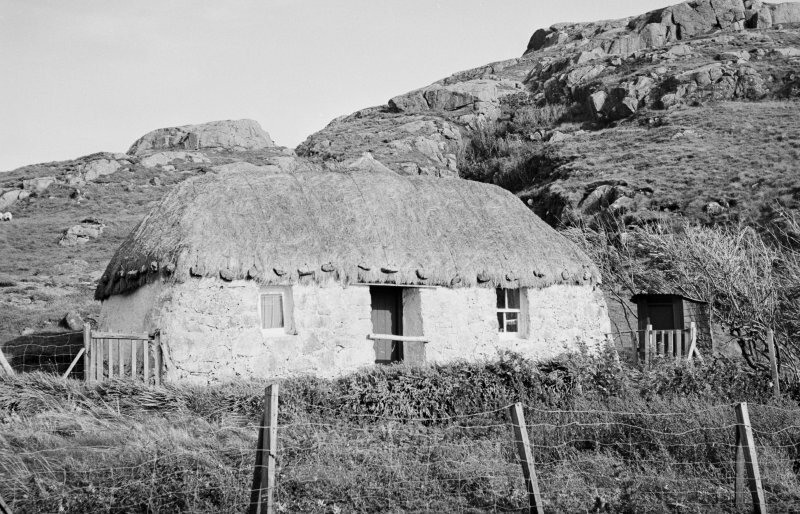 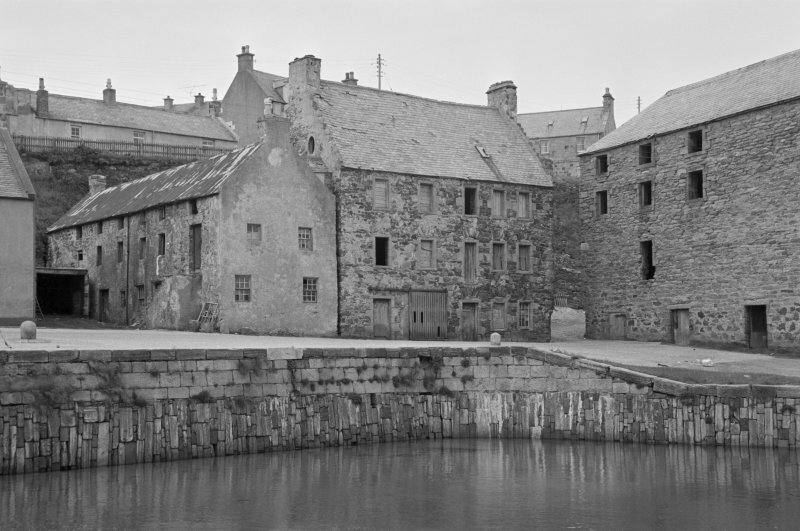 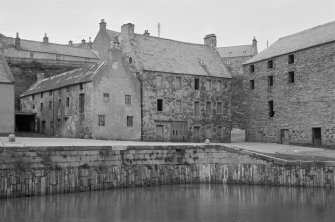 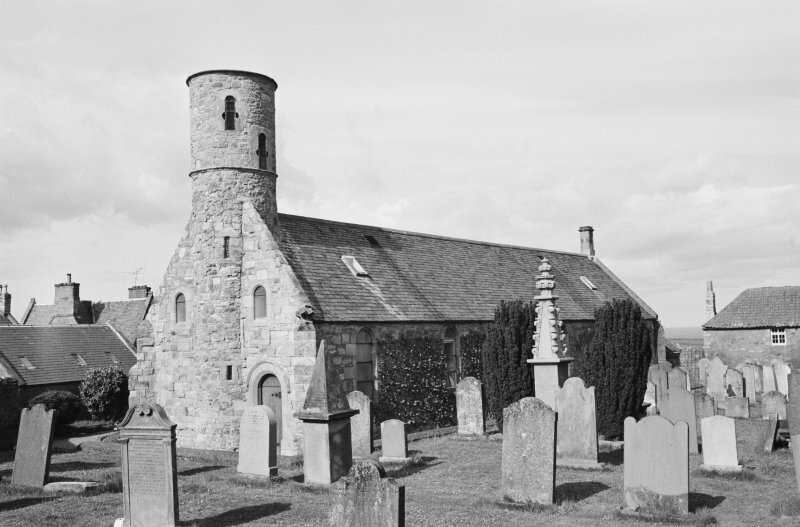 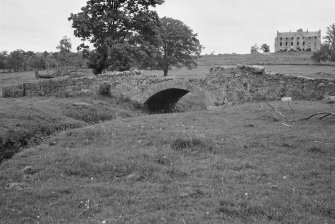 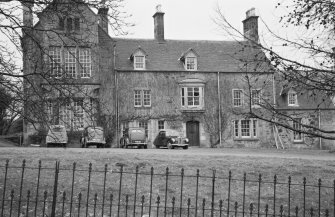 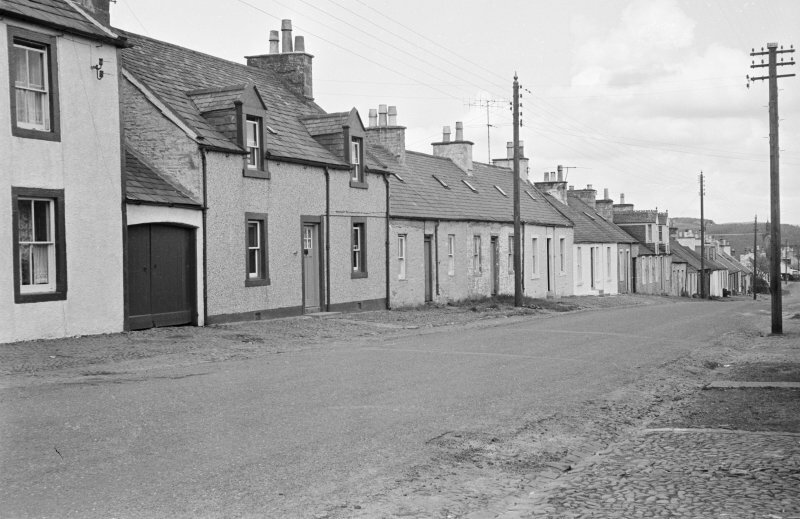 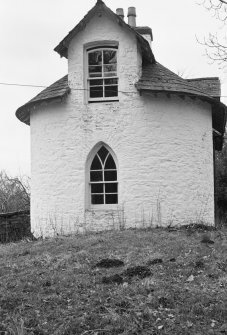 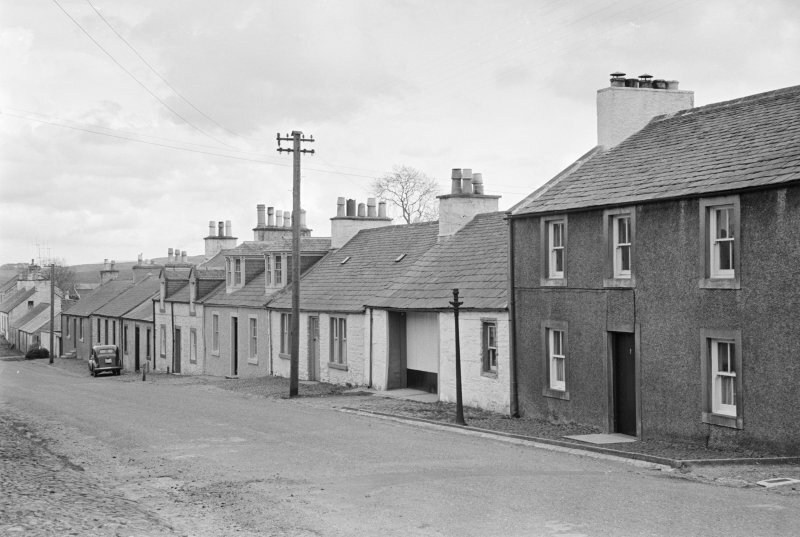 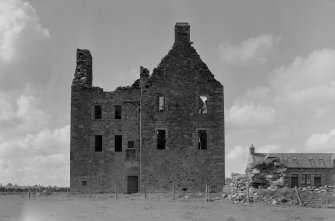 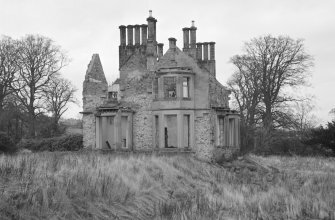 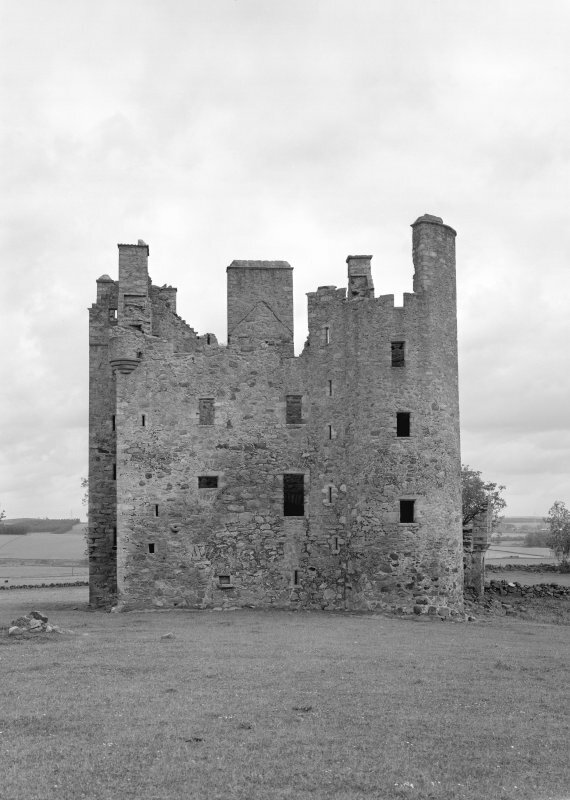 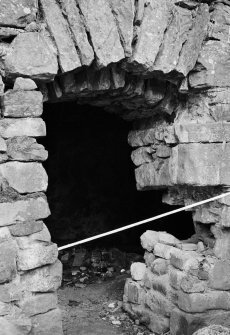 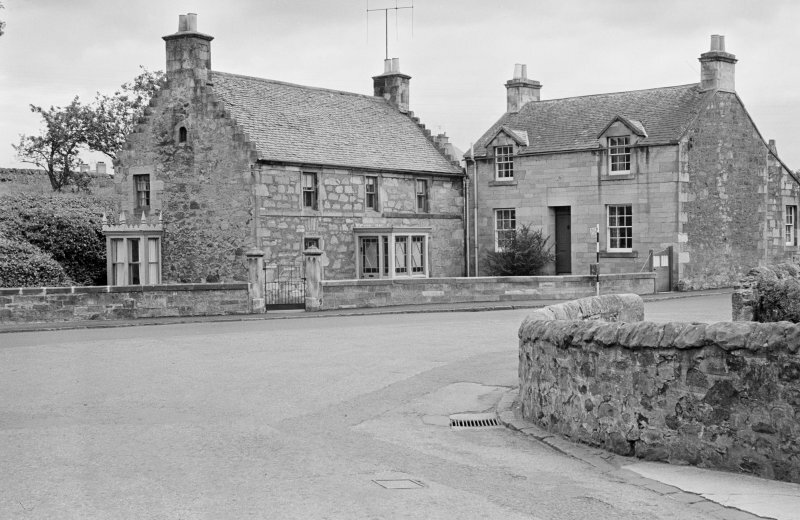 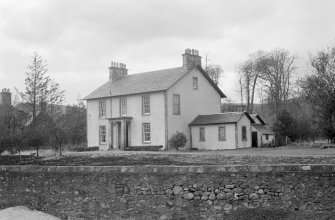 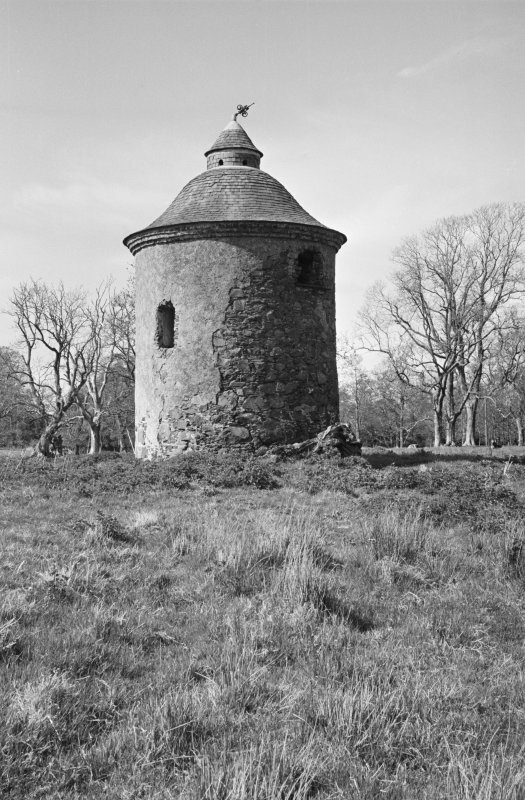 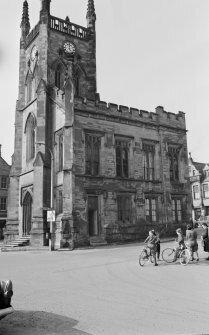 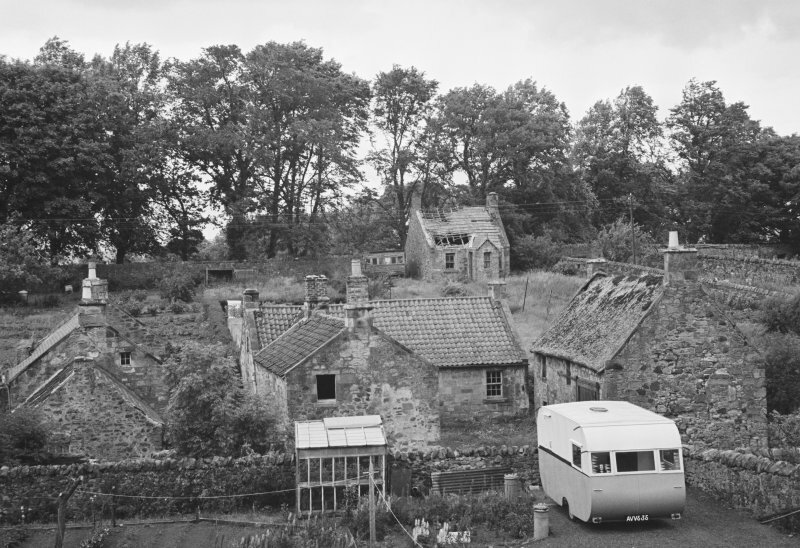 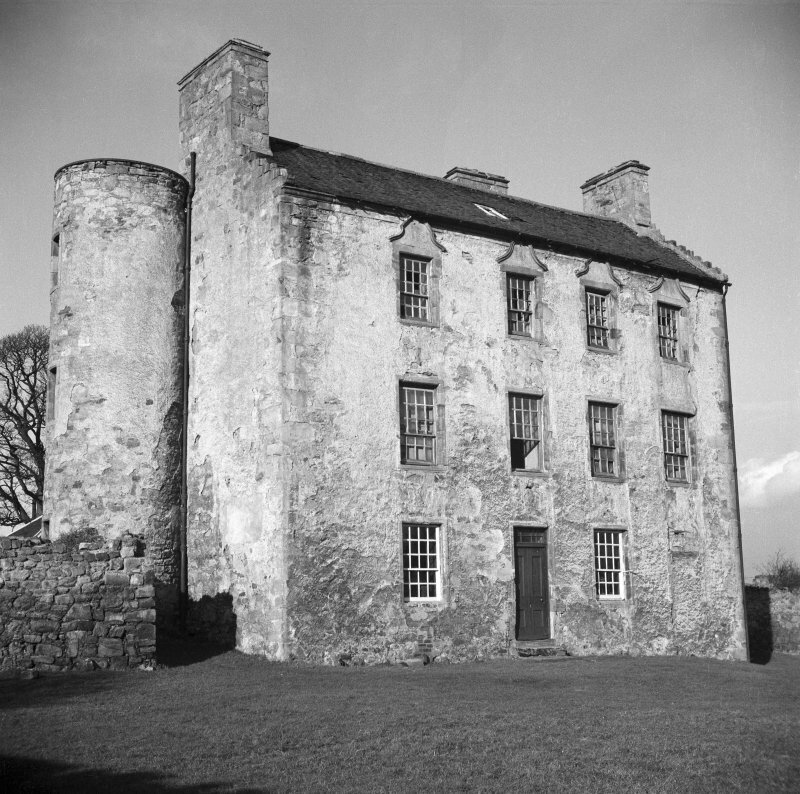 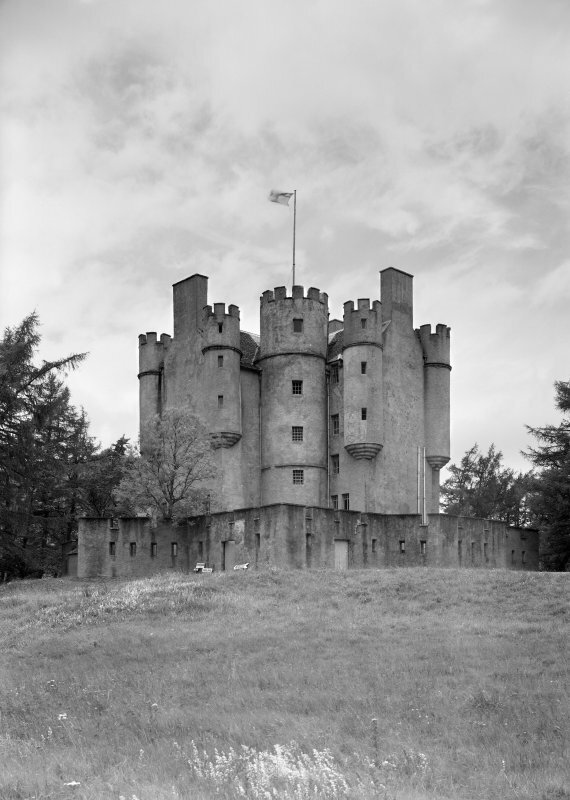 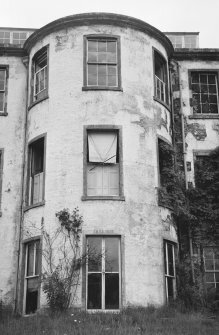 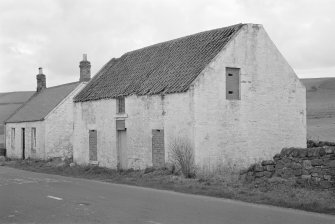 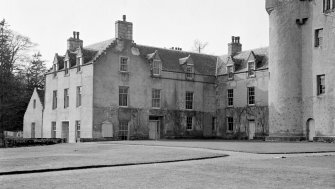 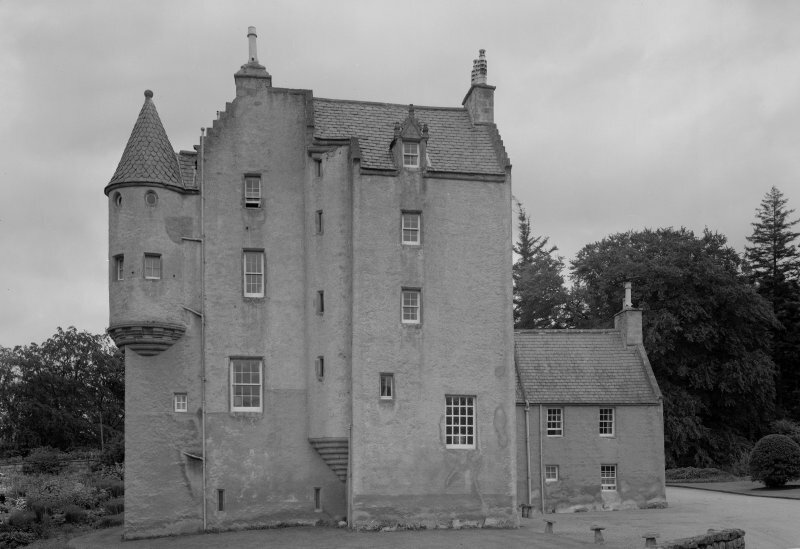 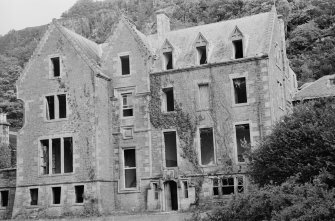 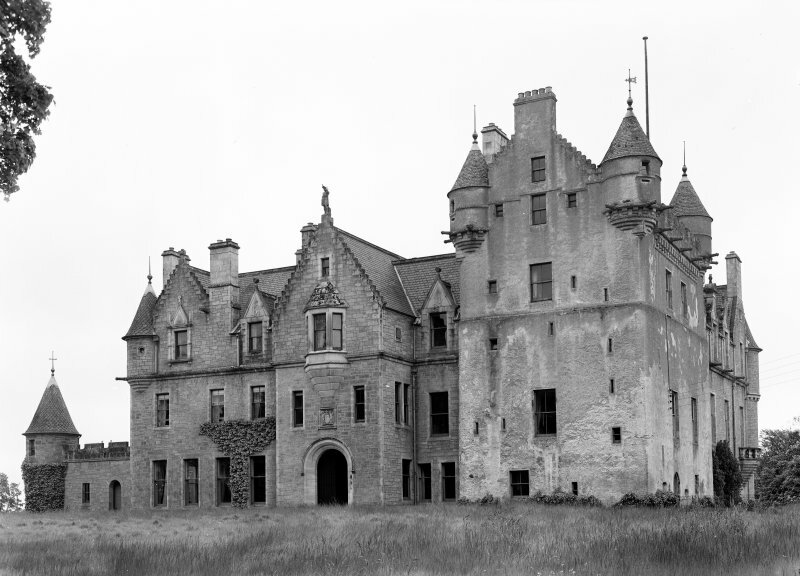 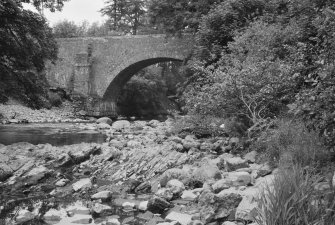 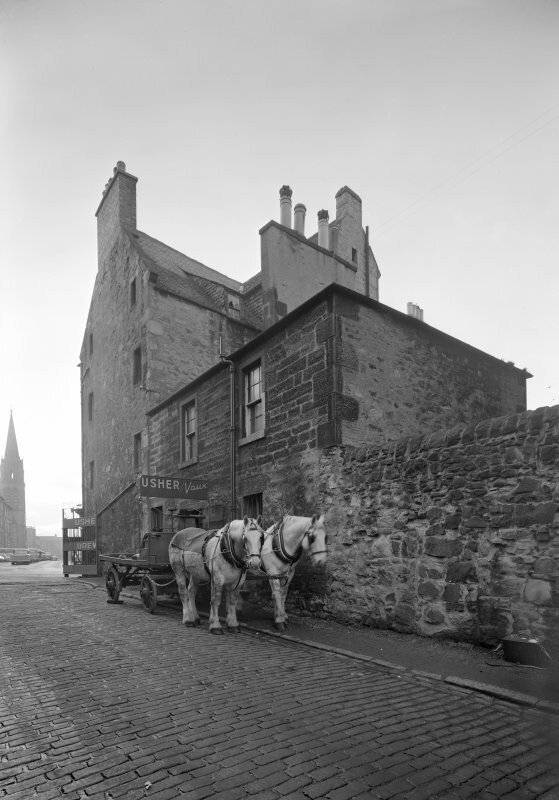 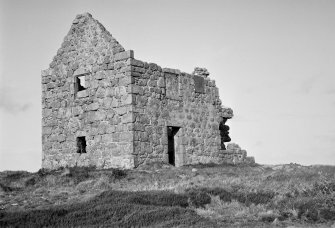 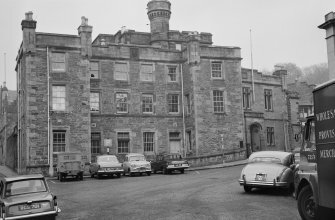 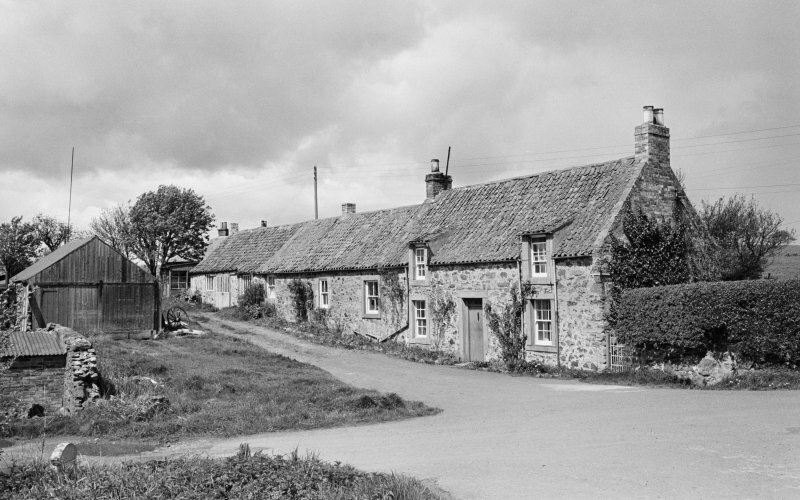 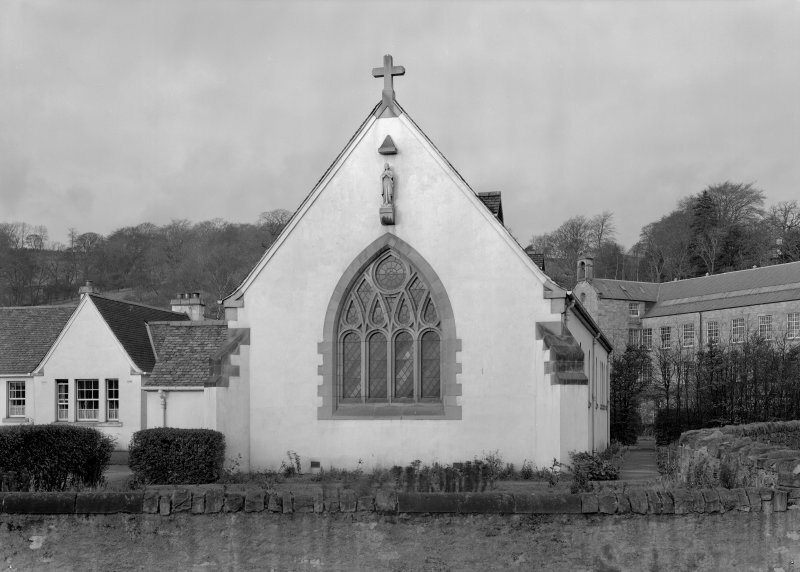 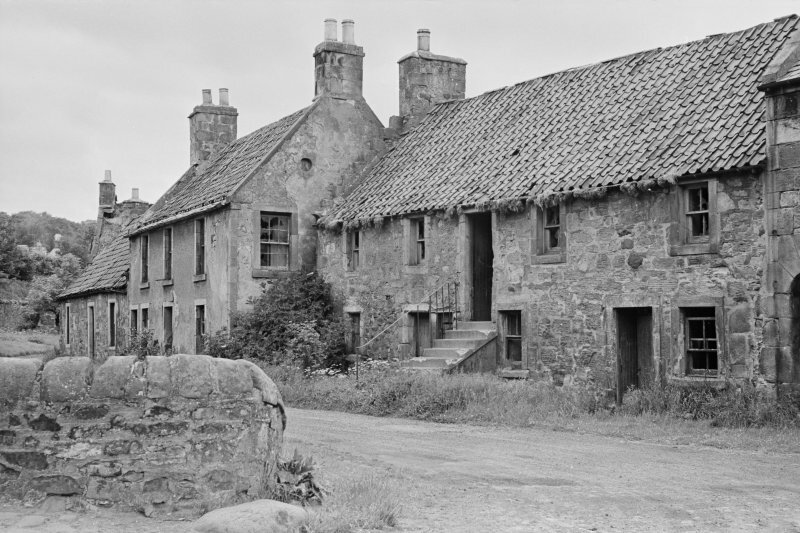 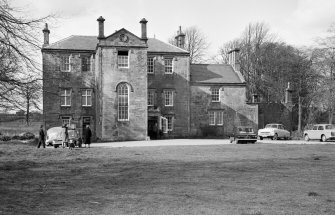 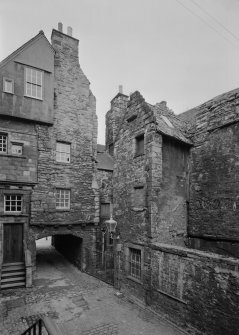 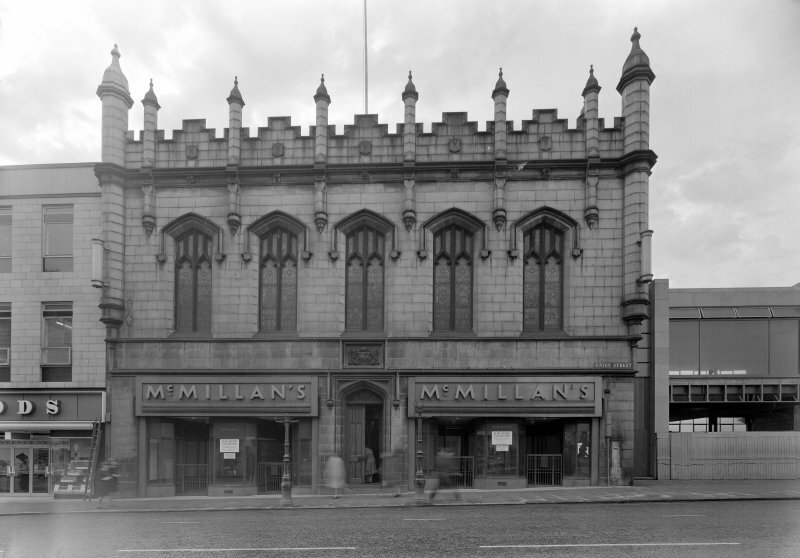 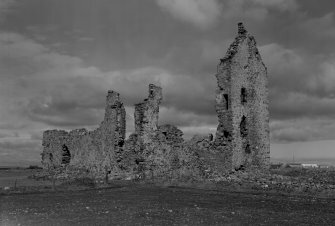 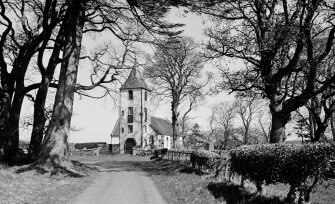 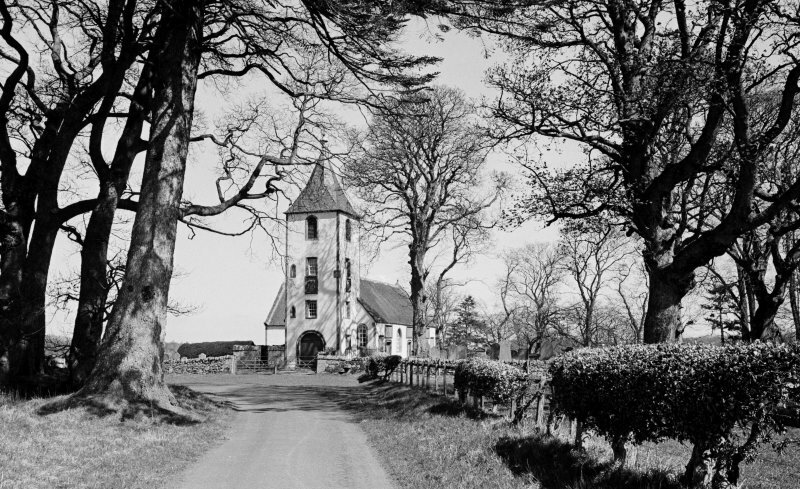 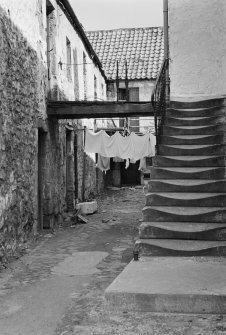 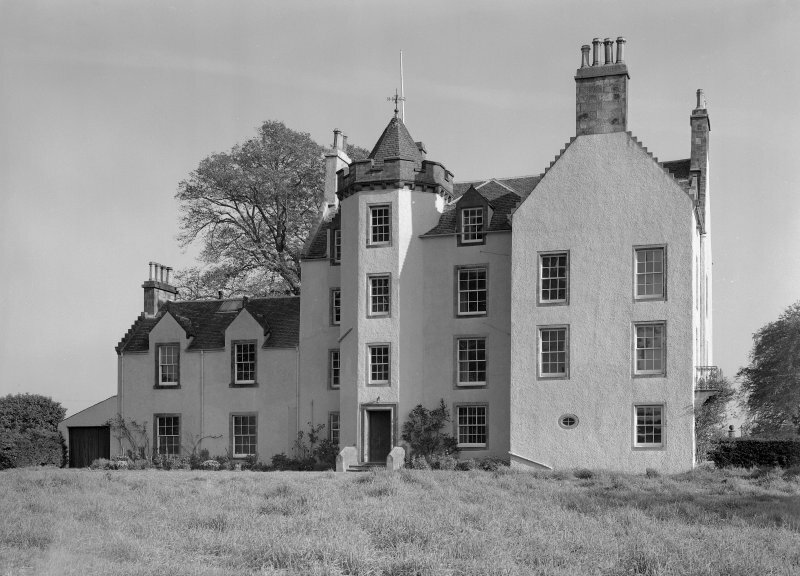 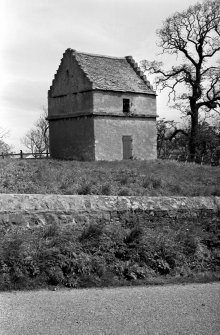 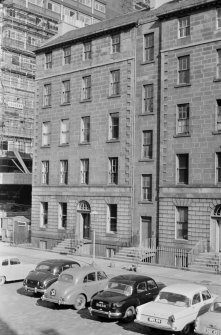 The HES Archive includes a wealth of material illustrating Scotland's built heritage, including photographs from the Scottish National Buildings Record (SNBR). 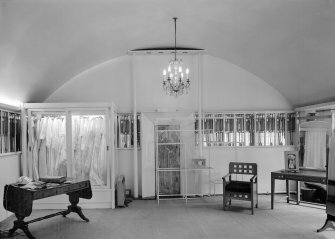 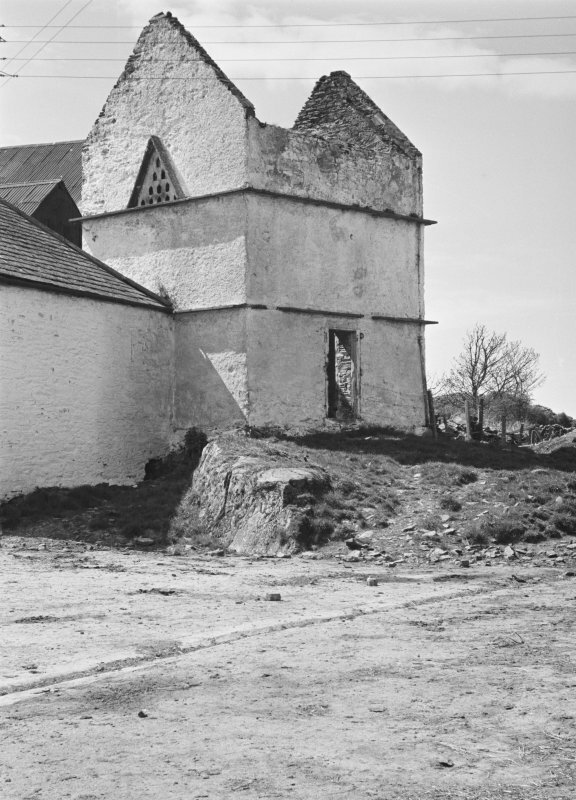 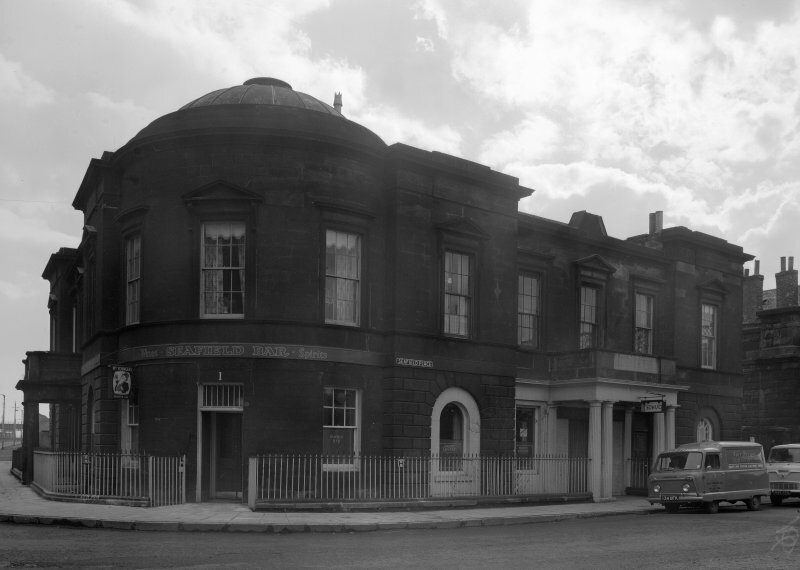 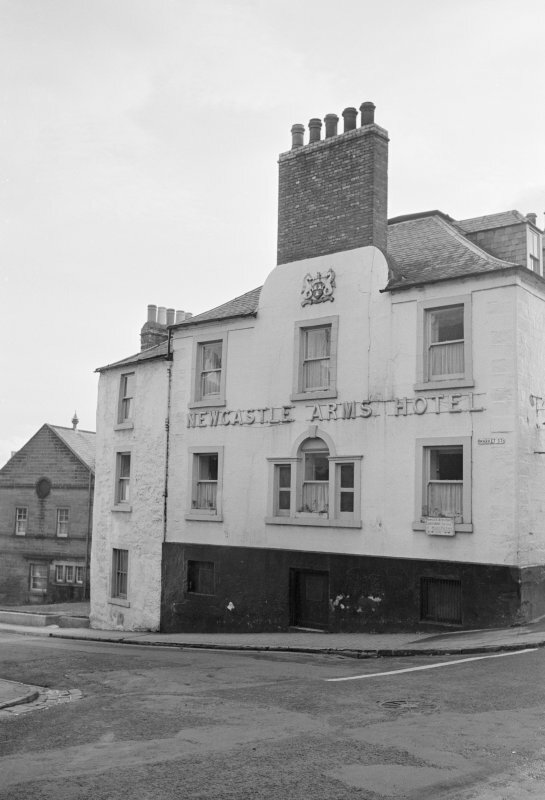 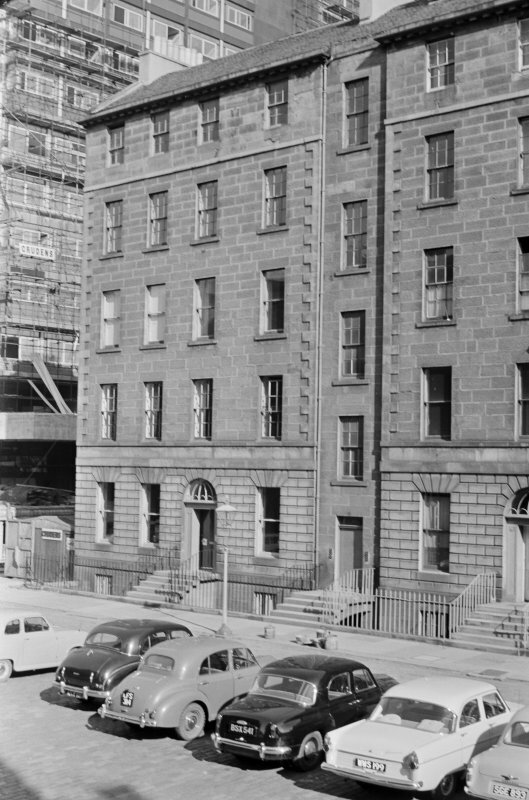 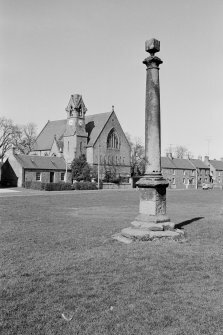 The SNBR collection comprises over 20,000 photographs taken between 1941 and 1966 forming a unique historical record of buildings and townscapes from that era, many of which have subsequently been demolished or altered significantly. 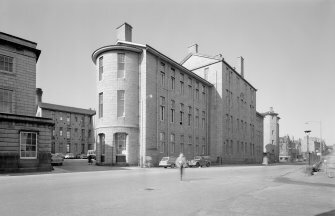 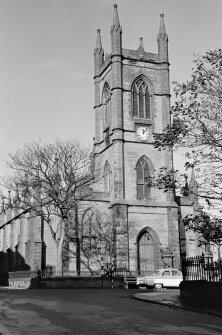 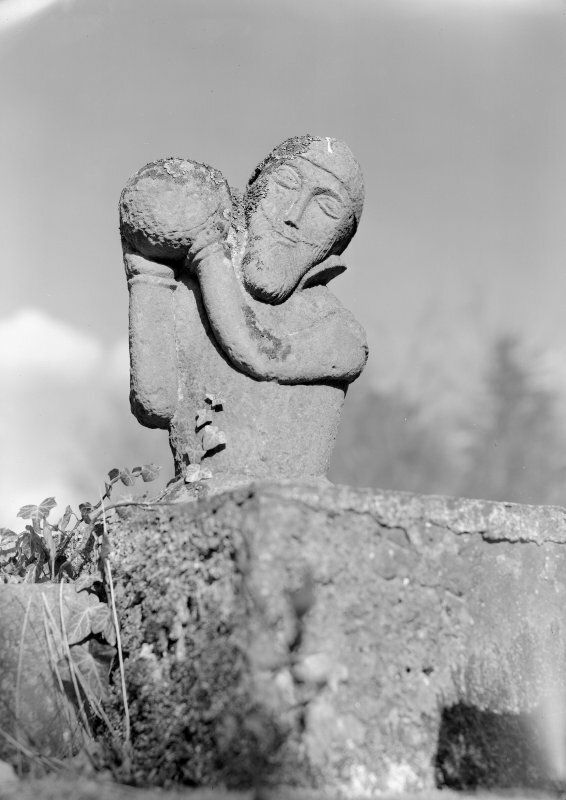 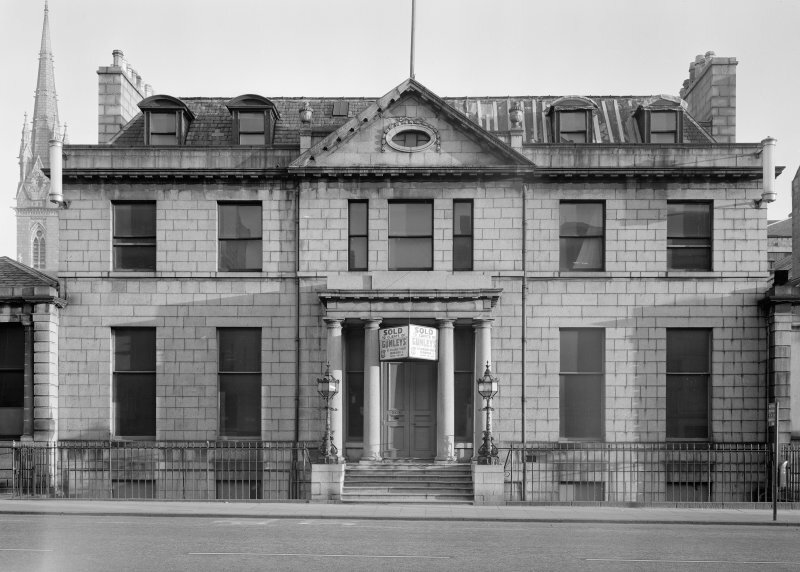 The SNBR was established in 1941 with the remit to make an emergency record of Scotland's historic architecture, and this work continued after the war when many buildings were threatened by demolition or alterations. 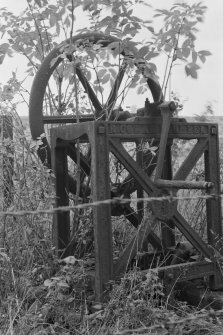 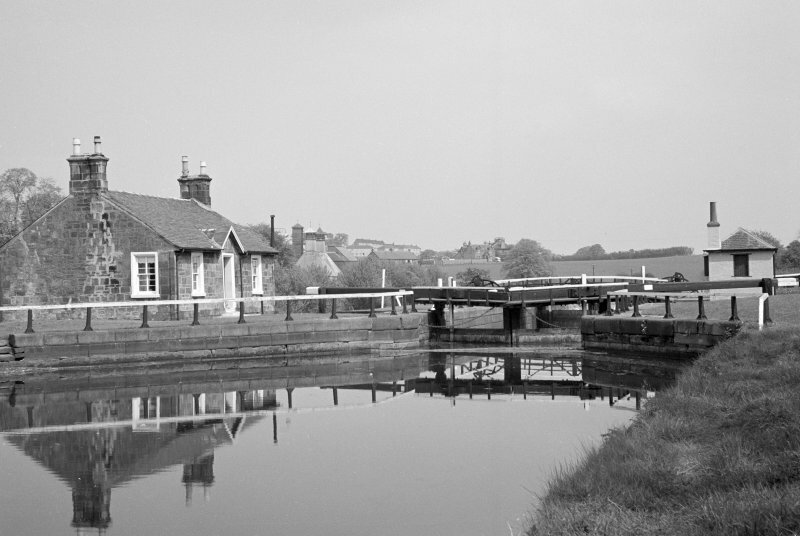 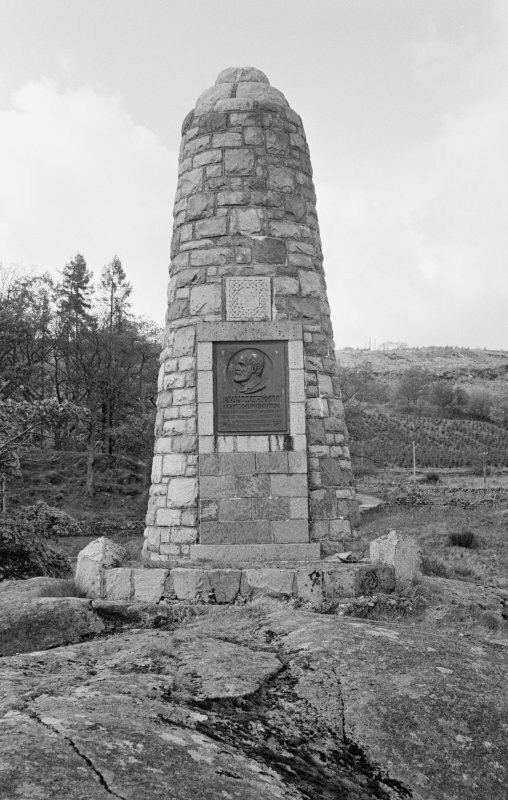 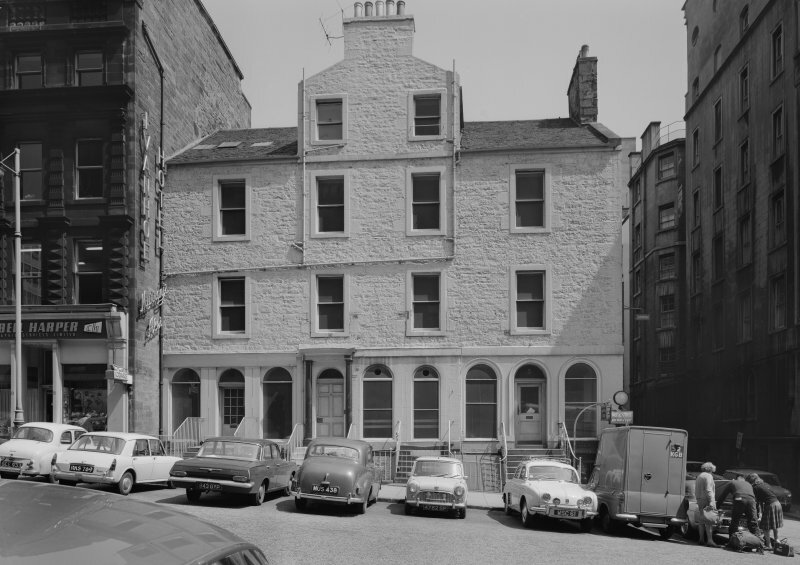 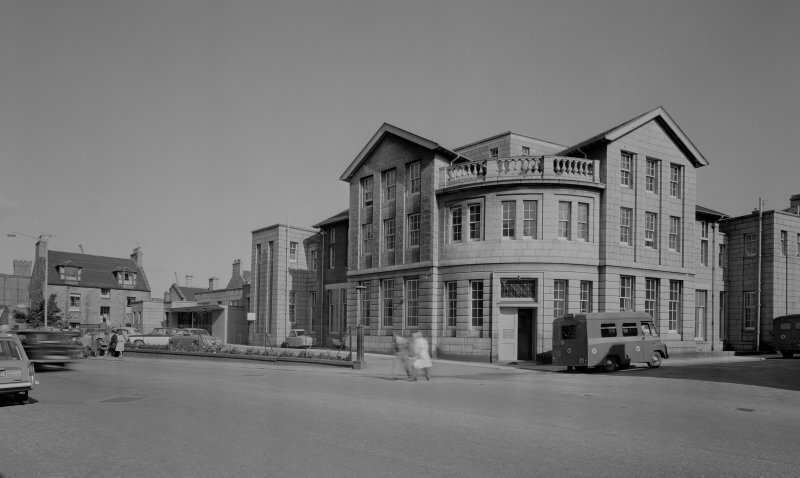 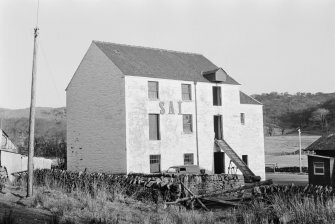 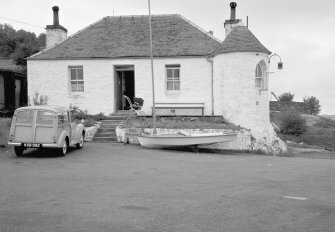 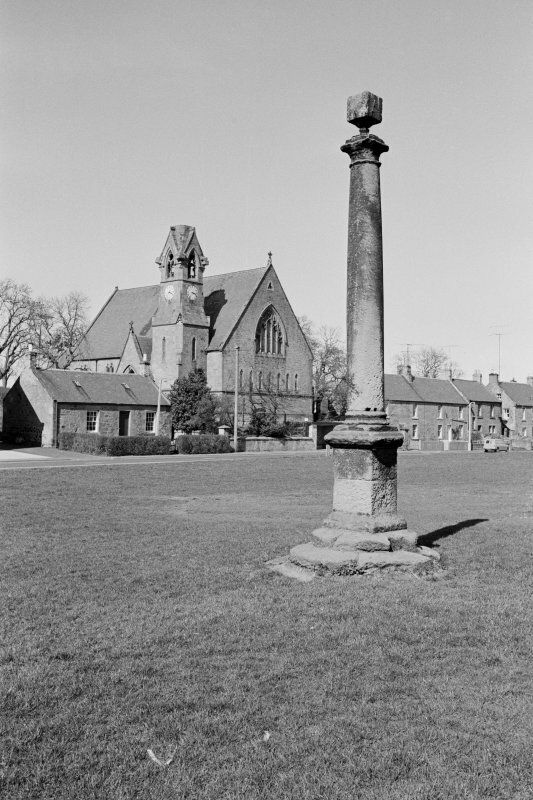 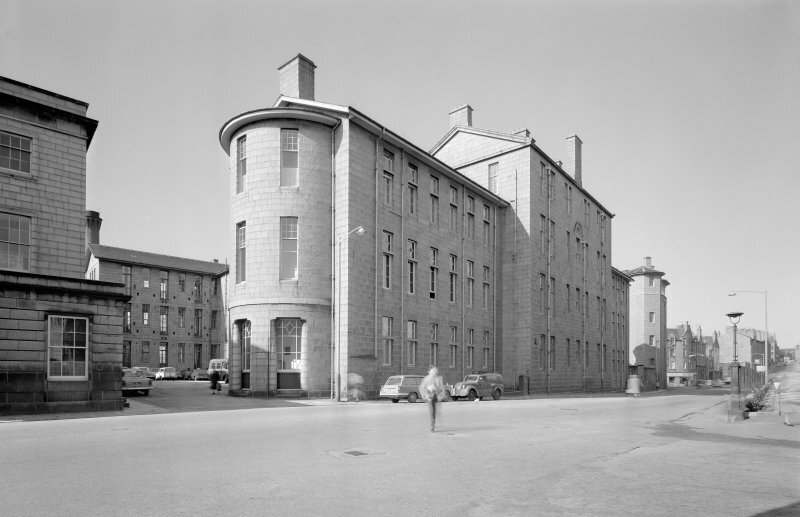 The SNBR was taken over by the Ministry of Works in 1954, and in 1966 it transferred to RCAHMS. Recording buildings at risk remains one of our key roles. We are currently in the process of digitising and cataloguing the negatives from the SNBR collection and more than 6000 photographs are now available online. 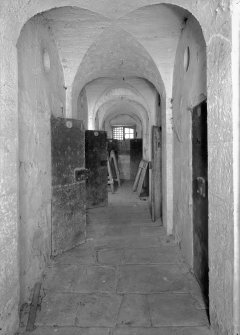 HES has an active volunteer programme and some of the cataloguing has been carried out by one of our volunteers. 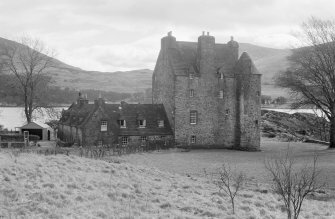 A selection of the best photographs has been included in this gallery and new ones will be added weekly. 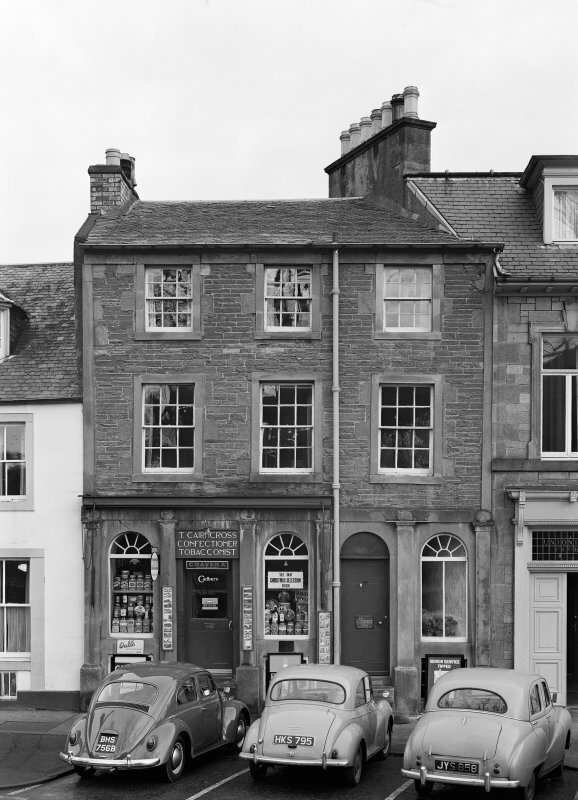 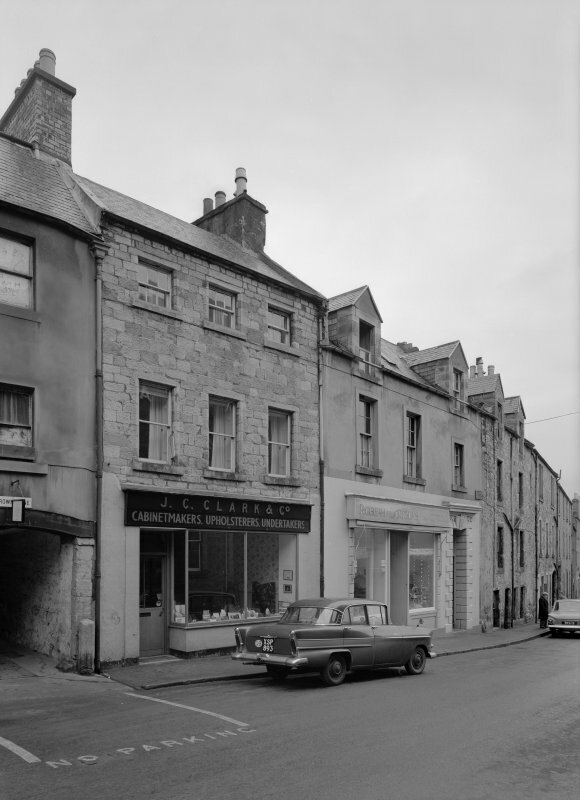 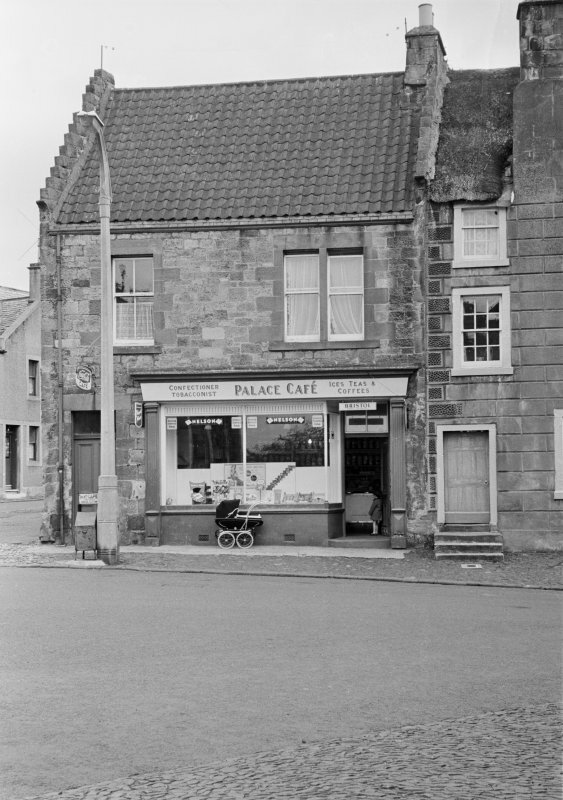 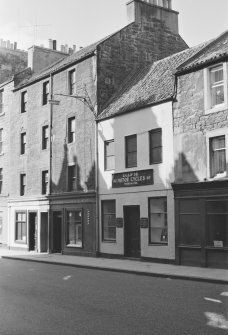 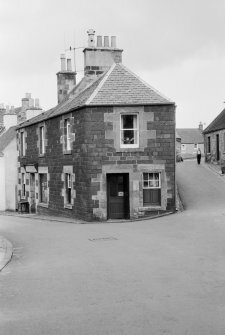 View of 6 Abbey Place, Jedburgh from south, showing T Cairncross confectioner and tobacconist. 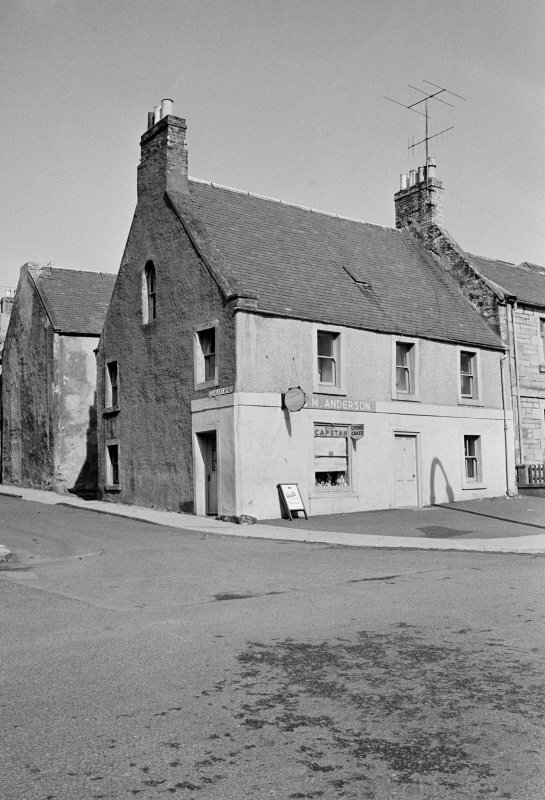 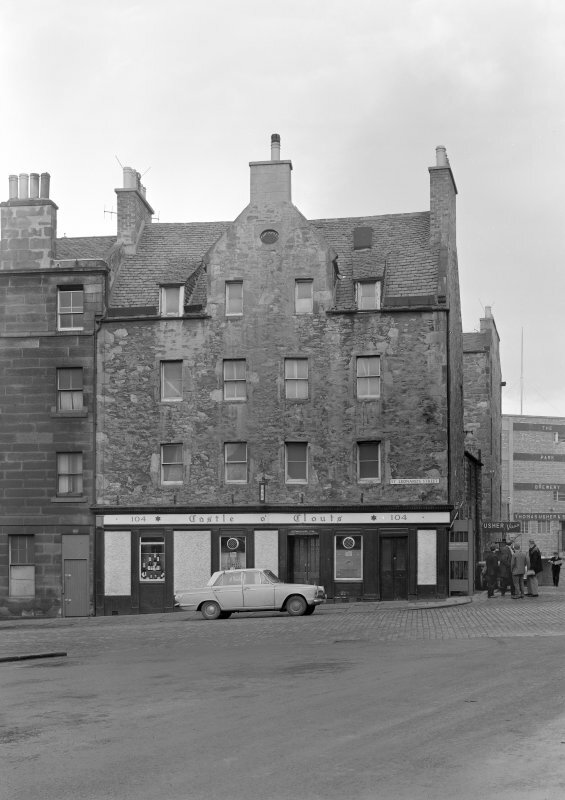 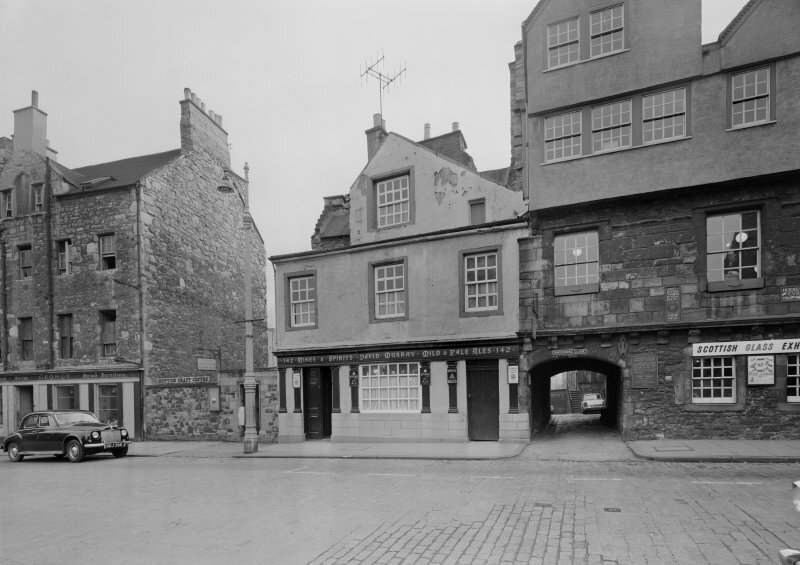 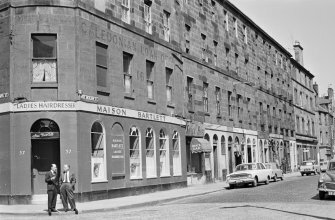 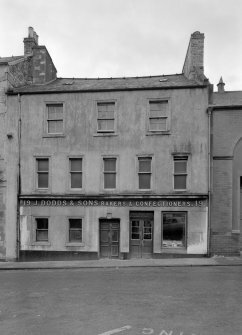 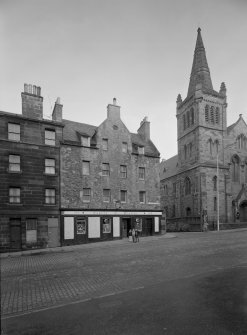 View of 19 Canongate, Jedburgh, from north showing J Dodds & Sons bakers and confectioners prior to reconstruction. View of 1 and 2 Duck Row, Jedburgh, from east. 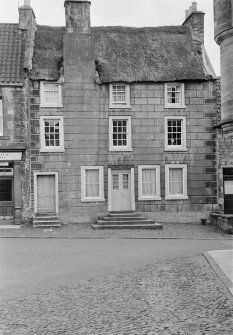 Detail of wynd, Waterside Cottage, Haddington, from SW.
View of St Peter's Parish Church, Princes Street, Thurso, from south. 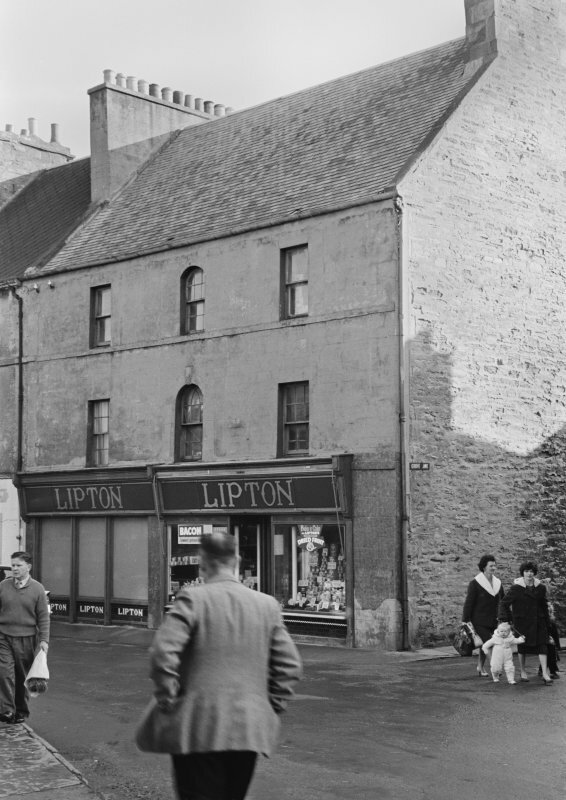 View of 1-3 High Street, Thurso, from west, showing Lipton's shop. 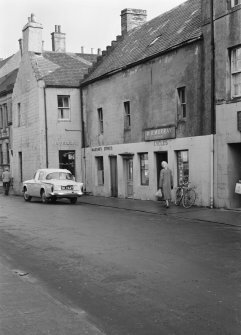 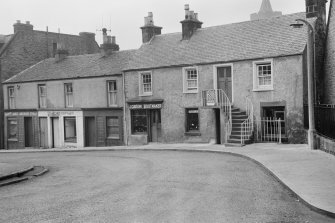 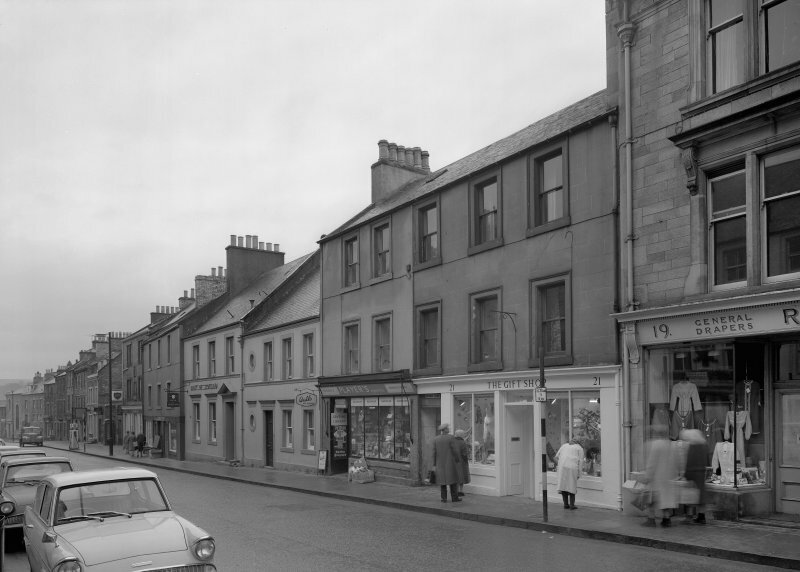 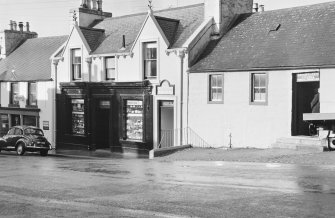 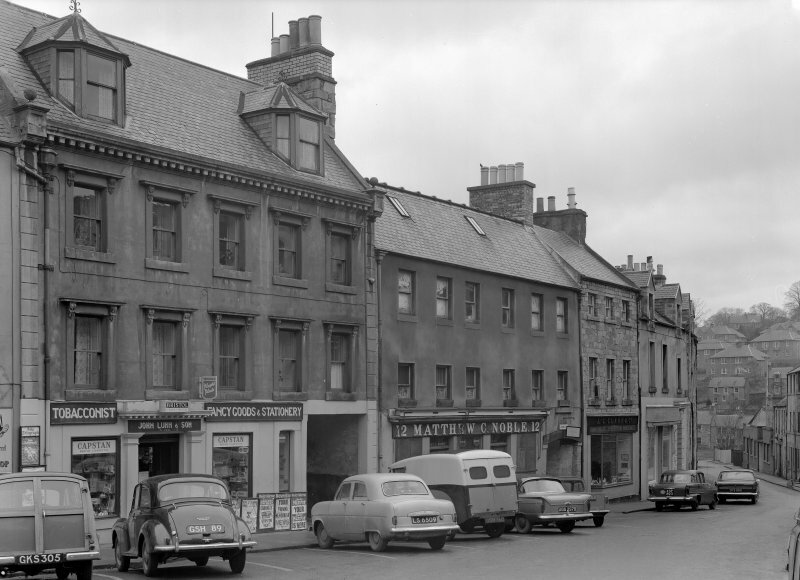 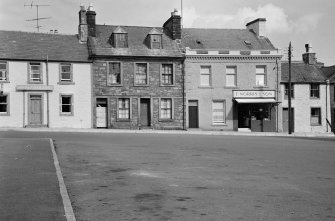 View of 11-17 High Street, Thurso, from west showing W D Murray bicycle shop, MacKay's Stores and R Fidler shop. 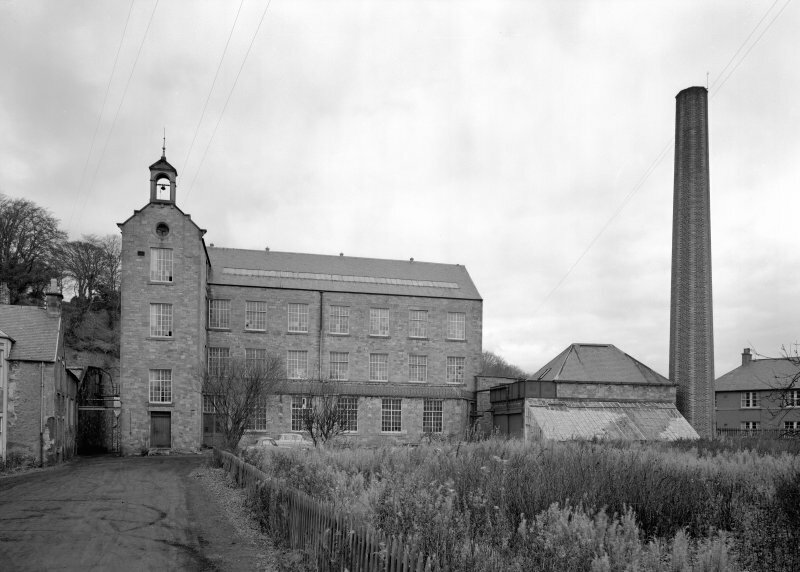 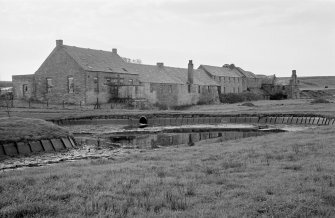 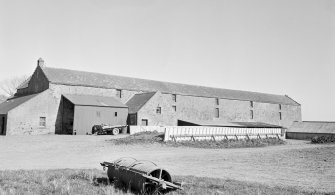 General view of Millbank foundry and meal mill, Thurso, from north. 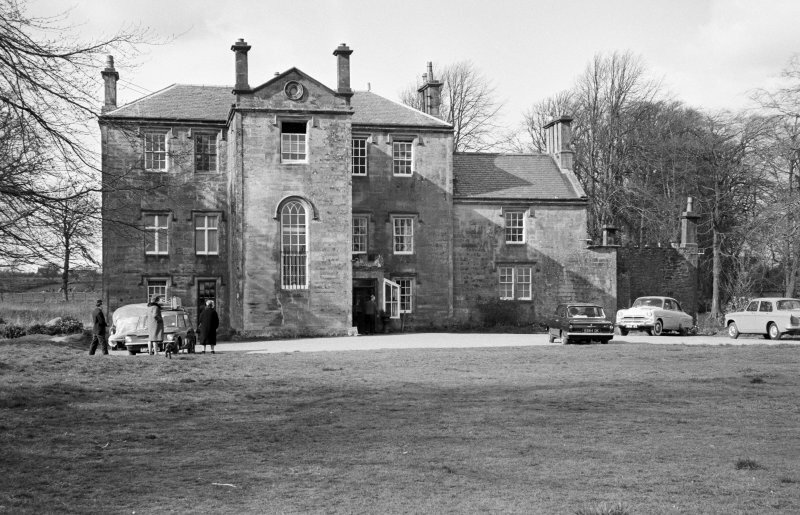 View of south west elevation of Lennel House from west. 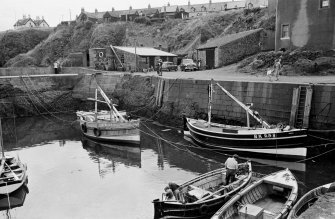 General view of St Abbs Harbour. View of Craigends House from N.
General view of the front of 104 St Leonards' Street, Edinburgh including Castle o' Clouts and St Leonard's Church from W.
General view of Baron's Folly, Down Law. 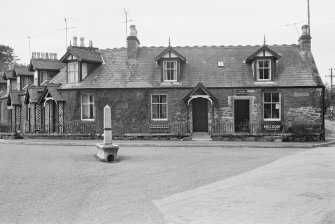 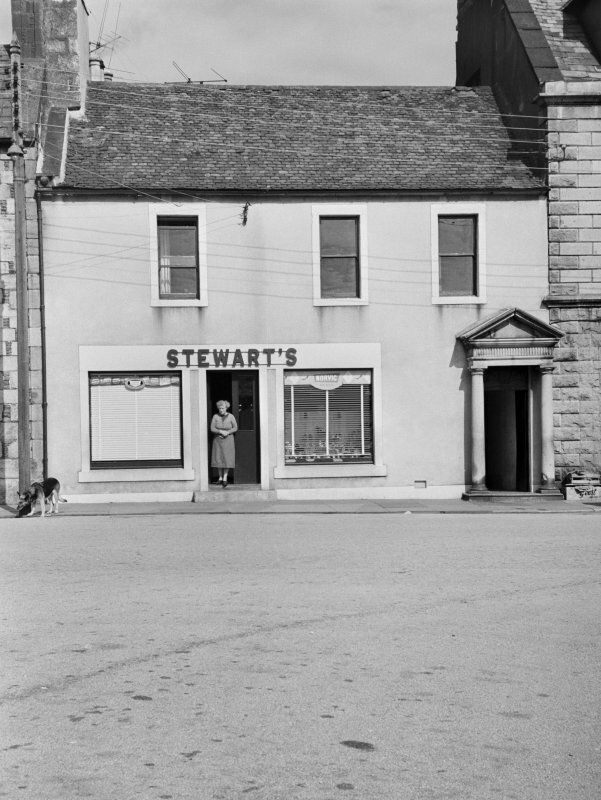 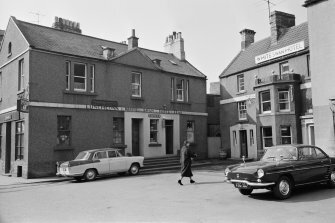 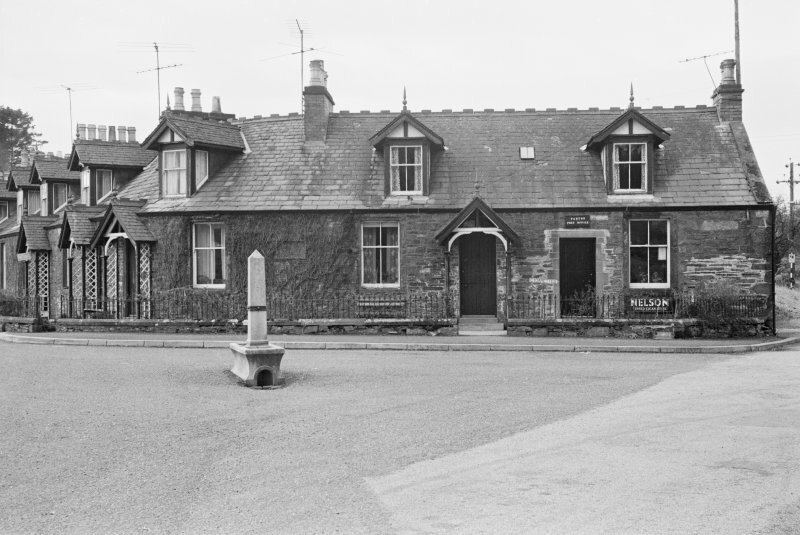 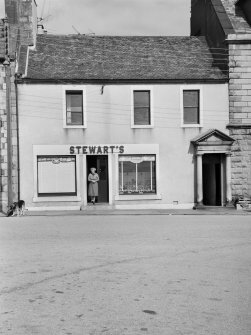 View of 18 North Main Street, Wigtown, from south east, showing shopkeeper at Stewart's shoe shop. General view of facade, Eden House. 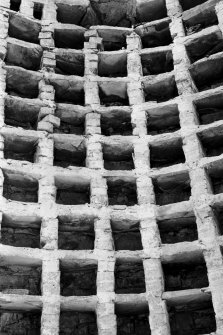 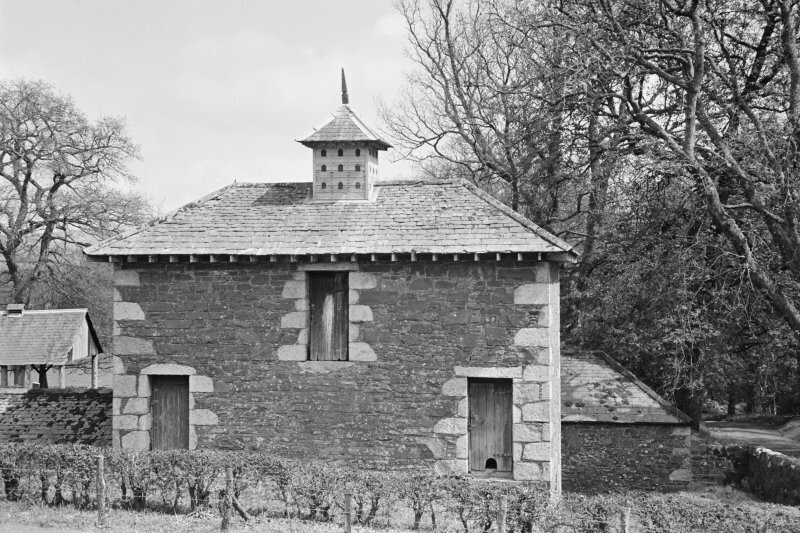 View of nesting boxes inside dovecot at Kirroughtree House. 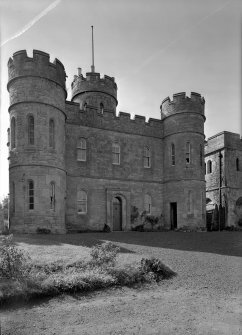 View of Barholm Castle from south west. View of Woolmet House from south east. 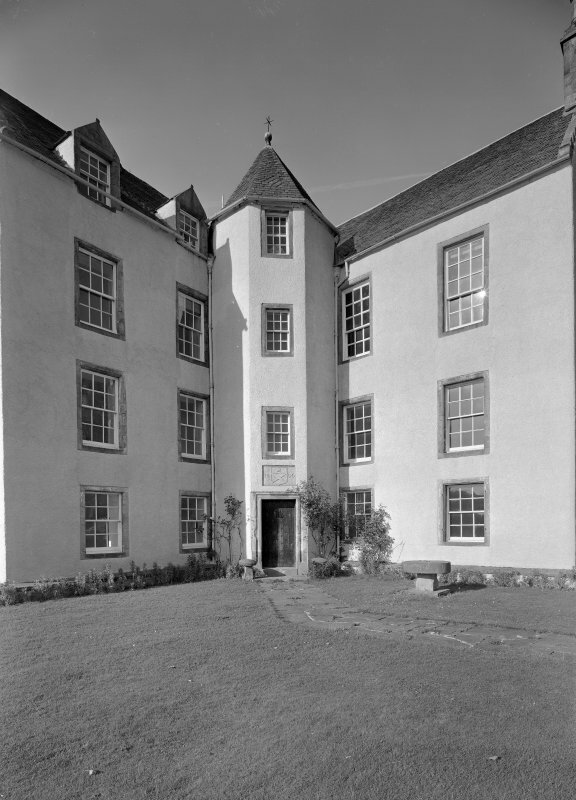 View of Woolmet House showing south elevation wing. 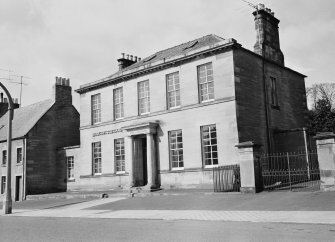 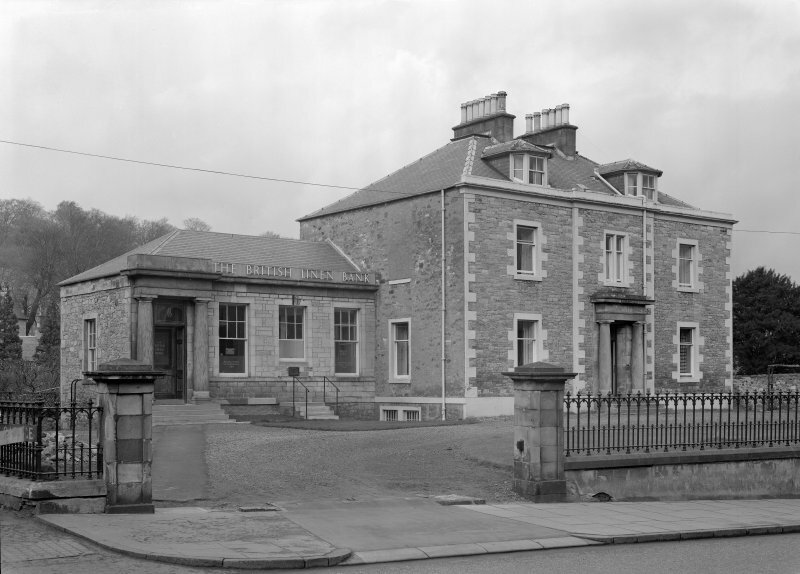 View of County Welfare Office and Treasurer's Department, 24 Newtown Street, Duns. 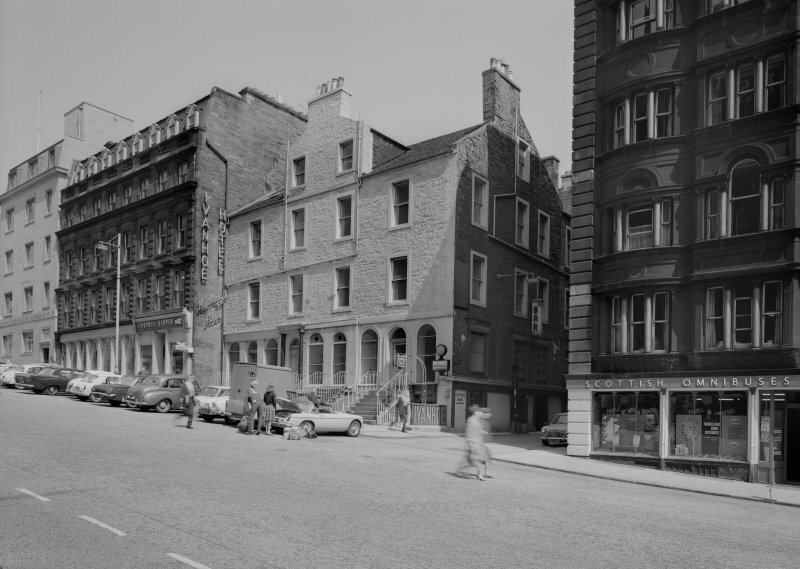 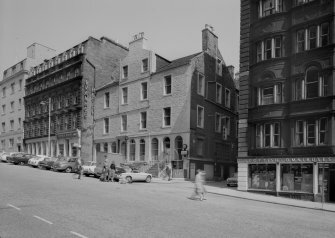 View of south elevations of 14-18 Canongate, Jedburgh from west, showing the premises of Robert Douglas and J C Clark & Co cabinetmakers, upholsterers and undertakers. 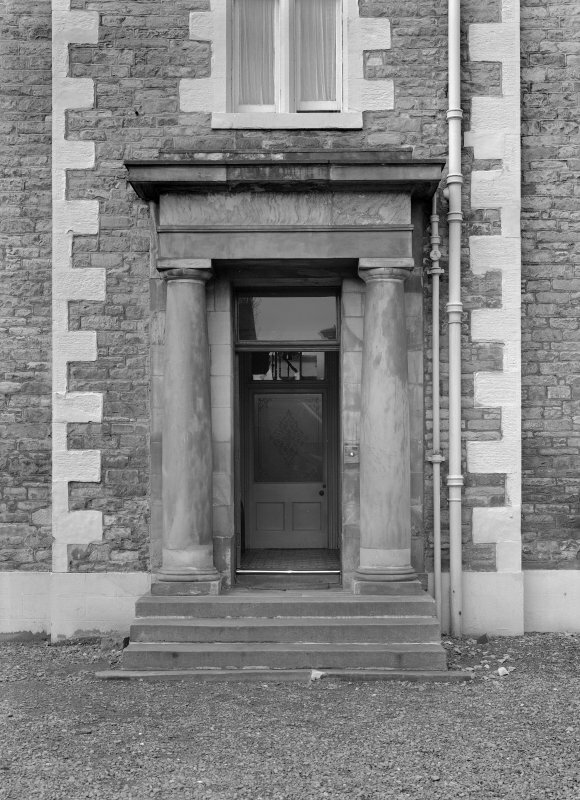 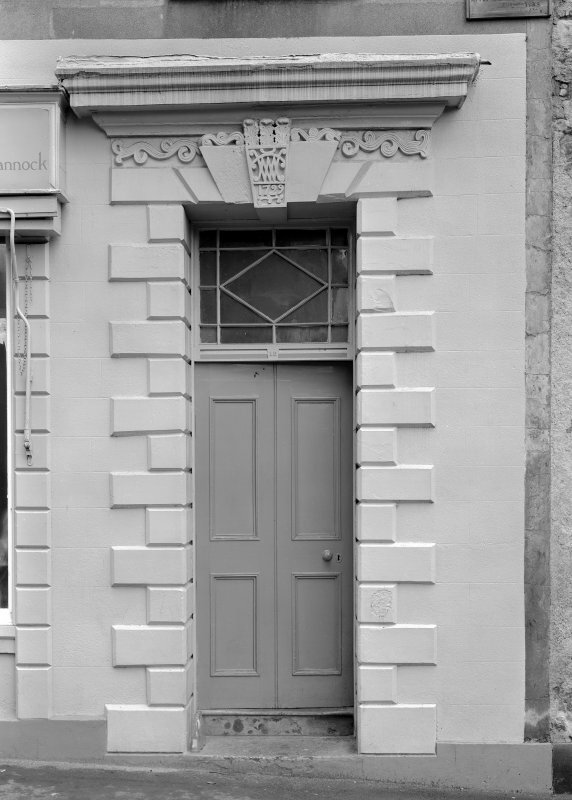 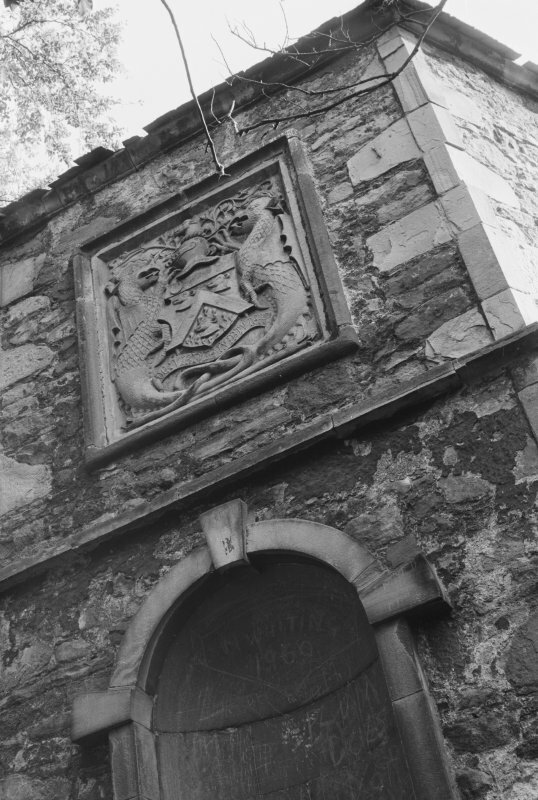 Detail of main entrance doorway to 16 Canongate, Jedburgh, showing the date 1729 above the door. 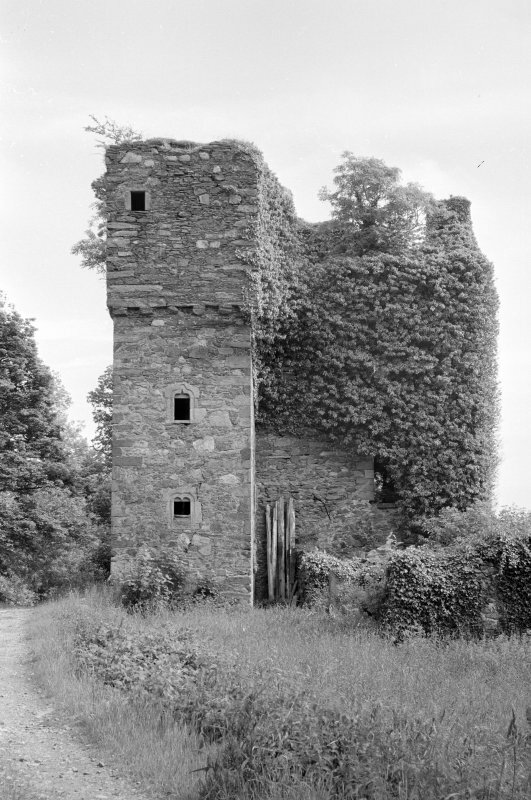 View of Balfluig Castle from south east. 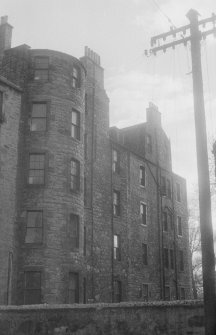 View of Rockville, 3 Napier Road, Edinburgh from the road. 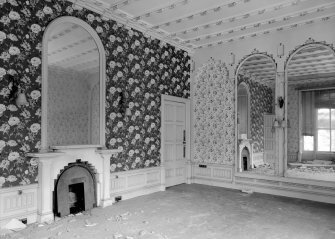 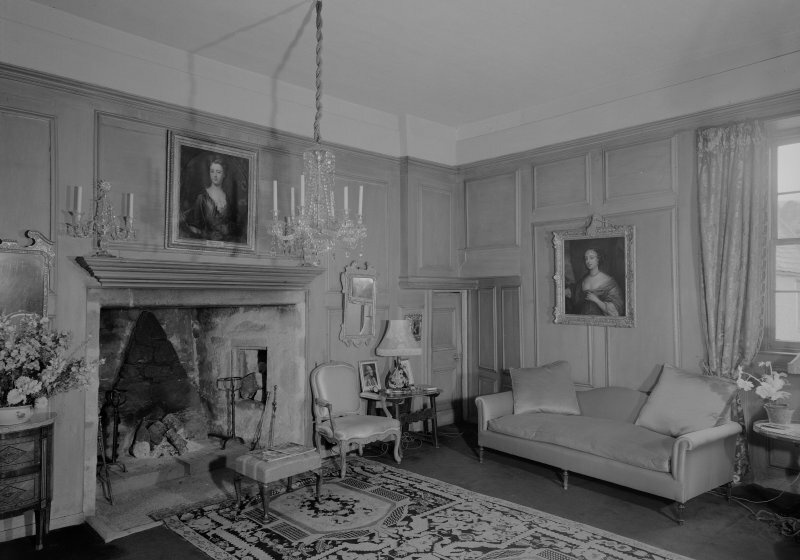 Interior view of Rockville, 3 Napier Road, Edinburgh, showing a room with large arch-topped mirrors, a ribbed ceiling with gilded flowers, a fireplace with a stepped interior arch and wallpapers with design of cabbage-roses and vases. 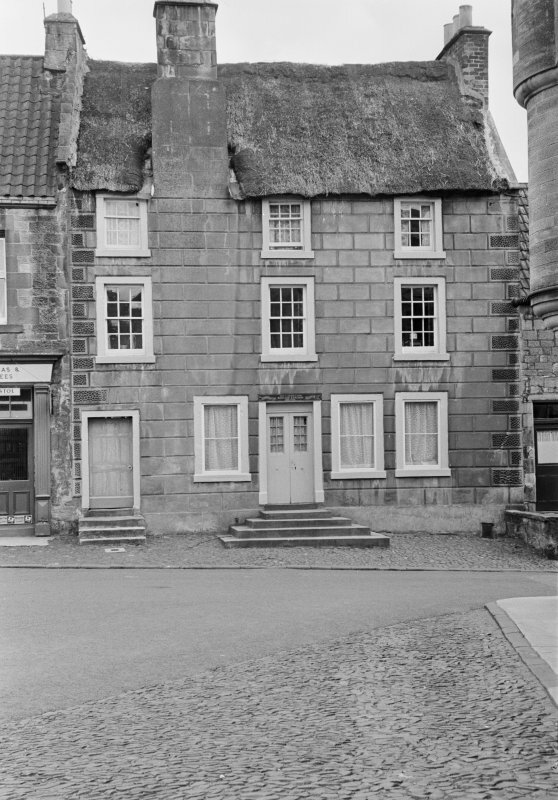 View of 36 Canongate, Jedburgh, from south west. 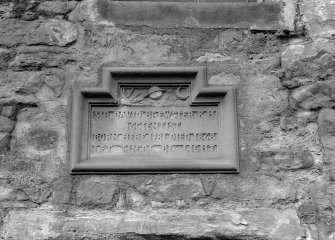 Detail of plaque commemorating Sir David Brewster, 40 Canongate, Jedburgh. View of 1 and 2 Duck Row and 40 and 42 Canongate, Jedburgh from south east. View of St Mary's Roman Catholic Church, Old Bongate, Jedburgh from south east. 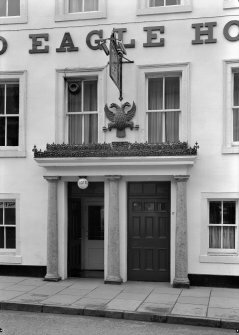 Detail of five window block's twin colonnaded doorways, double-headed eagle and hanging sign, Spread Eagle Hotel, 20 High Street, Jedburgh. 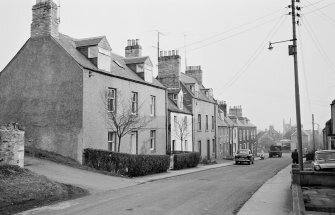 View from north of 19 and 21 Newtown Street, Duns. 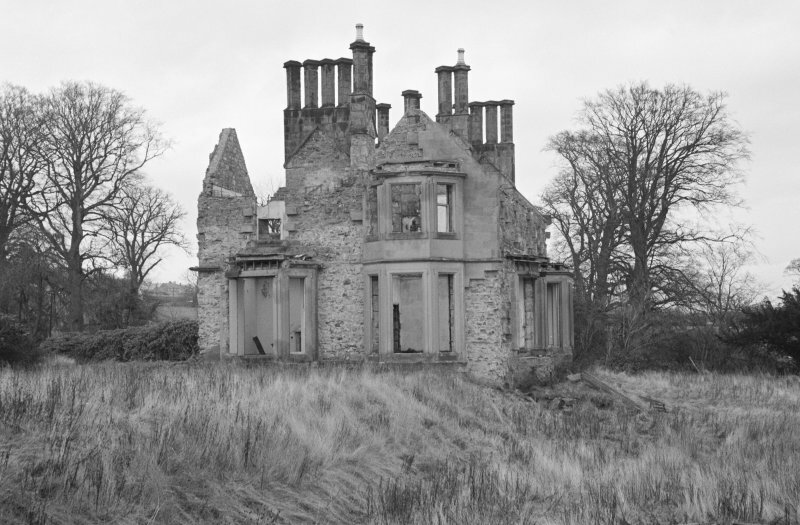 View from garden of the remains of Manor House, Kirkland, Methil. 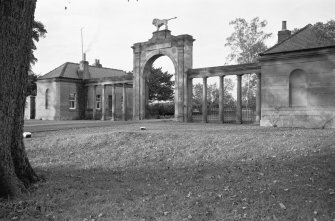 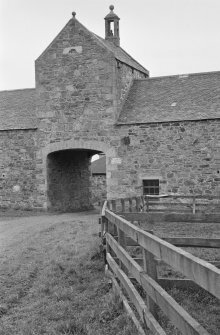 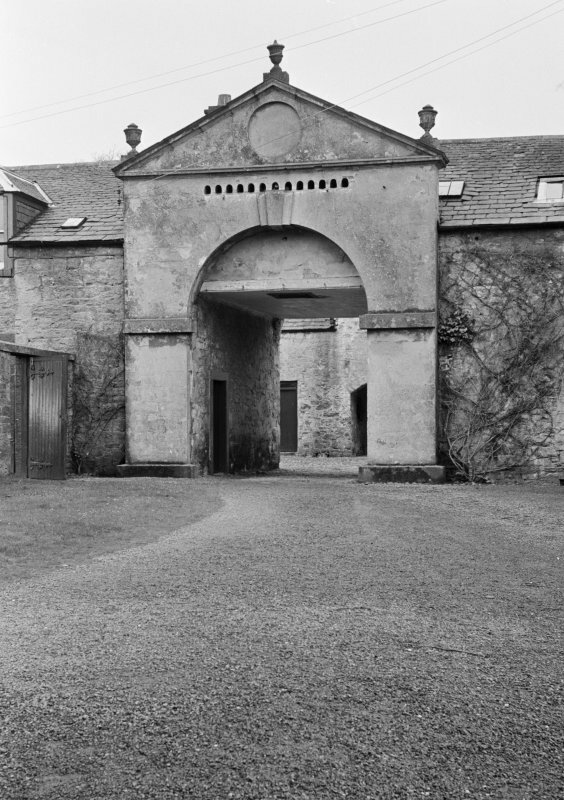 View of Arbigland House stables and dovecot above arch from south east of stables. 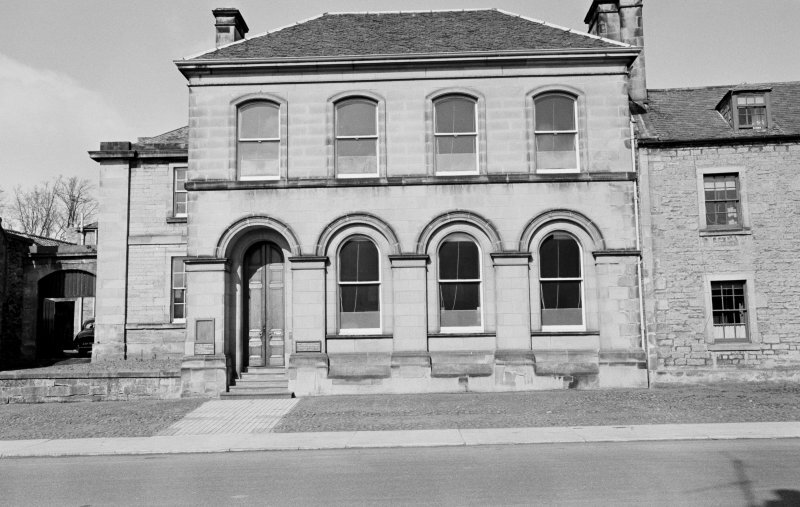 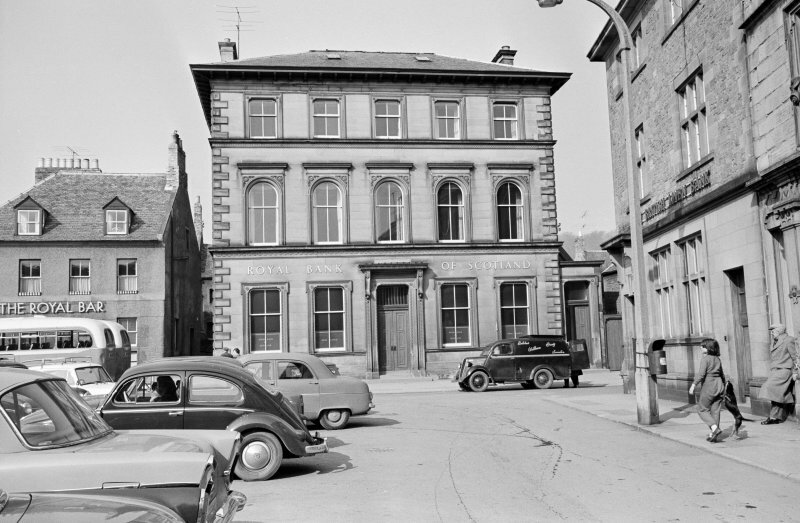 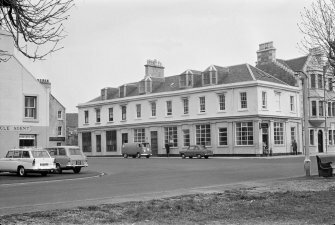 View of Bank of Scotland, 14 Newtown Street, Duns. 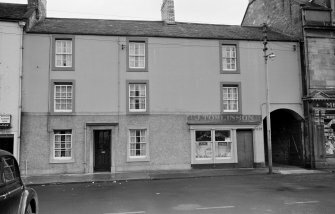 View of 28 Newtown Street, Duns showing the premises of J & M Anderson and the corner to Gourlays Wynd from south west. View of Lamberton Toll House from NE with adjacent cottage. 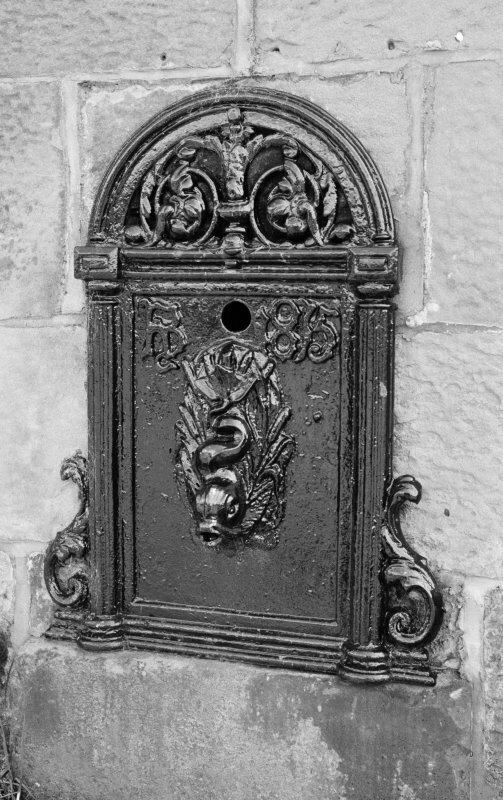 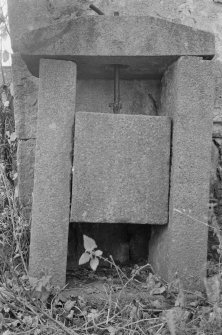 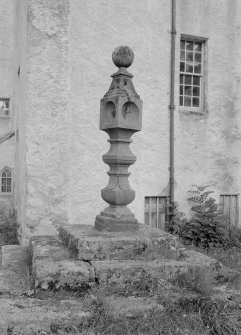 Detail of cast-iron water pump with dolphin spout by entrance to Allanton Old Fire Station. 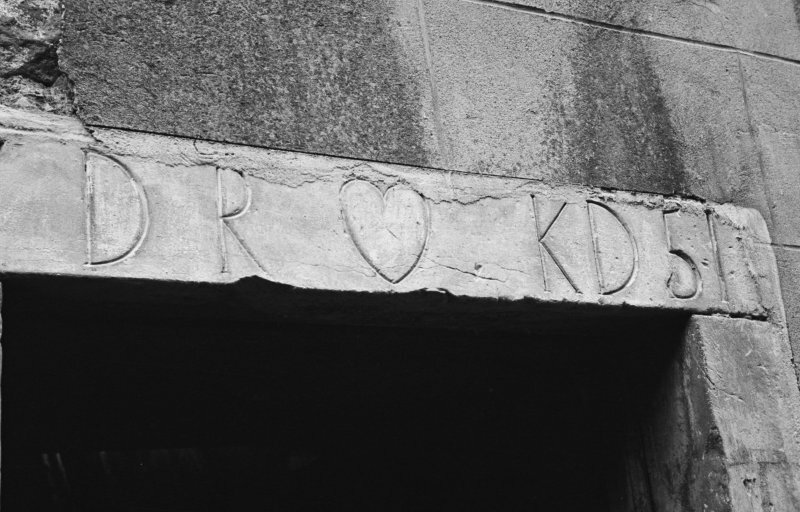 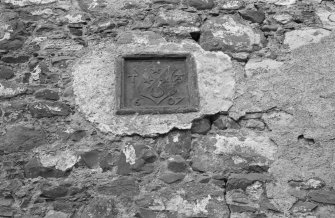 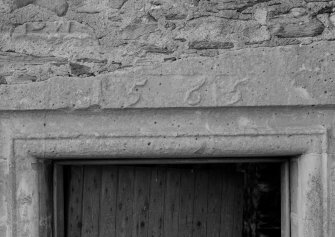 Detail of marriage lintel above entrance to house on Main Street, Abernethy, dated 1751 and initials 'D R K D'. 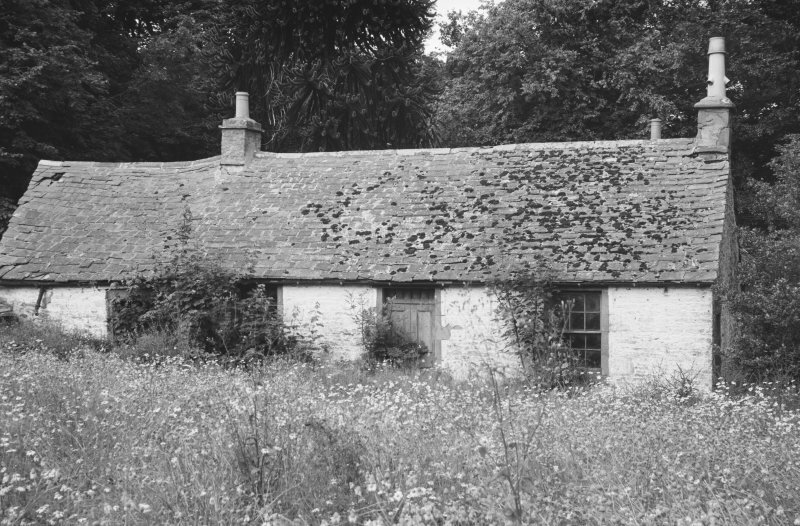 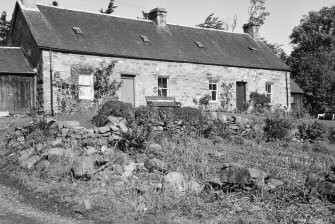 View of thatched roofed cottage in state of disrepair, Back Dykes, Abernethy. Demolished 1966. 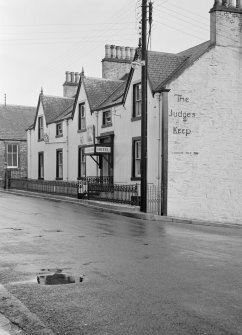 View of Judge's Keep Hotel, 20 Main Street, Glenluce from west. 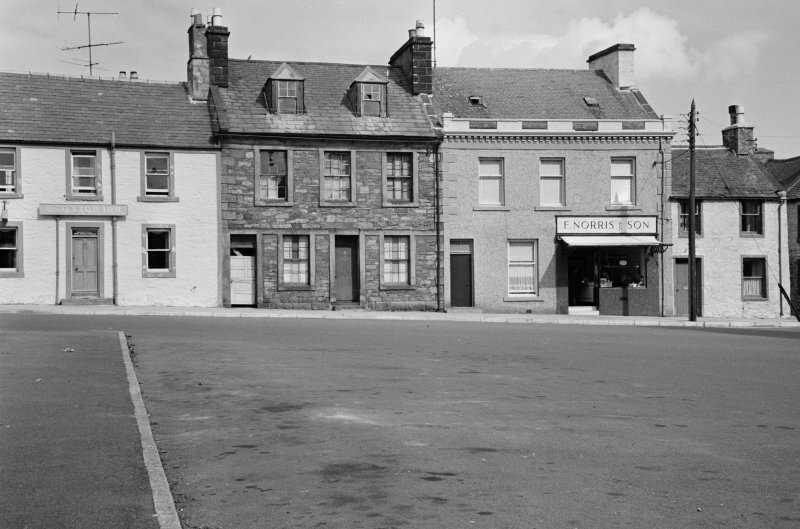 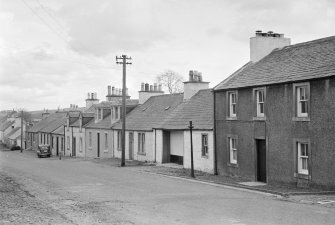 View of Main Street, Glenluce showing Ardville and the premises of a photography shop and John McHarrie, joiner and funeral undertaker, from east. 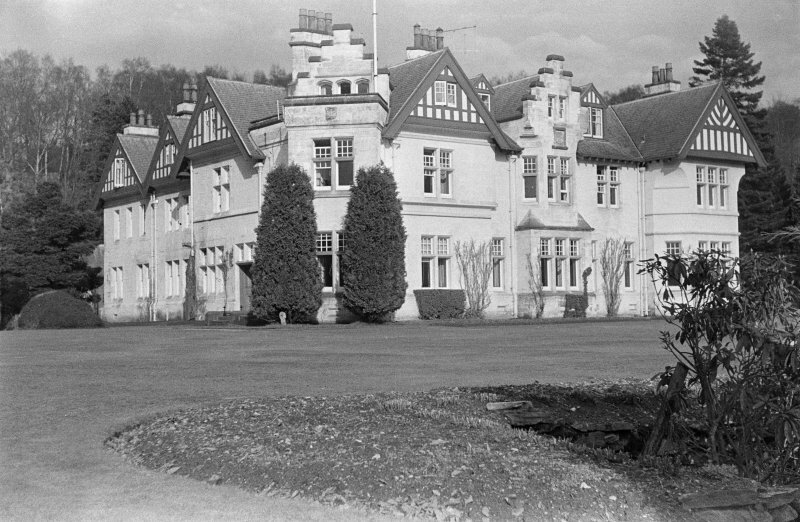 View of Beechgrove and Dovecot House, Pleasance, Falkland, from NW. View of west elevation, Auchenbowie House. 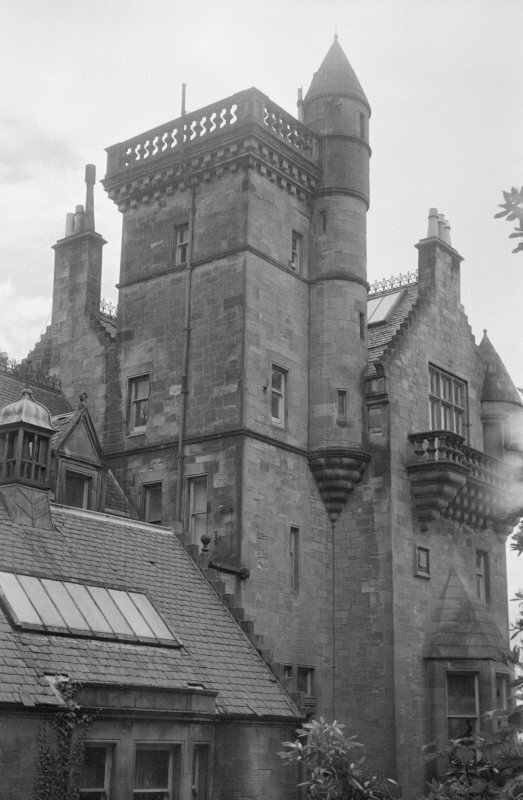 Detail of stair tower in re-entrant angle showing original entrance doorway, Auchenbowie House. 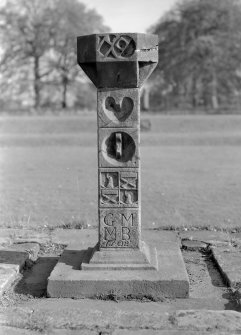 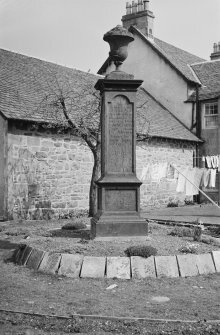 View of sundial in the garden of Auchenbowie House, with initials 'G M M B' and dated 1702. 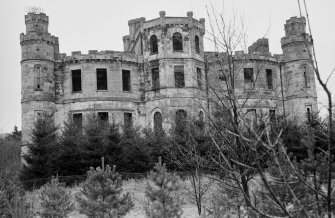 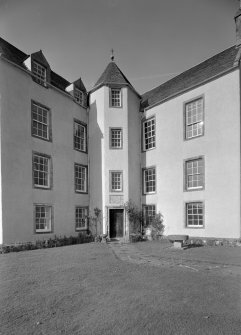 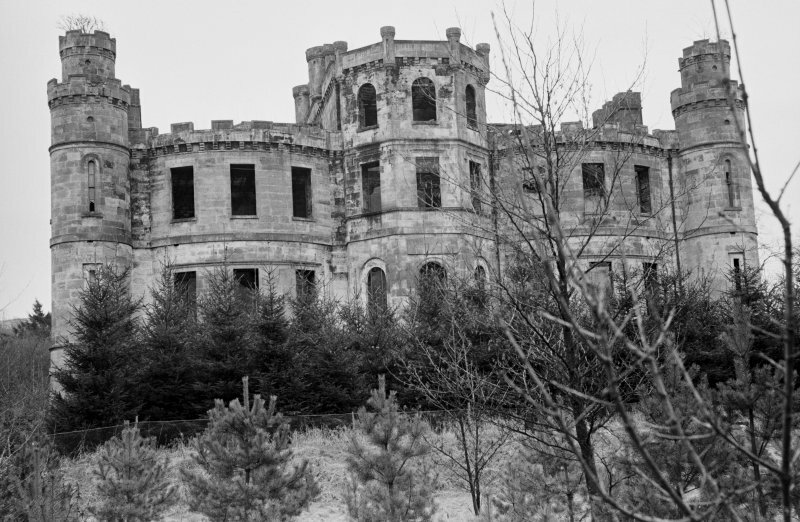 View of main block from NE, showing Governor's House, Jedburgh Castle Jail. 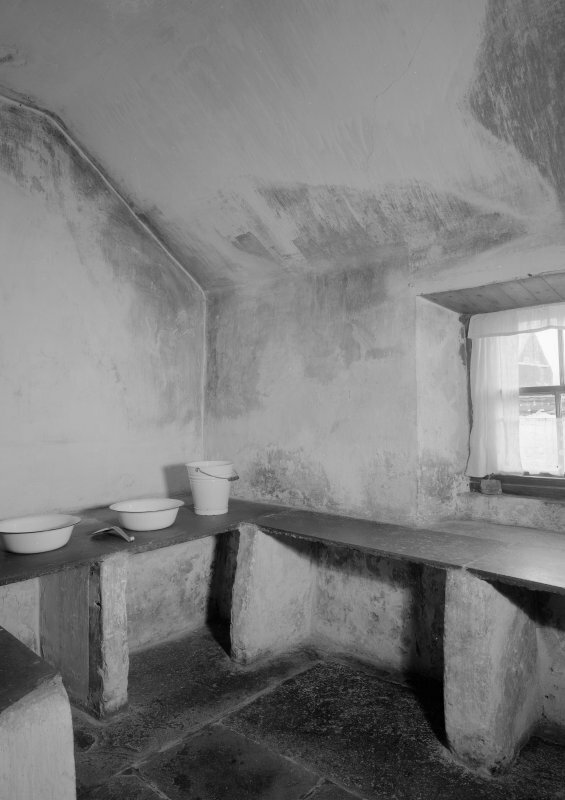 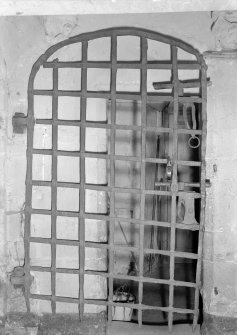 Interior view of corridor in east male block on ground floor, Jedburgh Castle Jail. 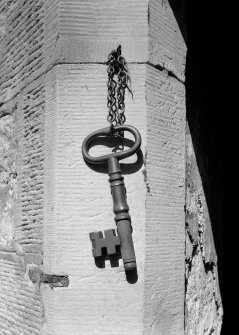 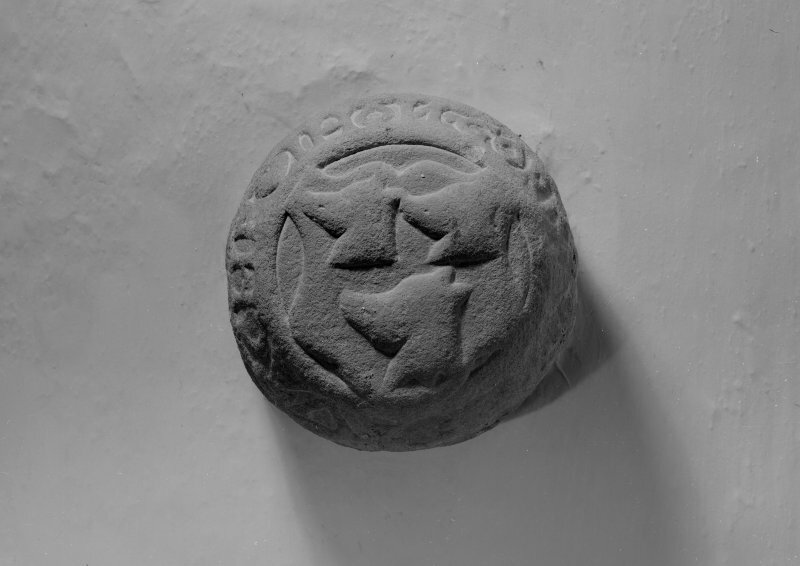 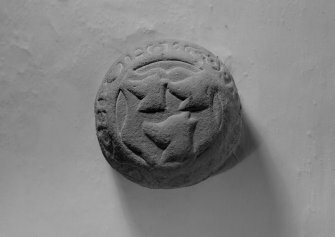 Detail of key to female block, Jedburgh Castle Jail. View of the British Linen Bank, High Street, Jedburgh, from S.
Detail of colonnaded main entrance doorway of the British Linen Bank, High Street, Jedburgh. Detail of armorial panel showing the Otterburn Arms, Redhall House dovecot, Edinburgh. Detail of arches, Ruthven Old Bridge. 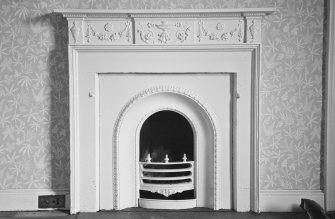 Detail of bedroom chimneypiece, Duddingston Manse, Edinburgh. 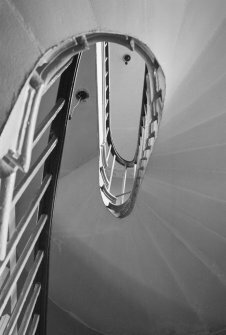 View of main staircase, Duddingston Manse, Edinburgh. 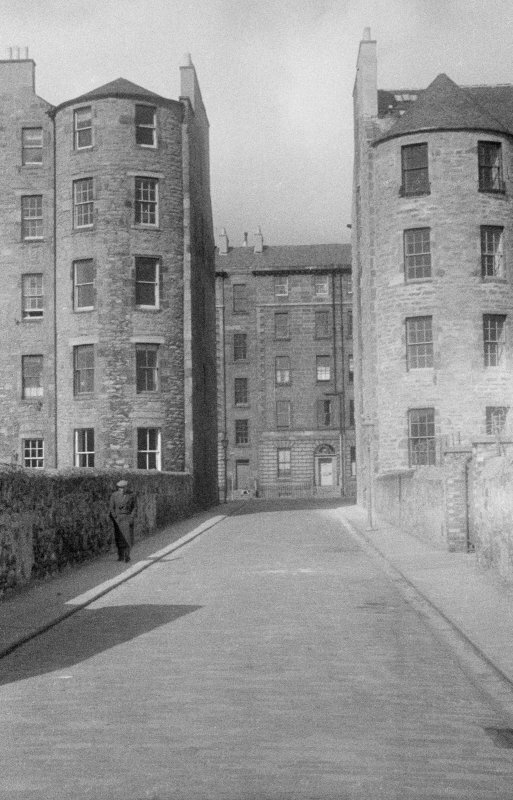 View of the rear of the north side of Buccleuch Place, Edinburgh, seen from the north east from Mews Street. View looking directly along Buccleuch Place Lane, Edinburgh, between the rear of the south side of Buccleuch Place with the north side in the background, seen from the south south east. 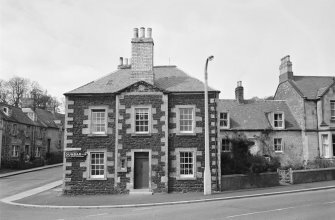 View of the Old Infirmary, Woolmanhill, Aberdeen. 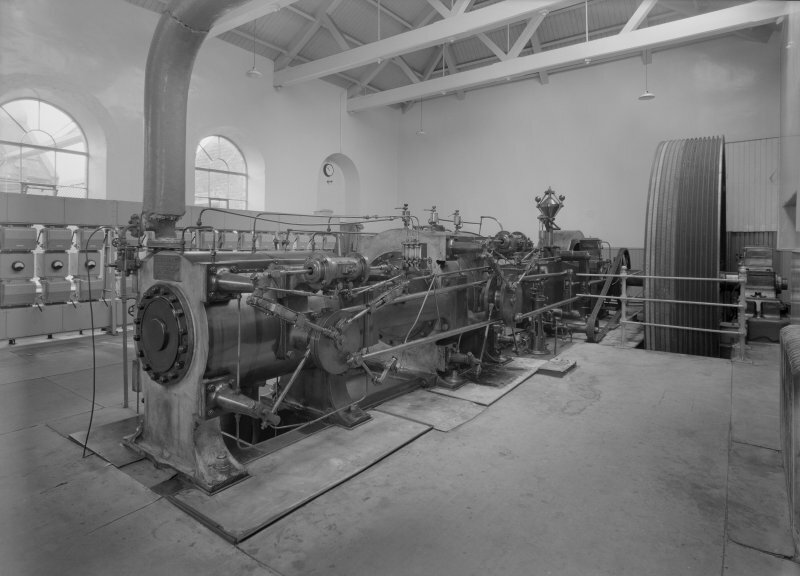 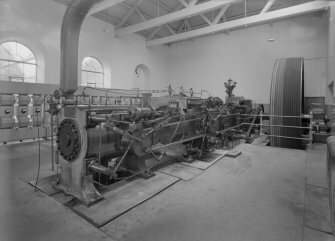 View of the Bolton Corliss Engine, Grandholm Mills, Aberdeen. 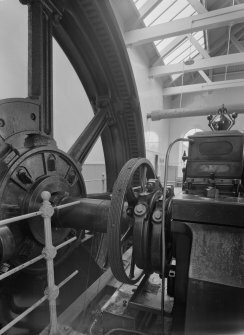 Detail of the Bolton Corliss Engine, Grandholm Mills, Aberdeen. View of Auchanachie Castle from south west. 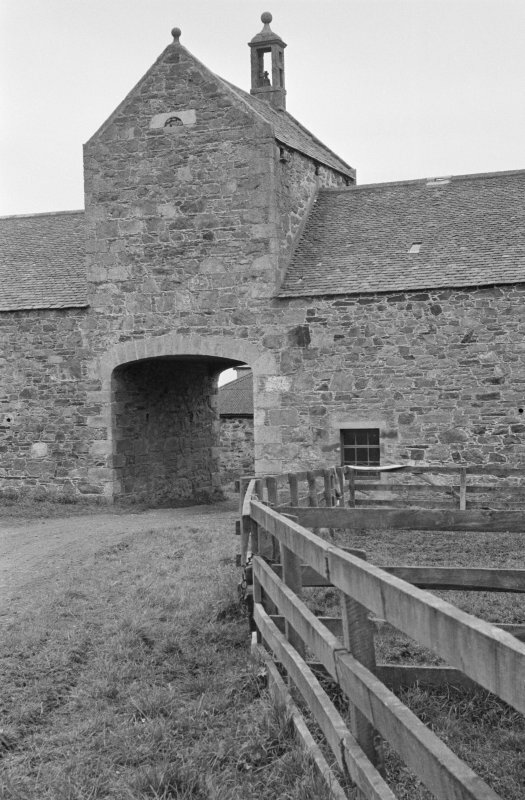 View of entrance door with lintel above, Auchanachie Castle. 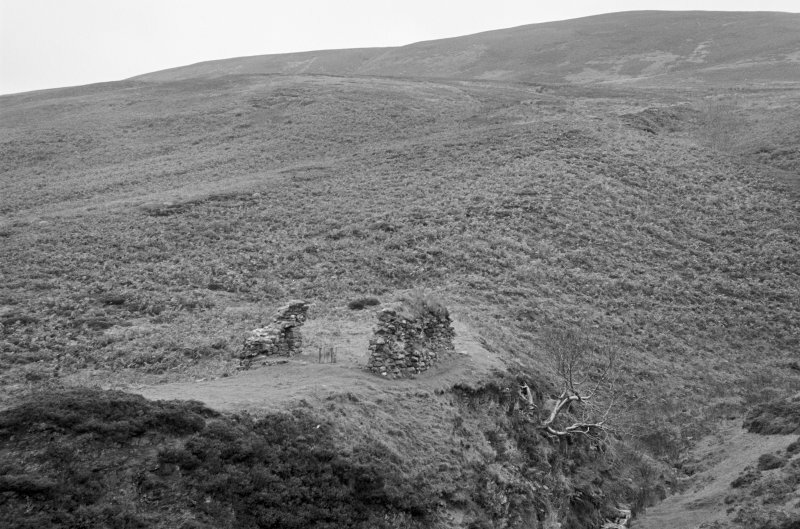 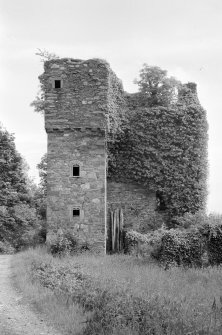 View of larder, Auchanachie Castle. Detail of carved roof boss in vaulted apartment in the tower, Auchanachie Castle. 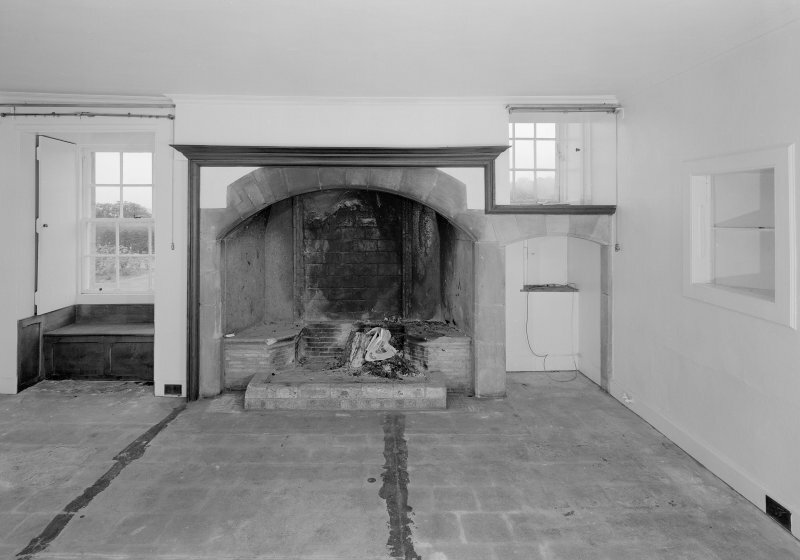 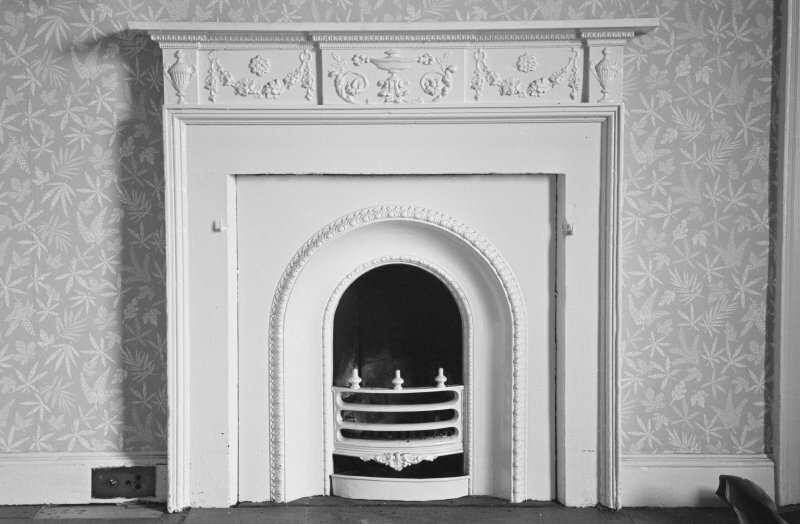 View of fireplace in original kitchen of 17th century house, Auchenbowie House. View of library on second floor, Auchenbowie House. 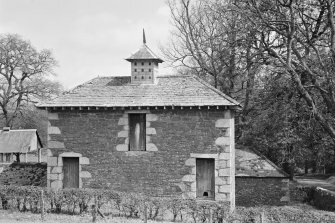 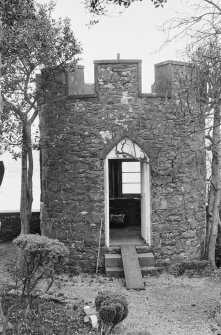 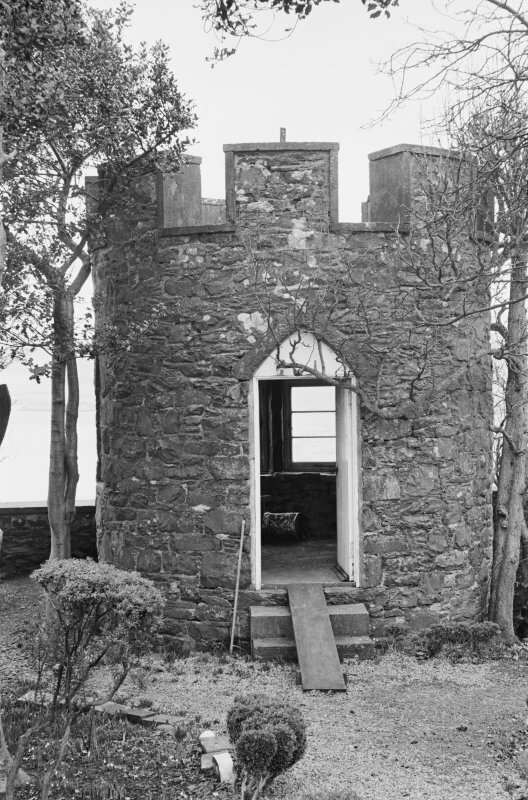 General view of dovecot, Durn House. 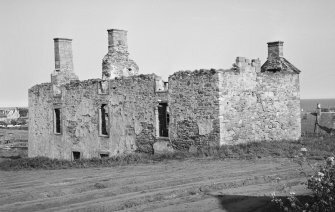 View of Castle of Hallforest from SW.
General view of Inverallochy Castle. 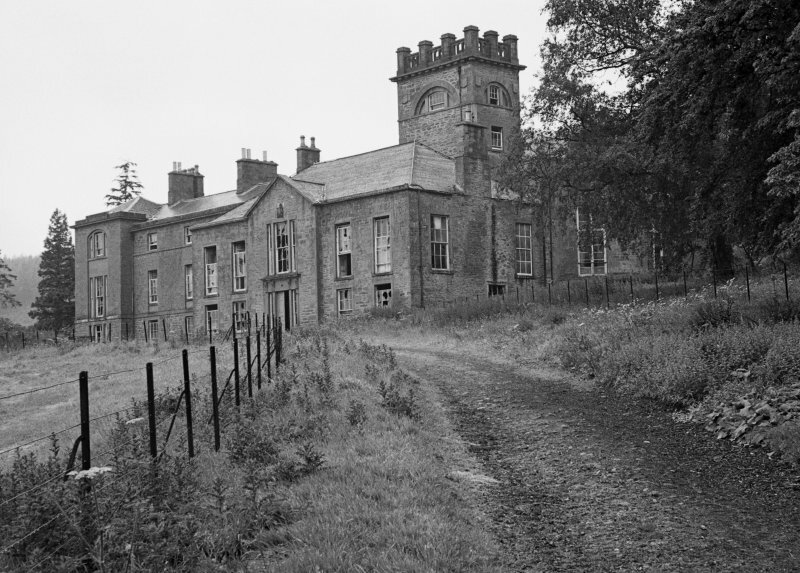 View of Ravenstone Castle from SW.
View of rounded S end of cottage by walled garden, Parton House. 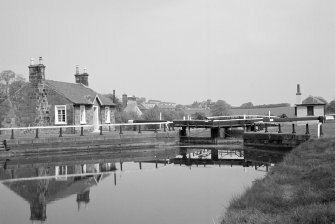 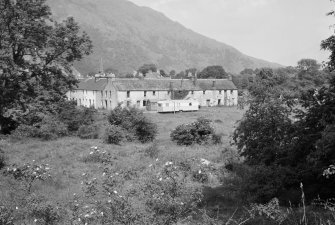 View of Parton Village from SE showing the Post Office. 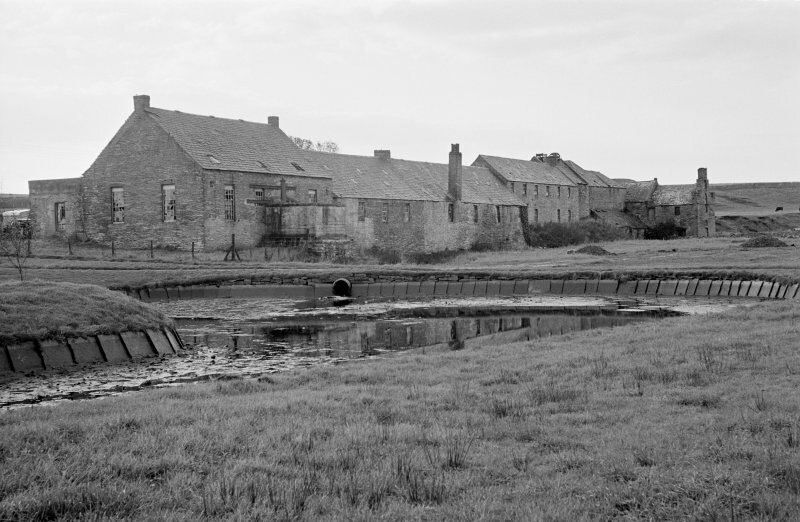 View of Gelston Castle saw mill from W showing watersheel. 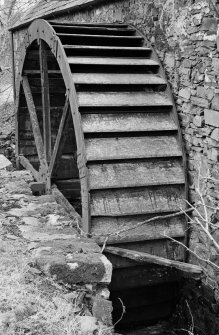 Detail of waterwheel, Gelston Castle saw mill. 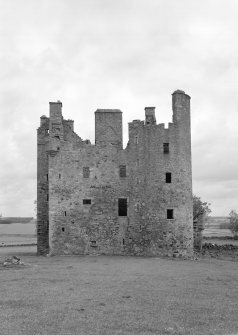 View of Gelston Castle from SE. 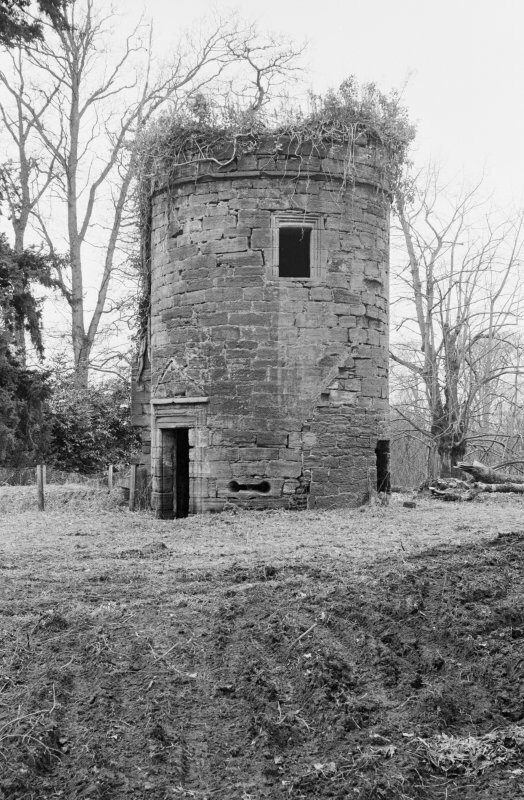 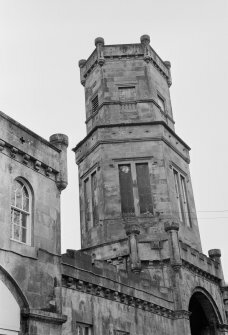 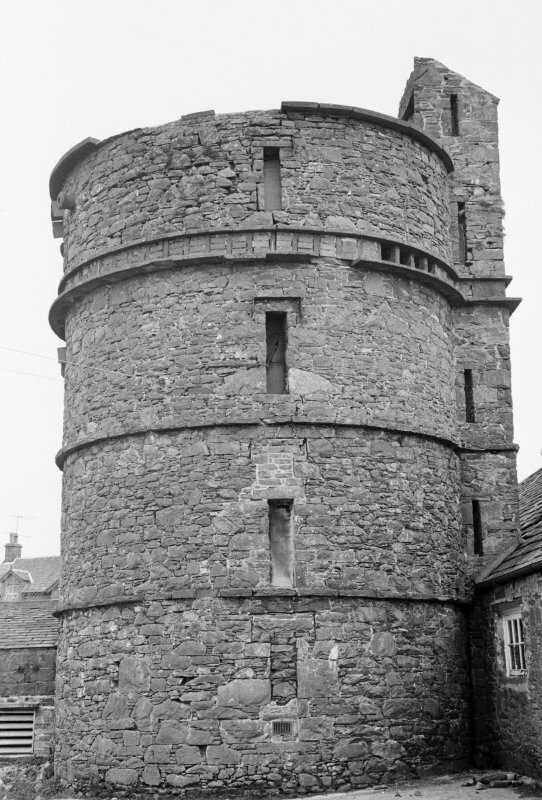 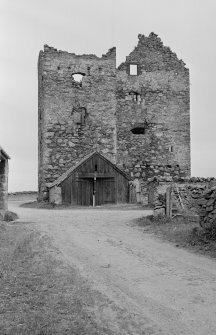 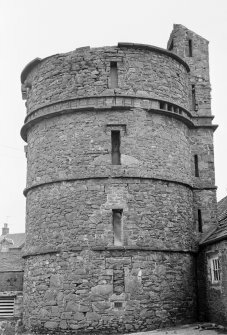 Detail of entrance tower, Gelston Castle. 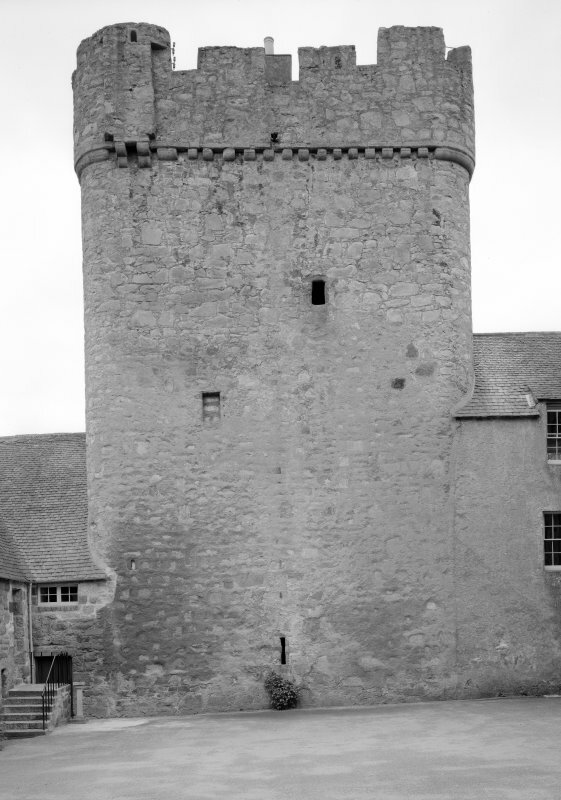 View of Drum Castle tower. 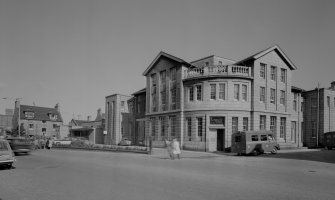 View of 2 Main Street, Carrington, from north east. View of Grange House from south west. 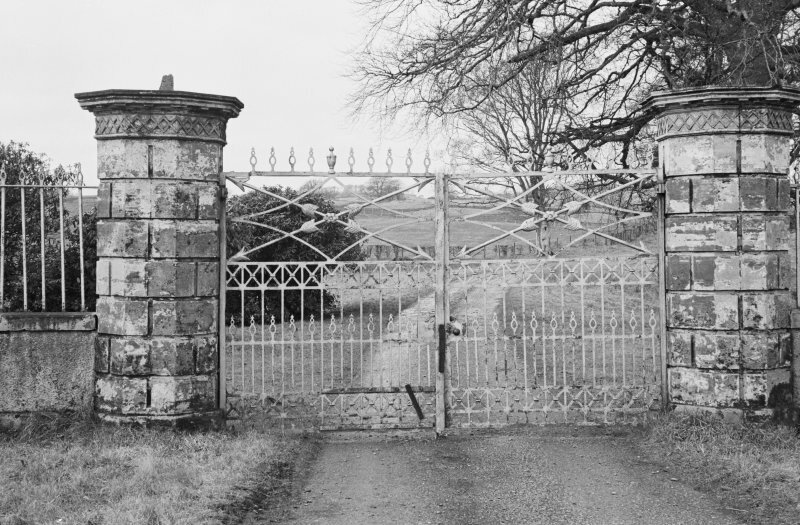 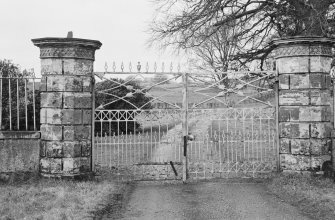 Detail of central vehicular gates and gate piers, Mollance House. 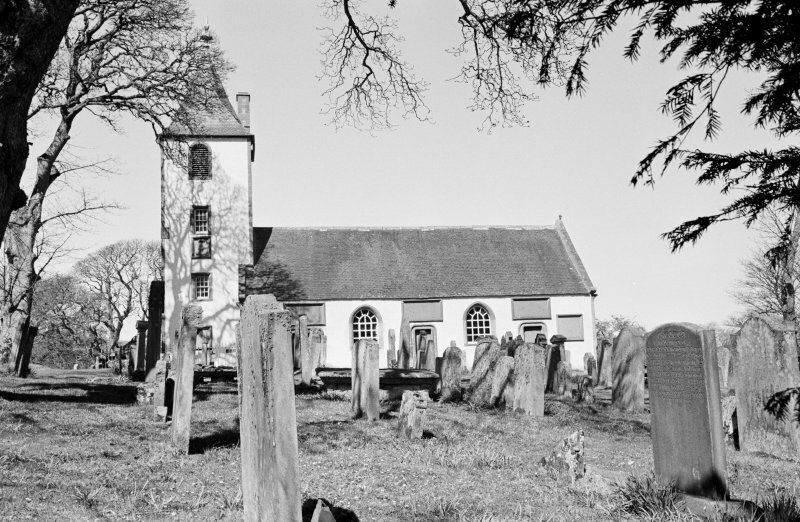 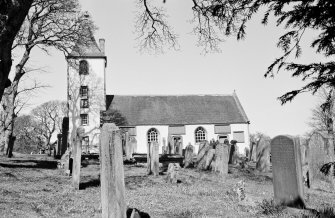 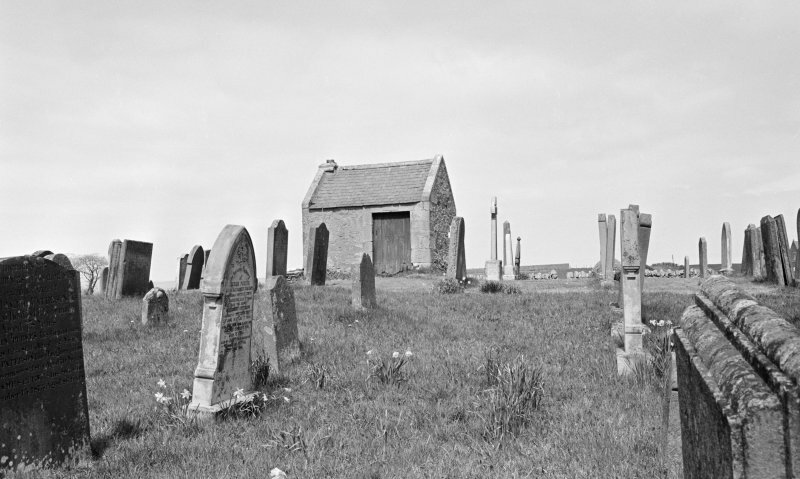 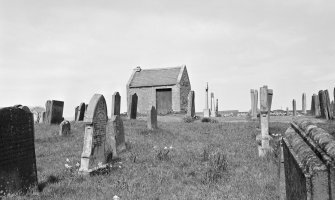 General view of Whitsome Old Parish Churchyard and watchhouse. View of cottages in Crovie village. 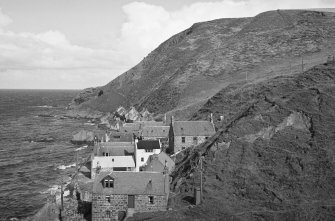 Elevated view of coastal cottages in Crovie village. 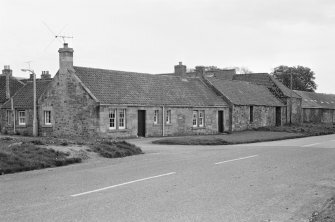 View of smithy and cottage, Clappers, from S.
General view of Greenbank dovecot. 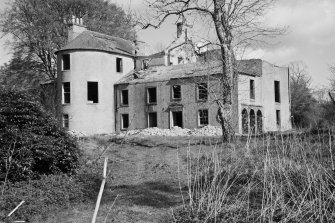 View of Ninewells House from W during demolition. 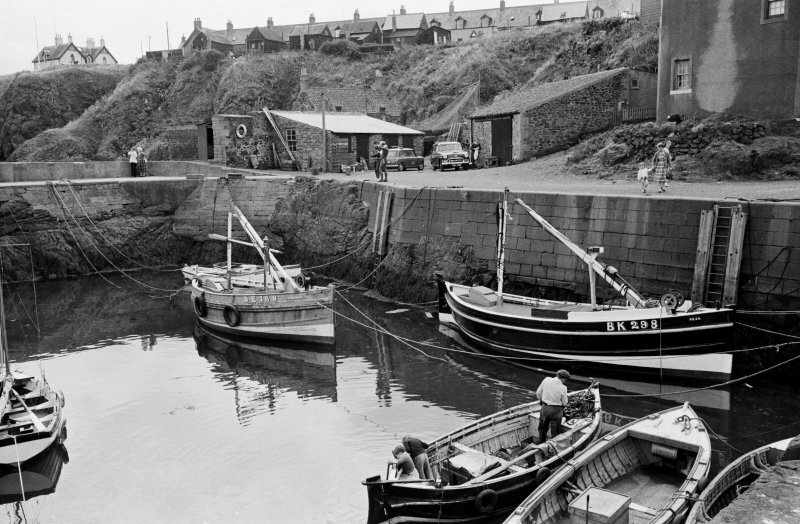 View of warehouse at 10 Shorehead and harbour wall, Portsoy. 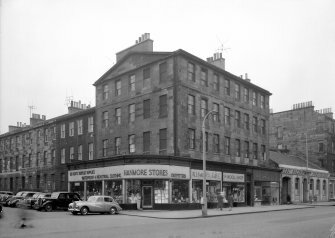 View of the bridal shop, Daly's Department Store, Sauchiehall Street, Glasgow. 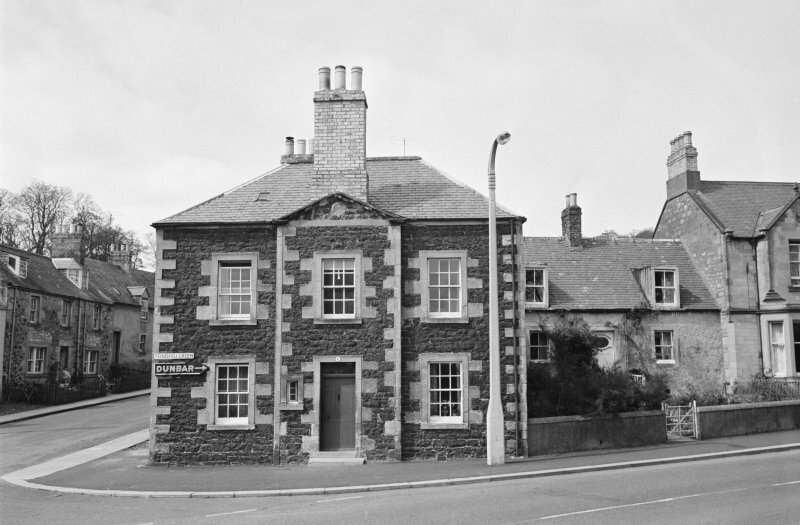 View of the Old Infirmary, Woolmanhill, Aberdeen, from south east. 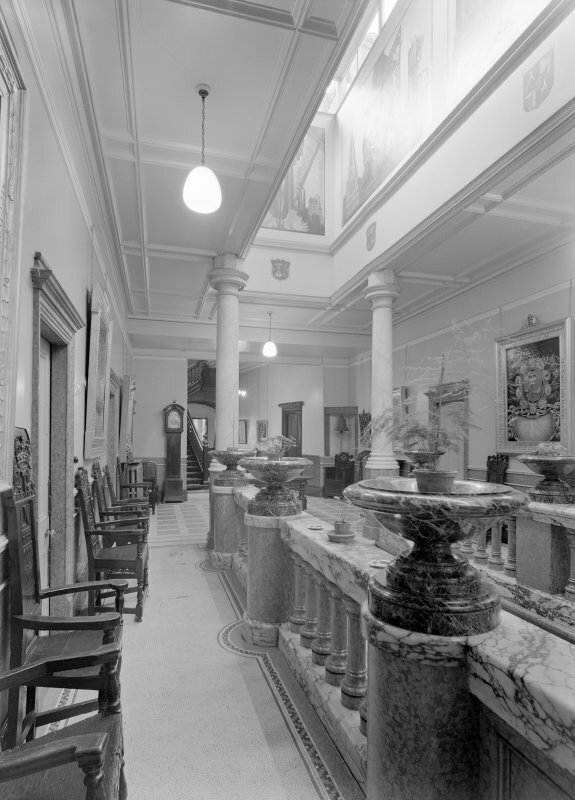 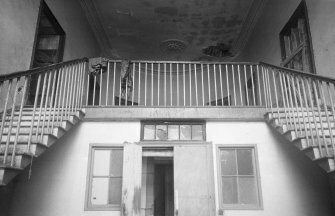 Interior view of Trinity Hall, Union Street, Aberdeen, showing main entrance hall. 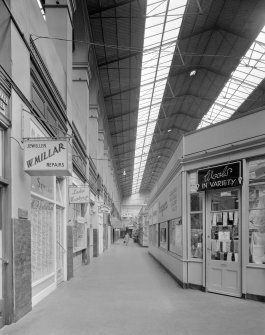 Interior view of Aberdeen Market, Market Street, Aberdeen. 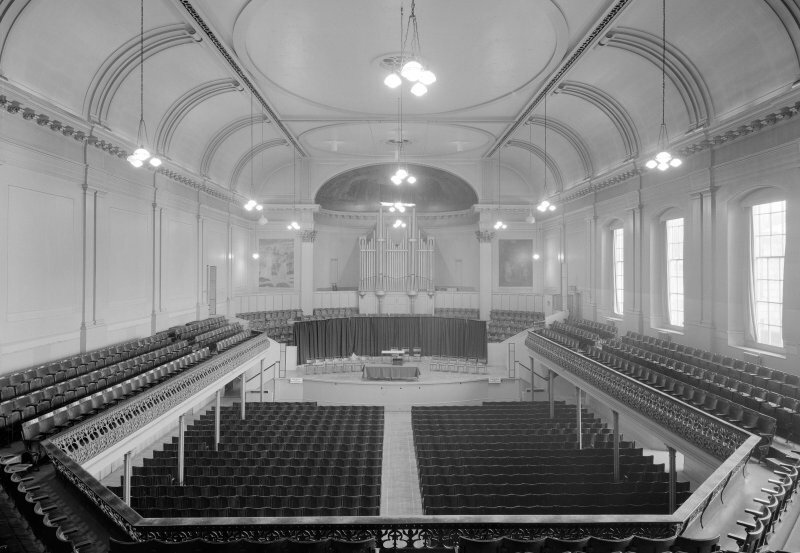 Interior view of the Music Hall, 174-194 Union Street, Aberdeen, showing the auditorium from balcony. 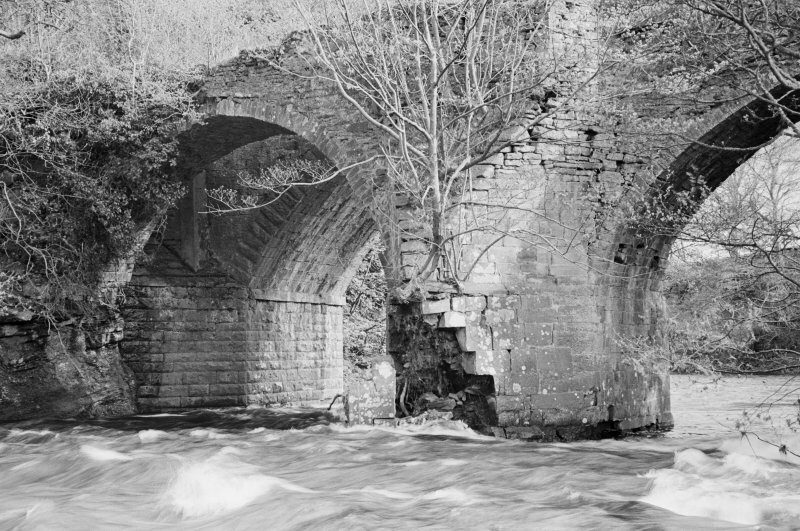 General view of Old Nevis Bridge, Fort William, showing span across River Nevis. 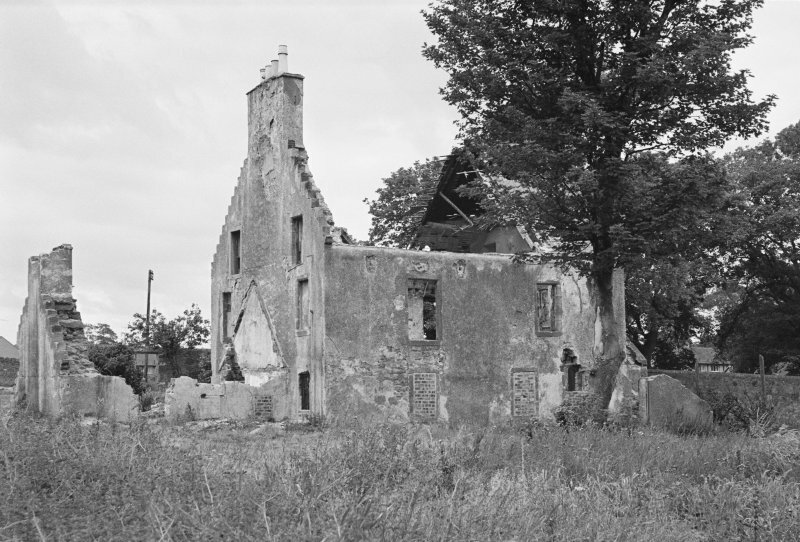 View of front elevation of Dorlin House, showing house in ruined condition. 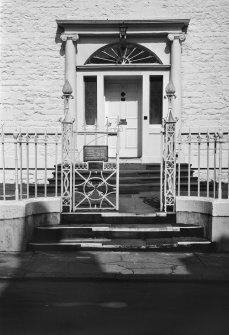 Detail of entrance to Logan House. 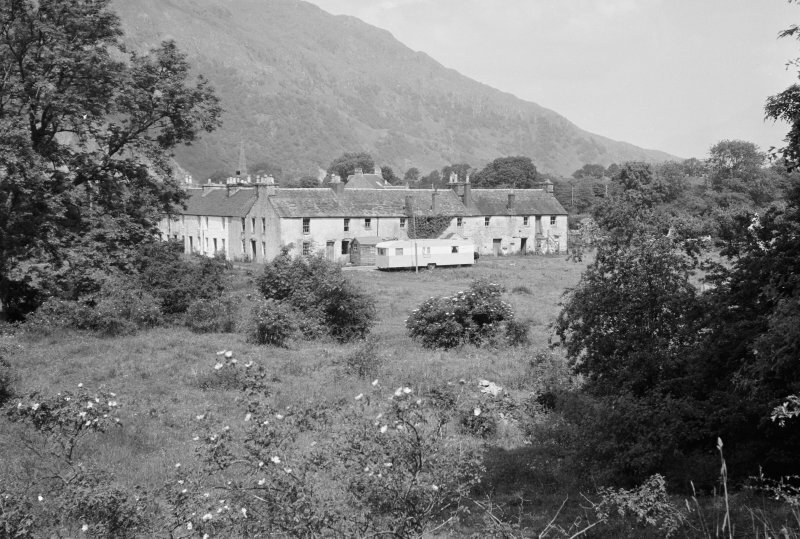 General view of the remains of Howlet's House, Glencorse, from E.
View of Inverclyde House, Cove, from W.
View of south elevation of Cove House. 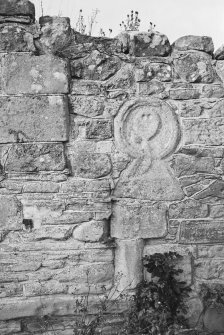 Detail of carved stones incorporated into wall of Lennel Old Parish Church. View of the Old Prison, Dunblane, from south. View of 95 High Street, Dunblane from south east. 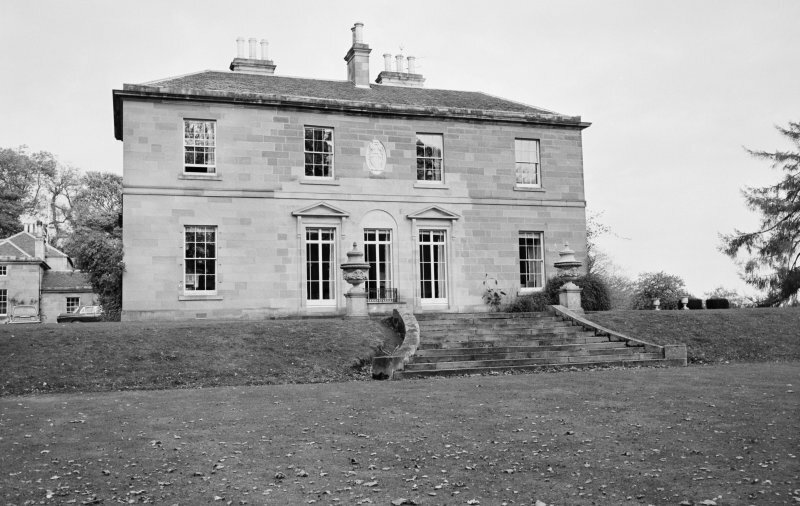 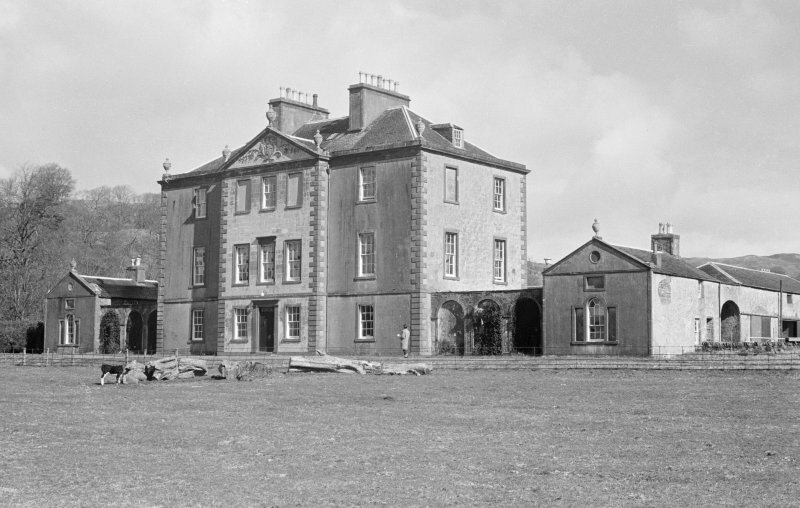 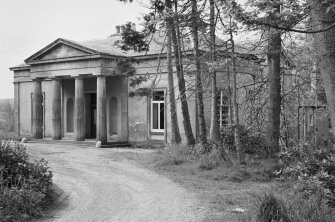 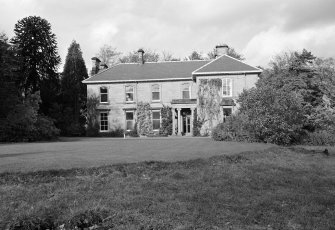 General view of Woodhouselee from south east showing principal front and side elevation. 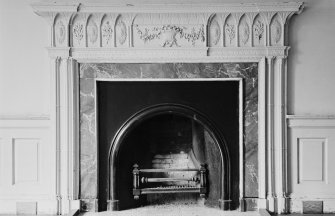 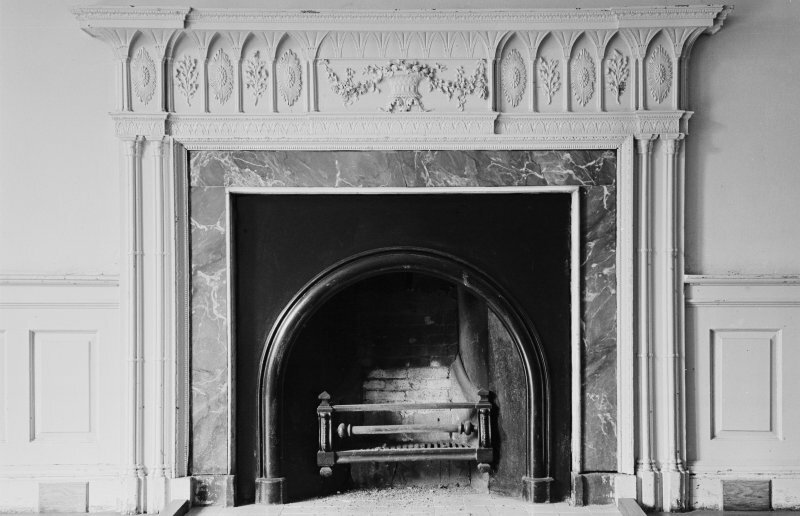 Interior view of Woodhouselee showing detail of fireplace. 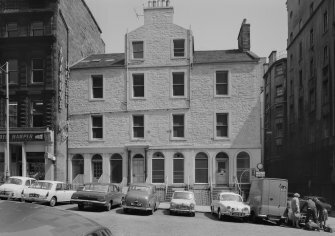 General view of Crimonmogate House, Union Street, Aberdeen. 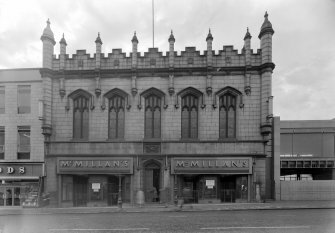 View of Trinity Hall, Union Street, Aberdeen, showing Union Street facade and McMillan's. 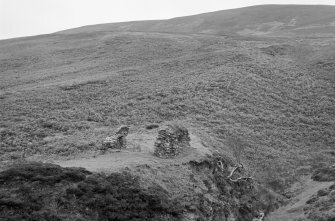 General view of the remains of Dalswinton Old House. View of pump, Murroes Manse. View of Midmar Castle from south east. 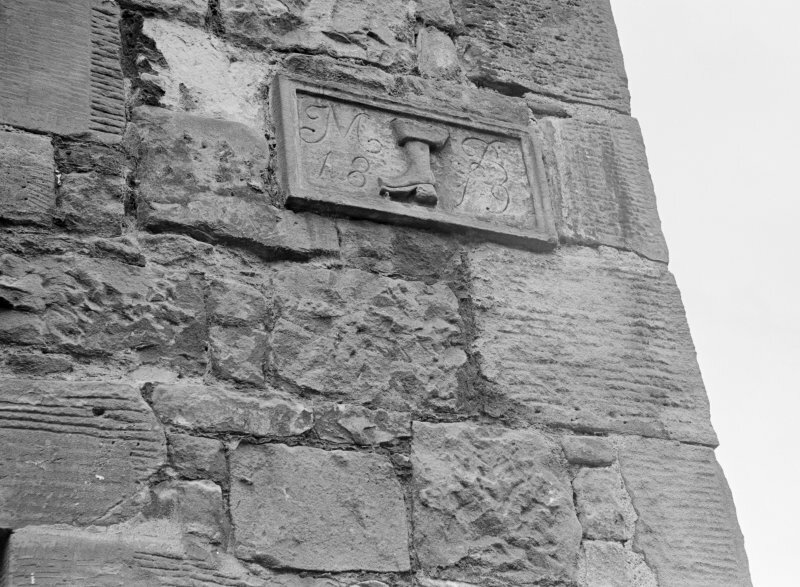 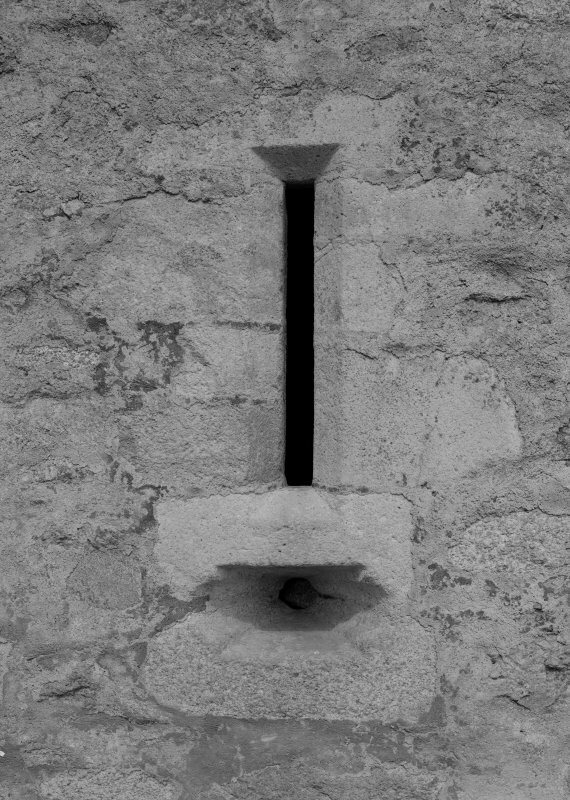 Detail of sundial, Midmar Castle. 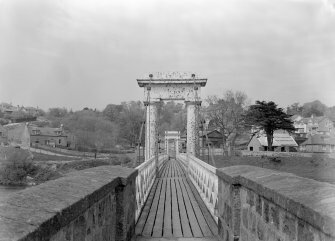 View of suspension bridge, Cults, Aberdeen, showing approach from S and suspension columns. 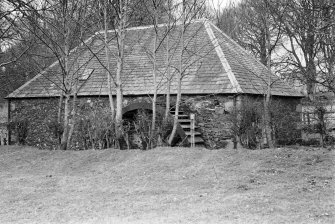 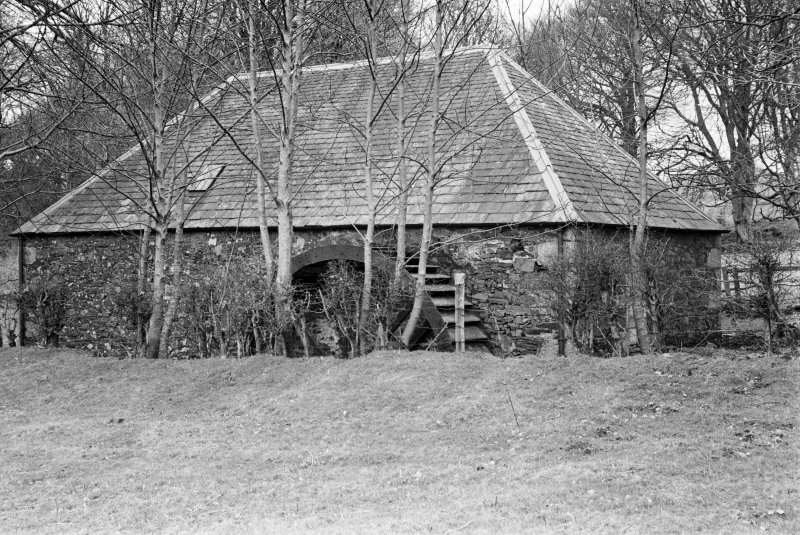 View of Westhall House from W.
View of cheese press, Kirkton of Glenbuchat Old Manse. 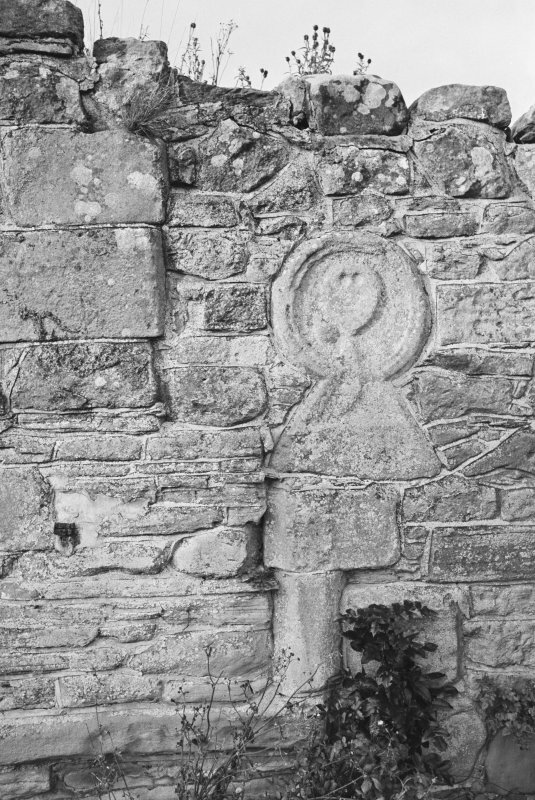 Detail of carving in courtyard, Craig Castle. 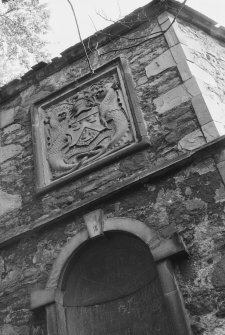 View of heraldic panels in courtyard, Craig Castle. 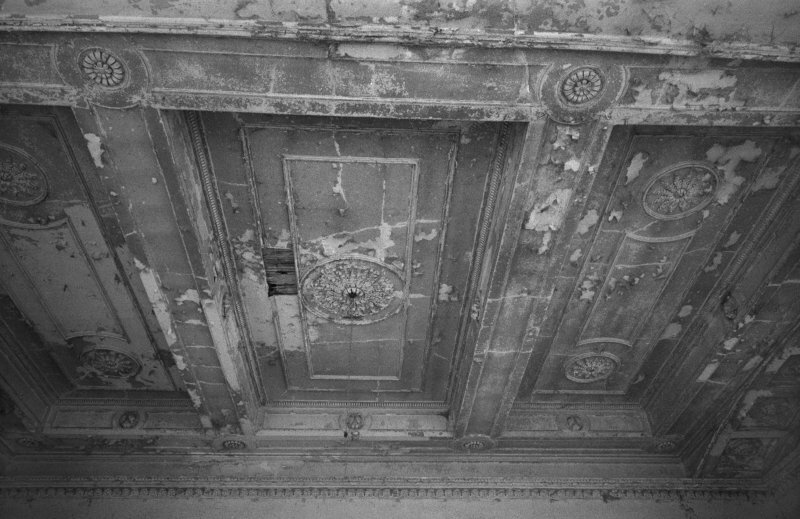 Interior view of Craig Castle showing detail of yett. View of Braemar Castle from south west. 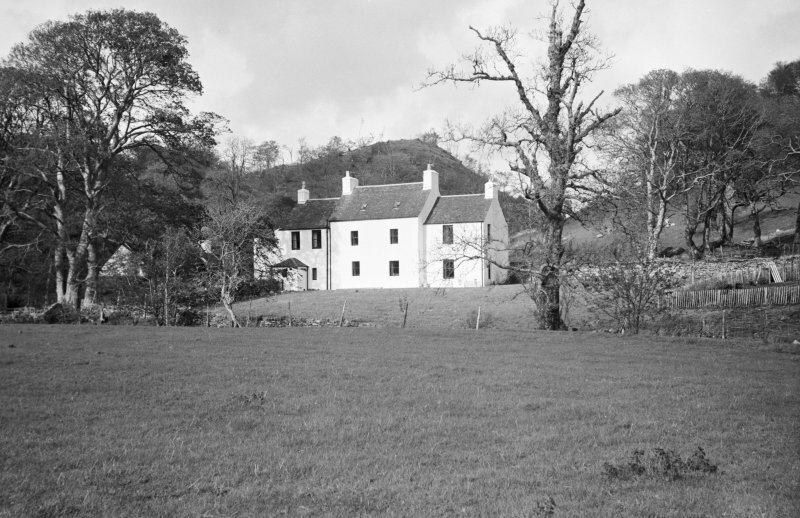 View of Corsindae House from south east. General view of Hunter's Lodge, Mormond Hill. 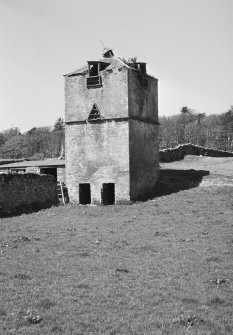 View of Mountblairy home farm showing pend and tower with belfry and dovecot. 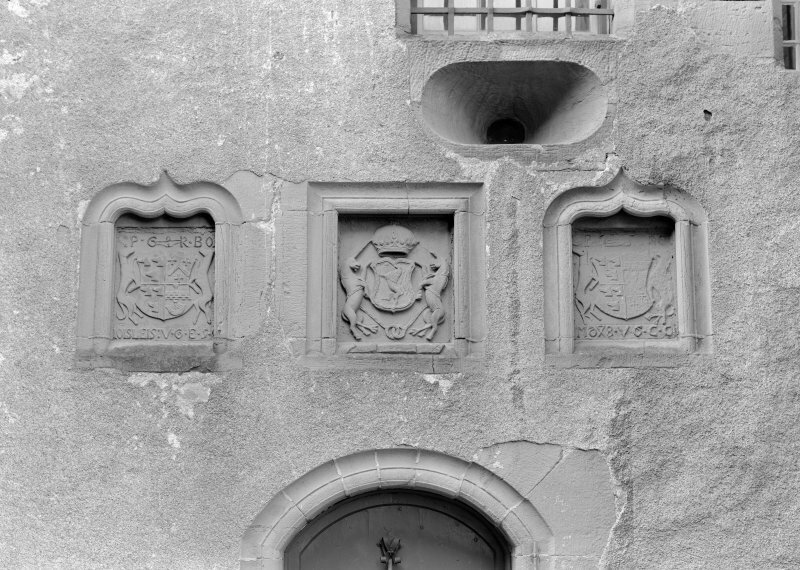 View of pediment with coat of arms, Woodhouselee. 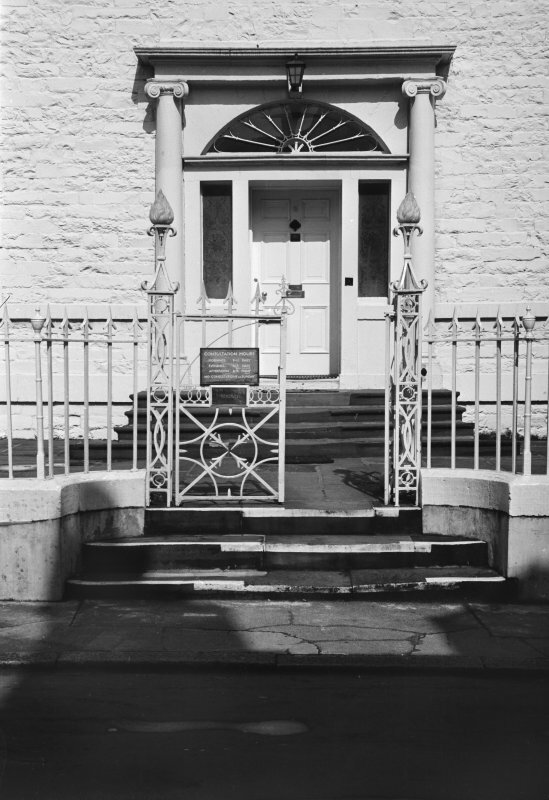 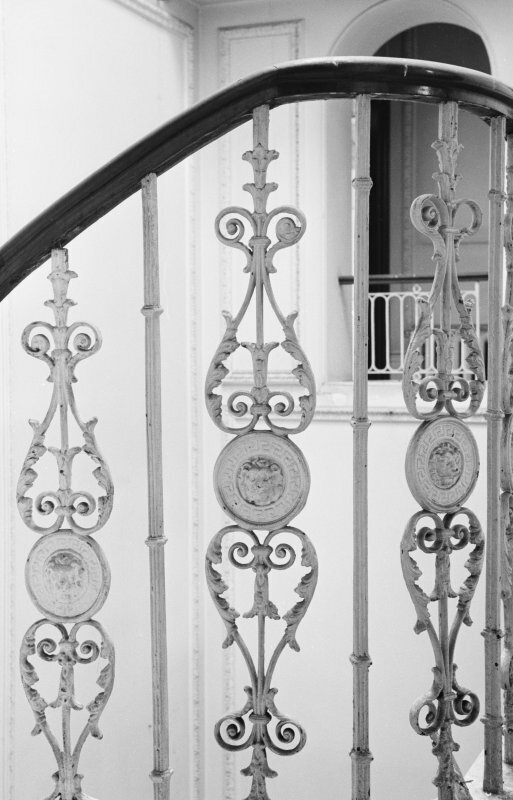 Detail of SE elevation showing main entrance, iron railings and gates, Blair House, 8 High Street, Kirkcudbright. 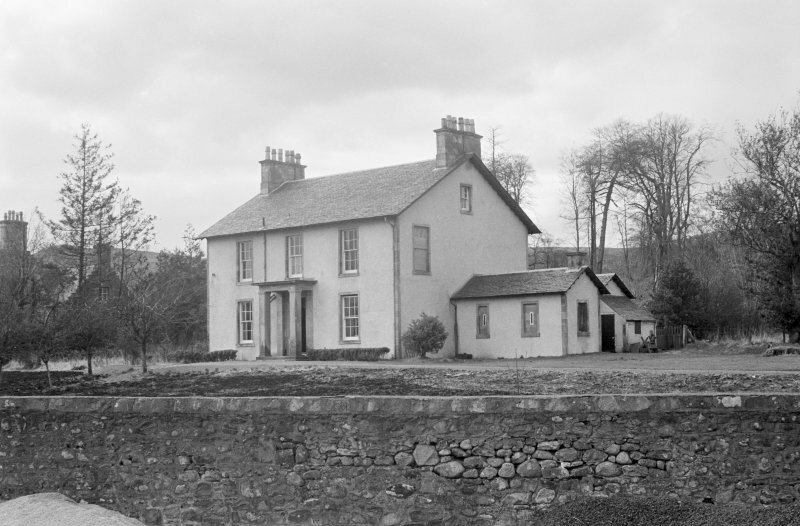 View of house at Castlehill, opposite West Lodge, Kirkton, Dunnichen, from SE. 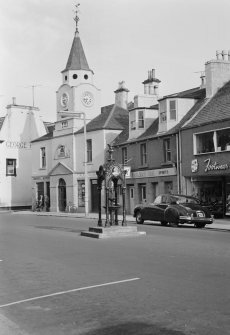 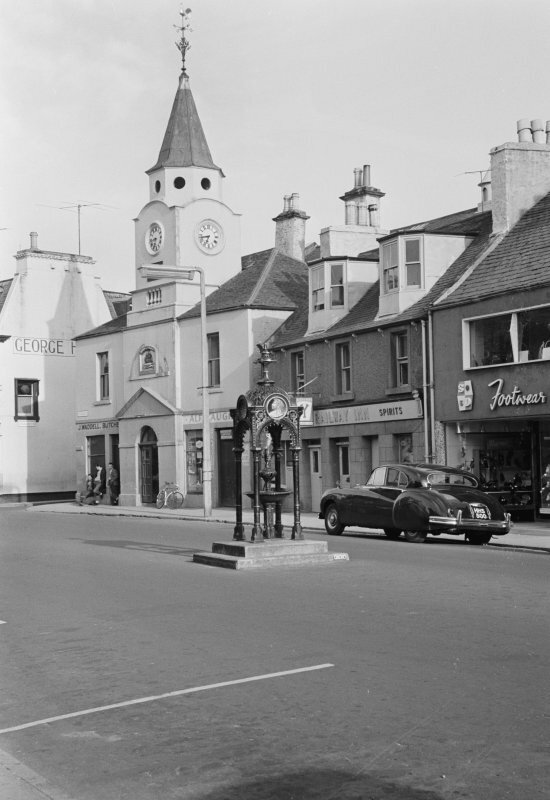 View of gazebo, Blair House, 8 High Street, Kirkcudbright, from SE. 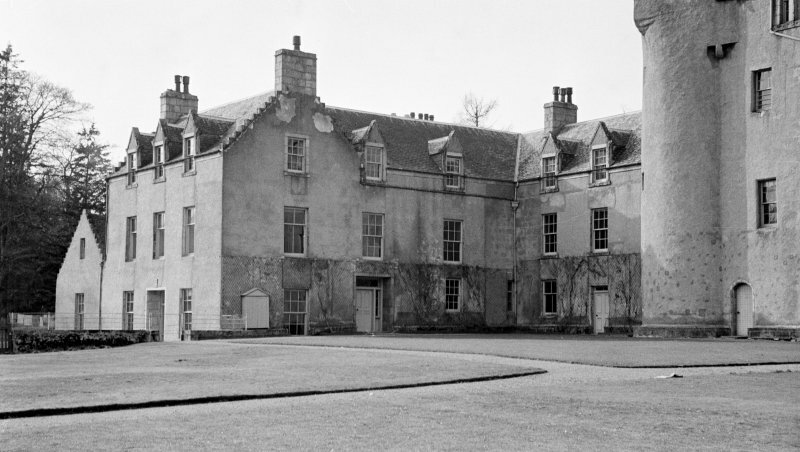 View of Easter Livilands House, Stirling, from south east. View of cottage in Inver village. 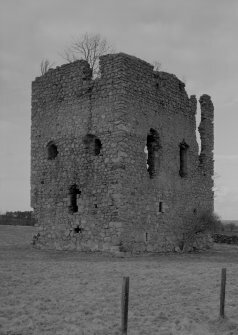 View of Harthill Castle from SW. 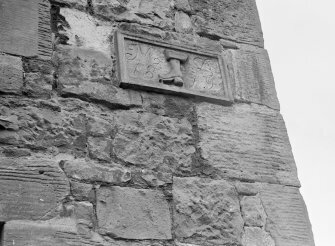 Detail of gun loop by the entrance to Harthill Castle. 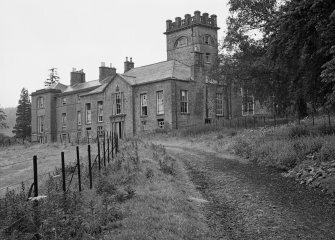 View of Knockhall Castle from SE. 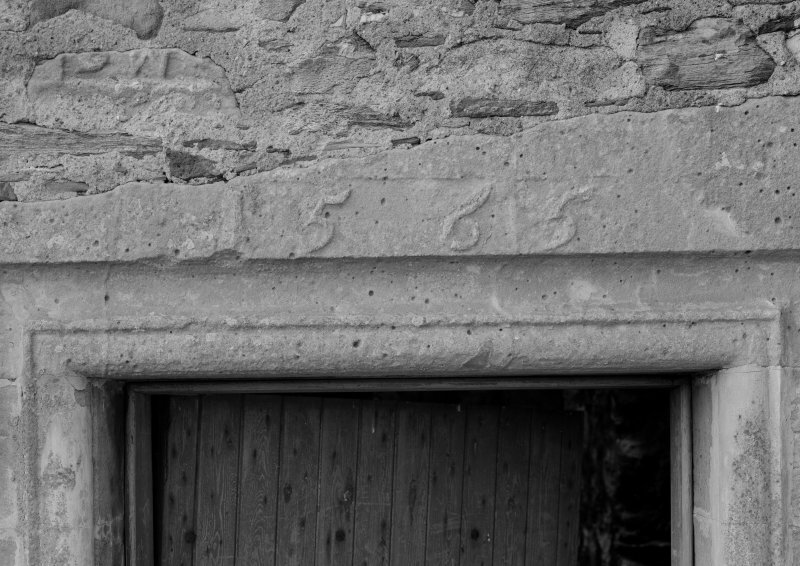 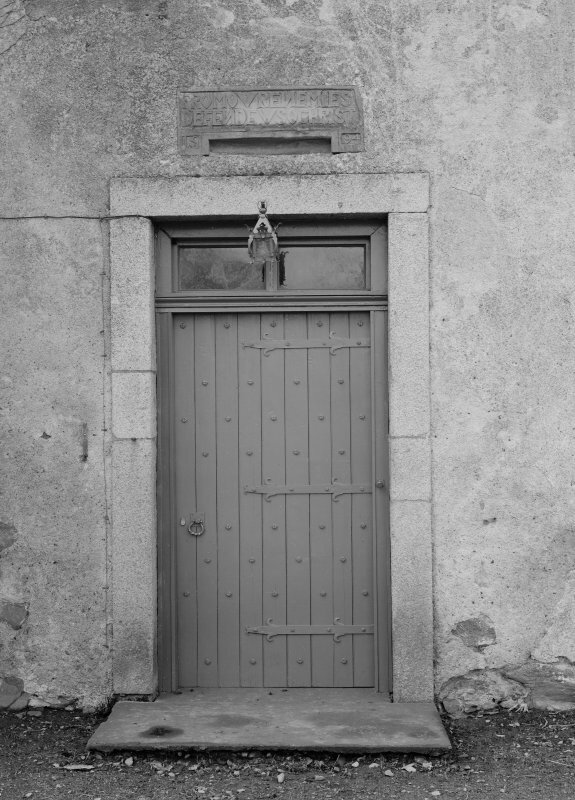 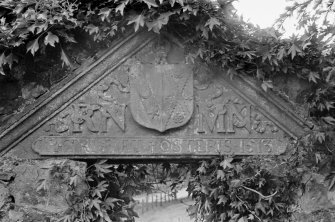 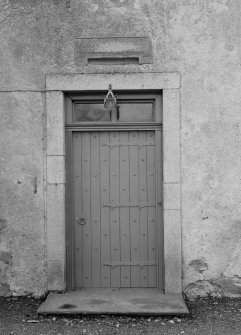 Detail of date 1565 over entrance doorway, Knockhall Castle. View of Lickleyhead Castle from W.
Interior view of Lickleyhead Castle showing the drawing room with fireplace. 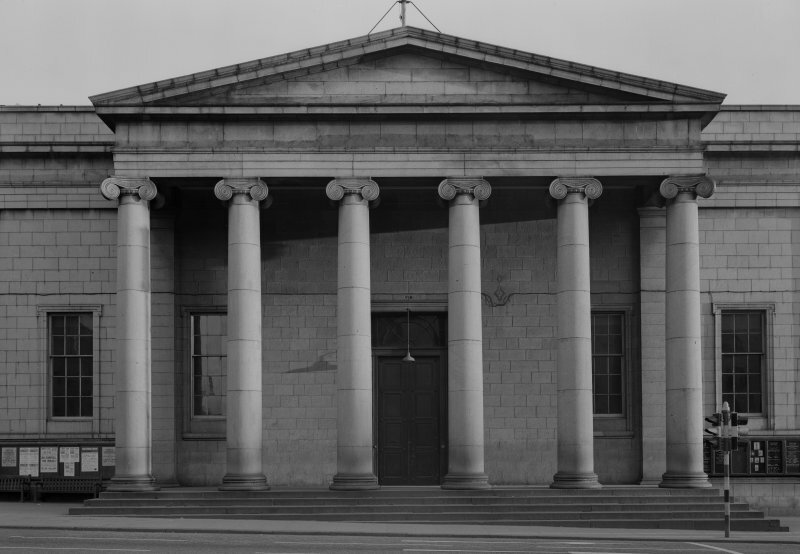 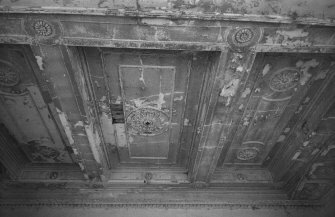 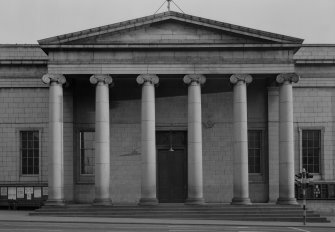 View of the Music Hall, 174-194 Union Street, Aberdeen, showing detail of portico with Ionic columns. View of the front facade of 30-32 Buccleuch Place, Edinburgh, seen from the South East from first floor level with the David Hume Tower under construction in the background.